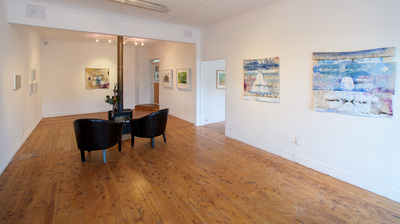 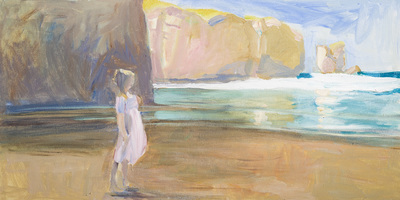 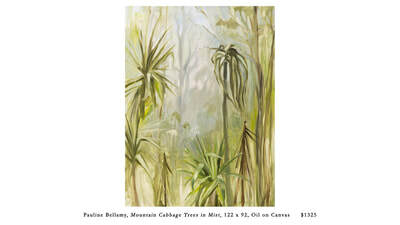 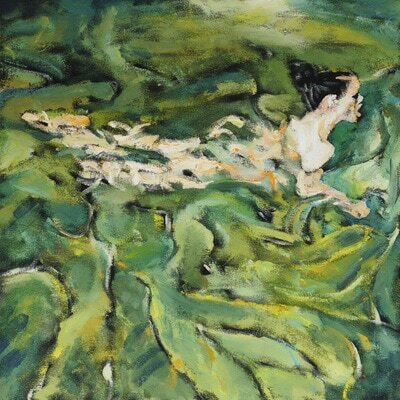 This exhibition will not be at Bellamy's Gallery, but at OLGA Gallery, 32 Moray Place. Walk Through the Fall brings together new works across media that reflect on a personal journey of becoming. 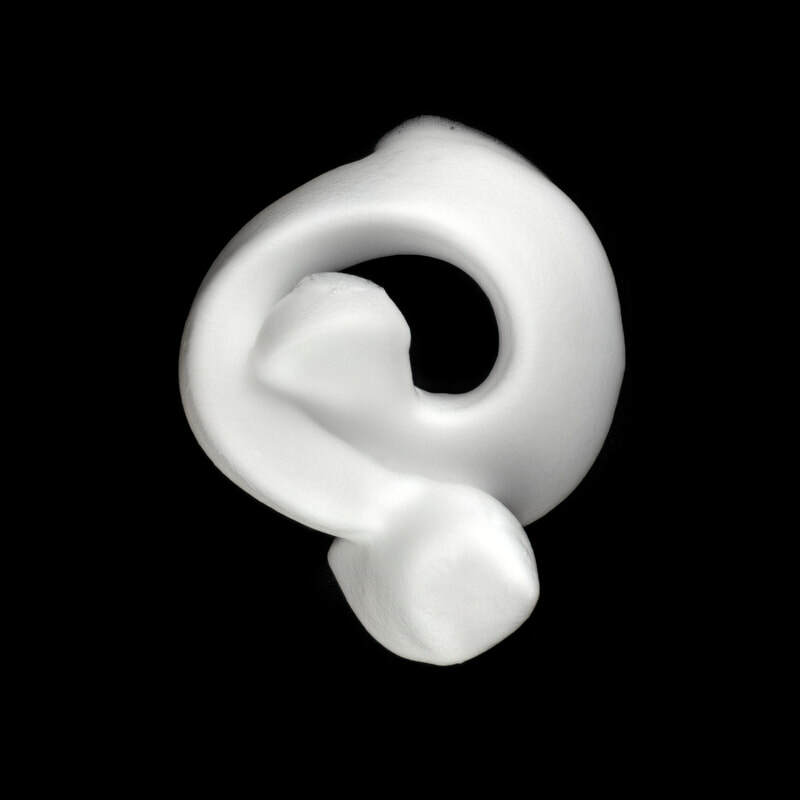 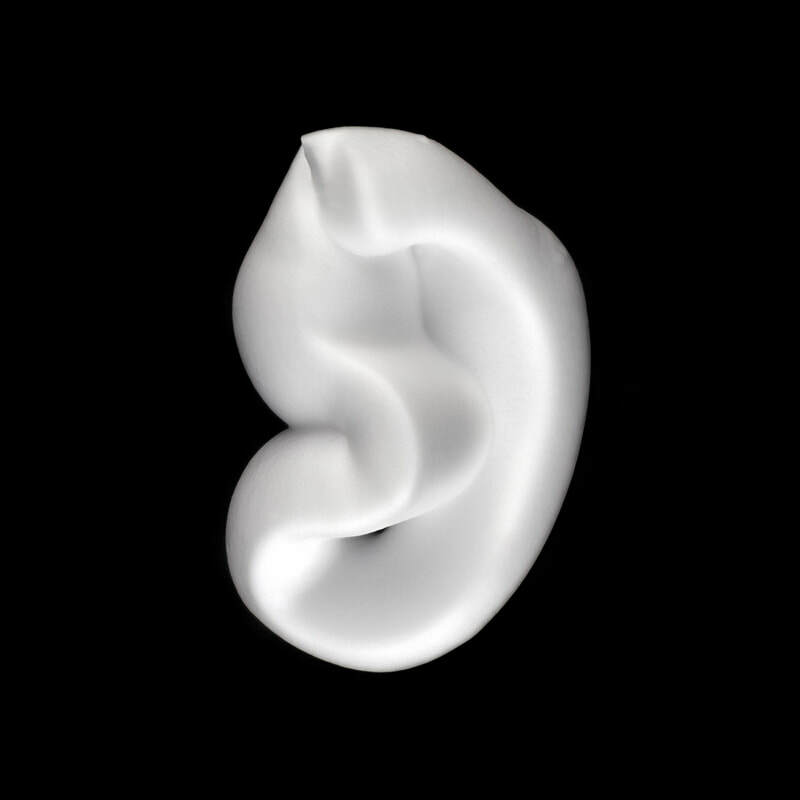 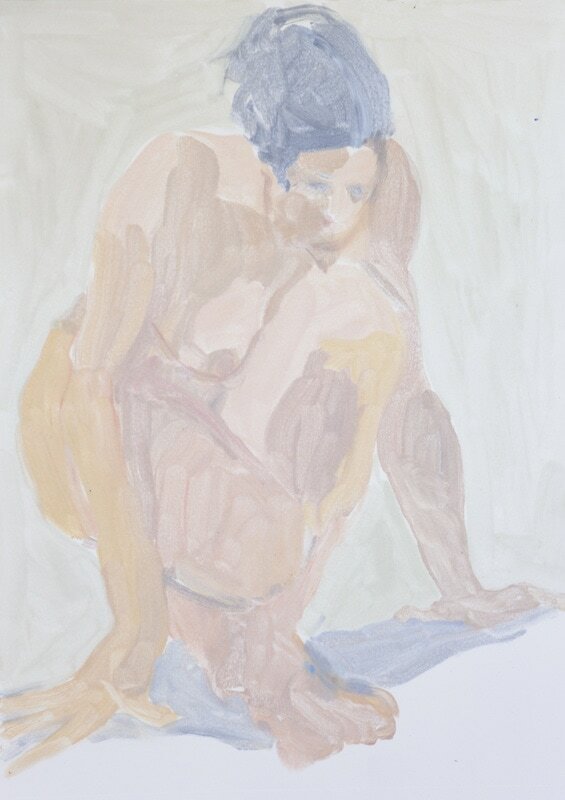 The visual language of the body expands into unseen forms, marking a shift toward self-representation. 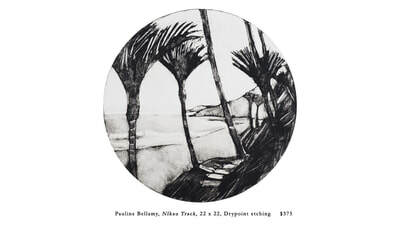 Miranda Bellamy is an artist and filmmaker. 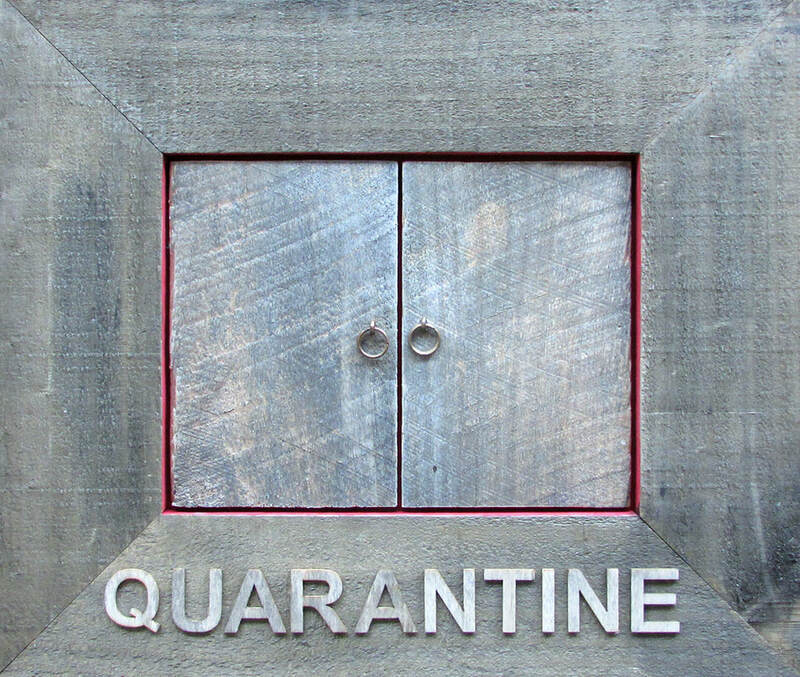 She has a multifaceted artistic practice that consists of sculpture, installation, video, photography and works on paper. Bellamy’s art is technically proficient, intricately complex and highly refined. 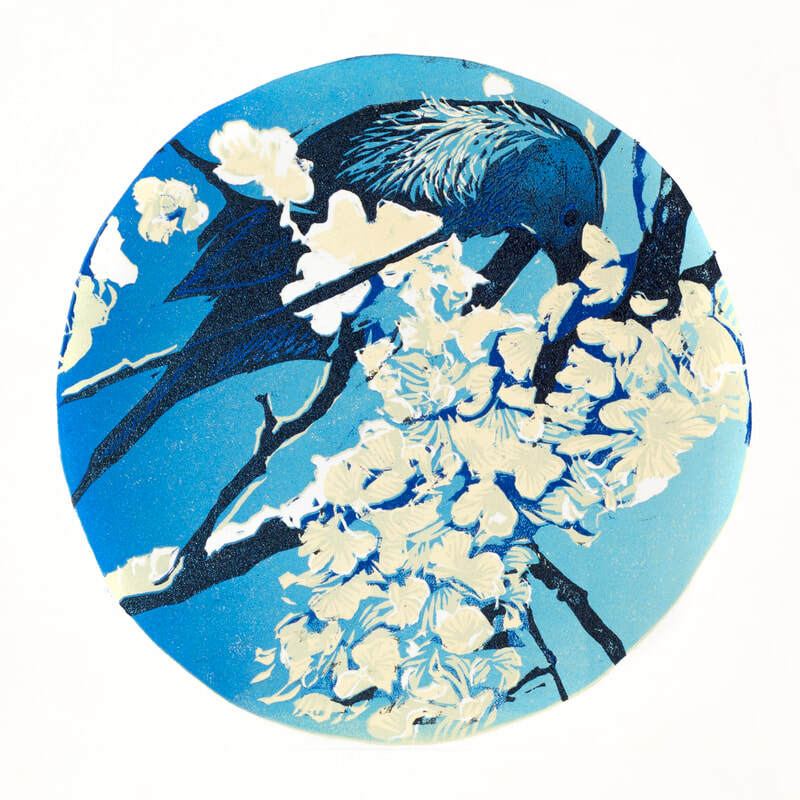 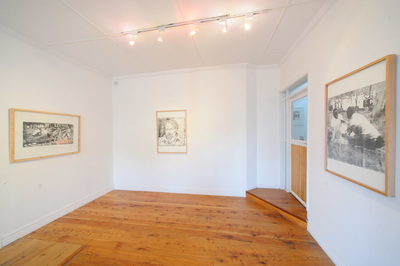 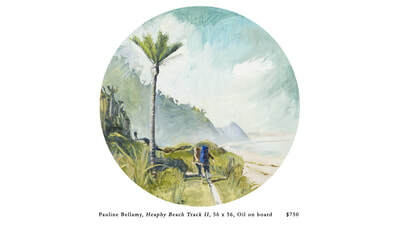 Bellamy is originally from Ōtepoti Dunedin, and has worked and exhibited extensively in Aotearoa New Zealand. 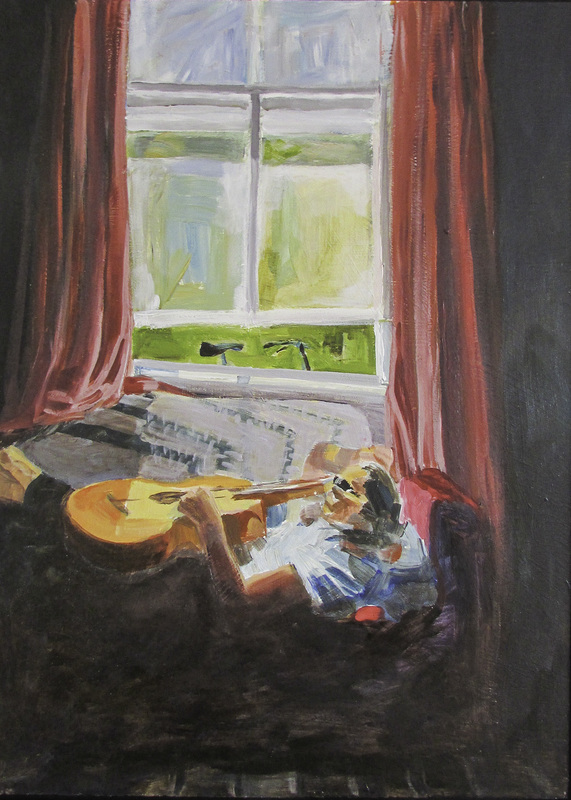 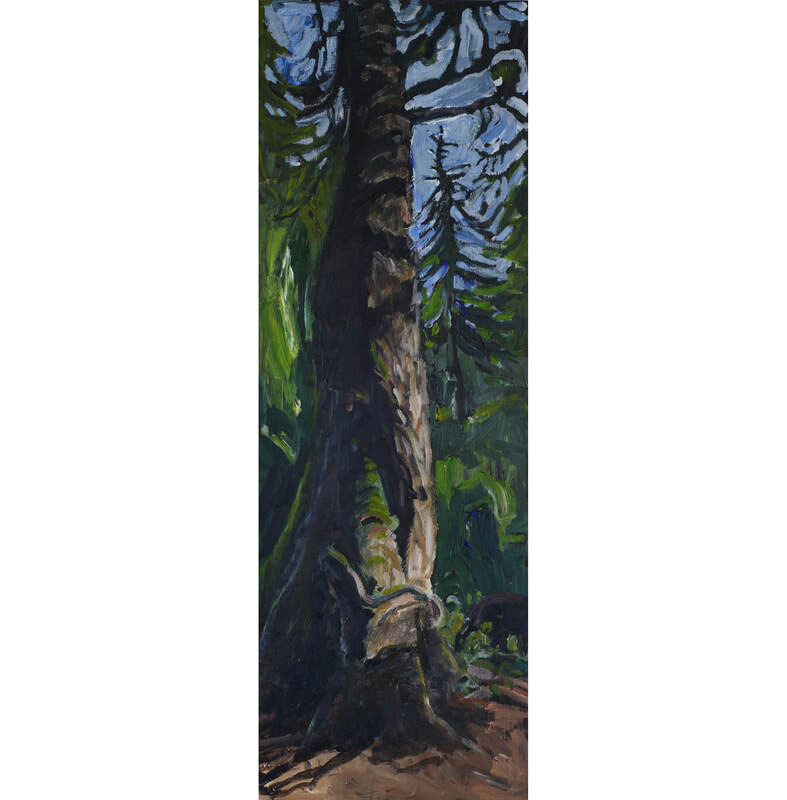 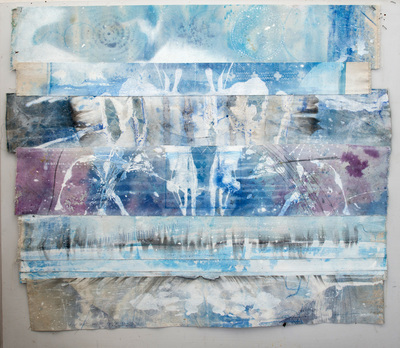 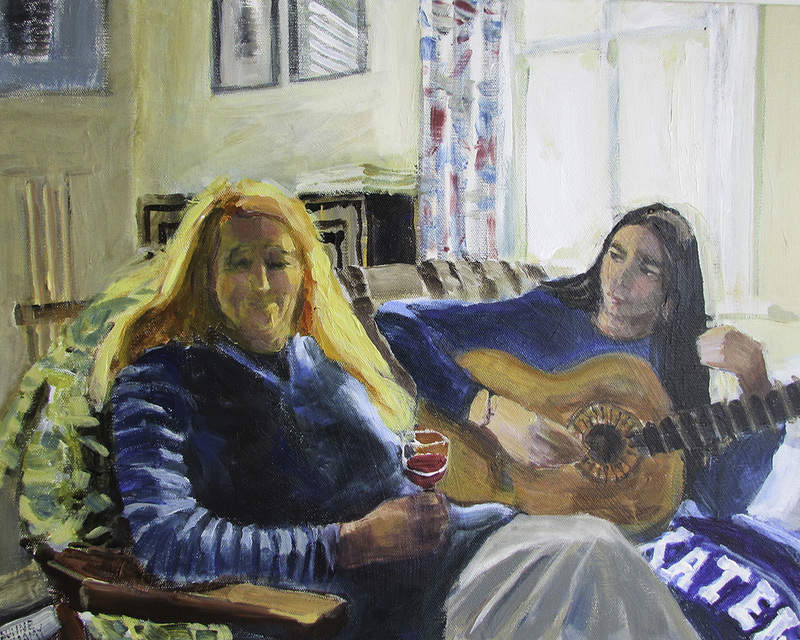 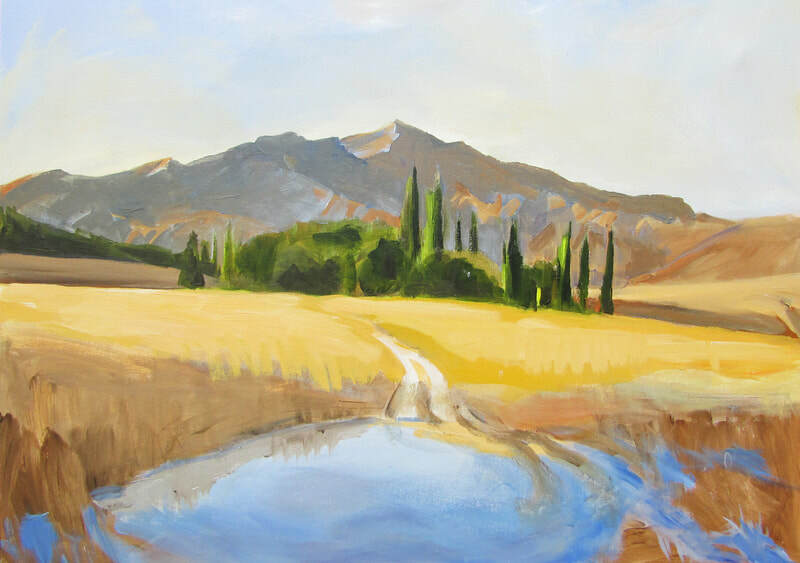 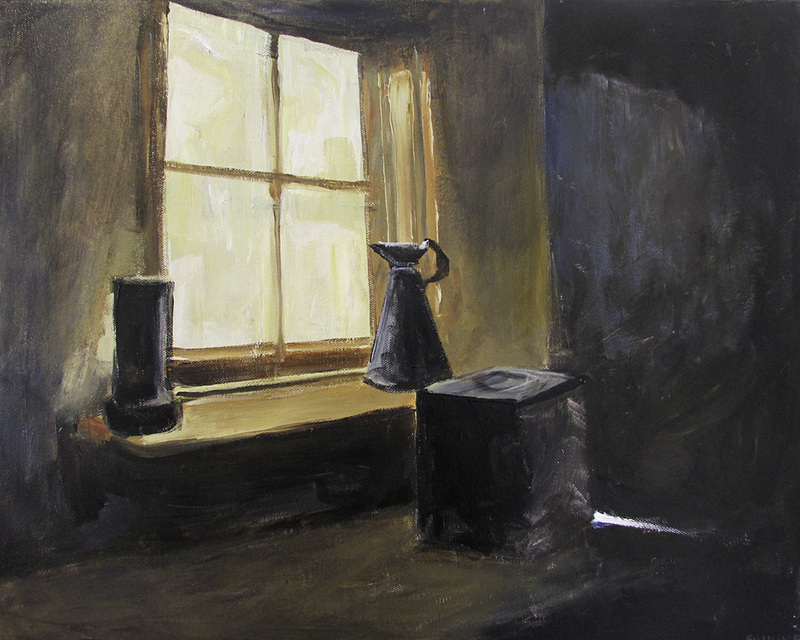 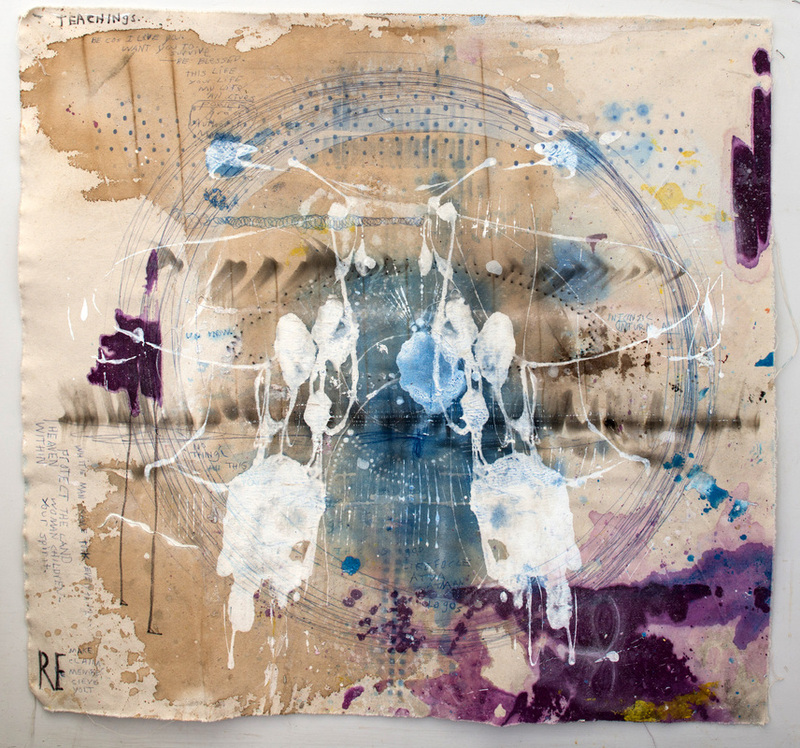 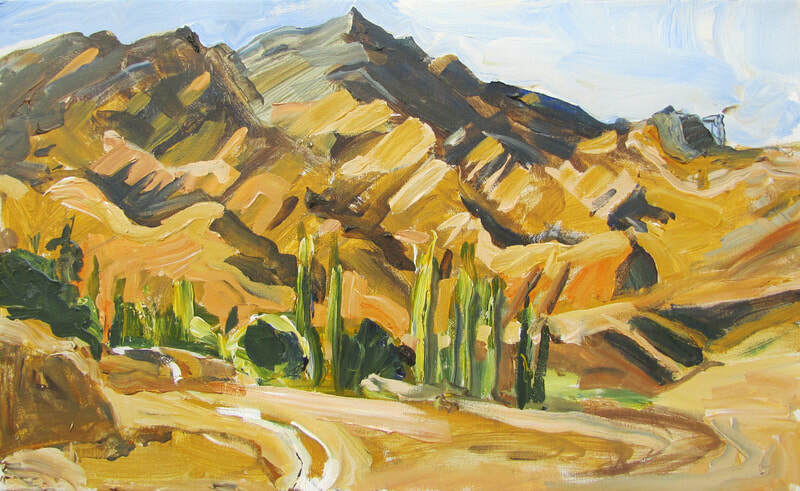 She has attended residencies internationally and is currently living in Canada. 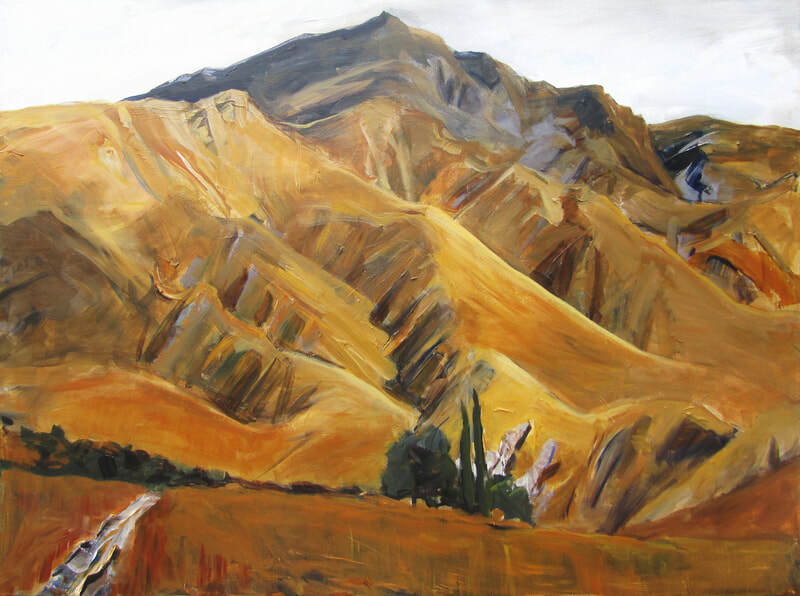 Back of Beyond carries us on a journey of golden light, to some of Central Otago’s most precious and remote locations. The striking peaks that frame the iconic Mace Town gold mining ruins are set alongside the expanse of soft tussock-lands that surround Serpentine church. 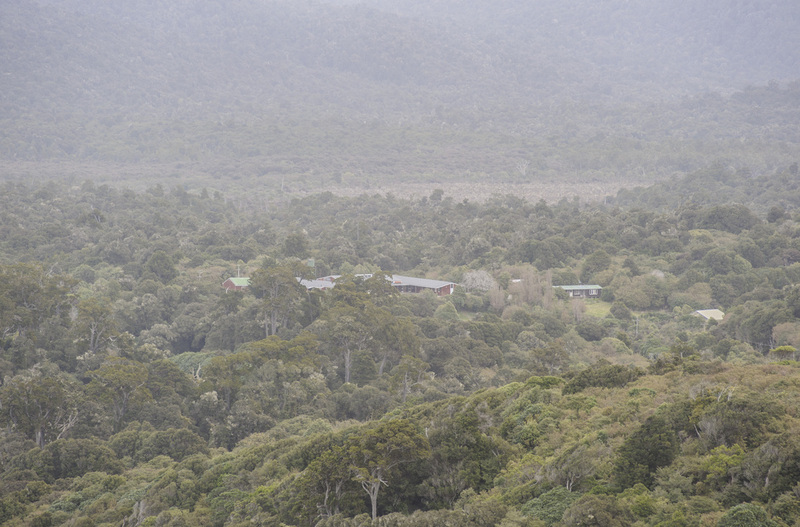 This is a landscape that seemingly never ends. 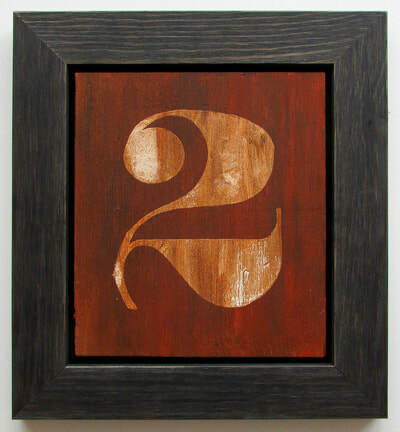 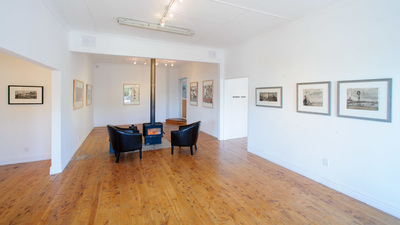 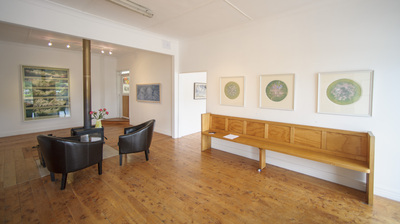 While there is no opening reception for this exhibition, you’ll always find a warm welcome at Bellamy’s Gallery. 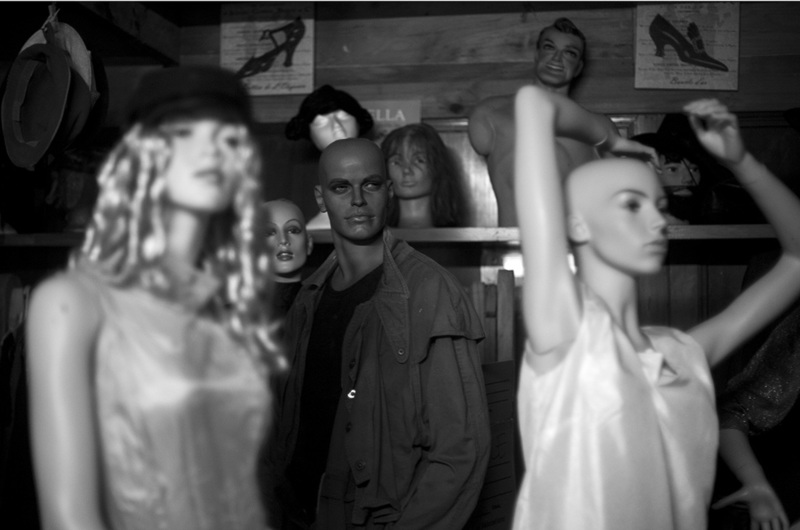 Come and join us, off the beaten track, in the middle of nowhere, Back of Beyond. 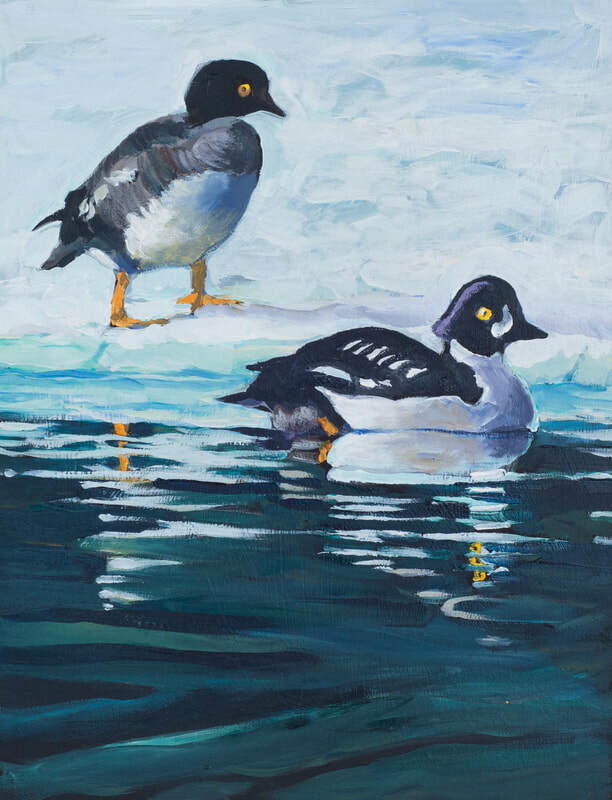 2018 has been a year of birds for Manu Berry, offering several opportunities for collaborating on avian themes. 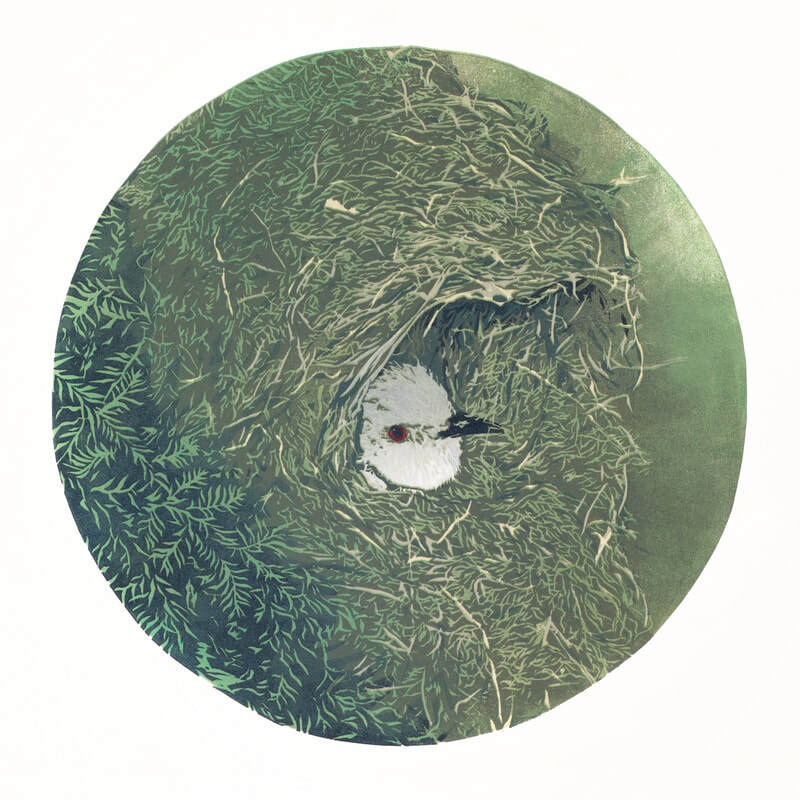 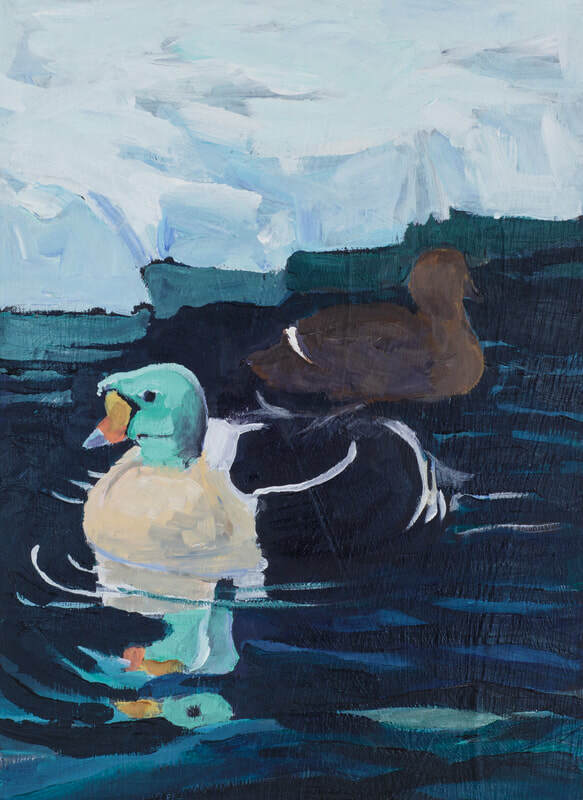 Forests and Fields is the result of working with Auckland based musicians Aro who are producing an album around the nature, song and symbolism of a number of birds of the NZ forest. 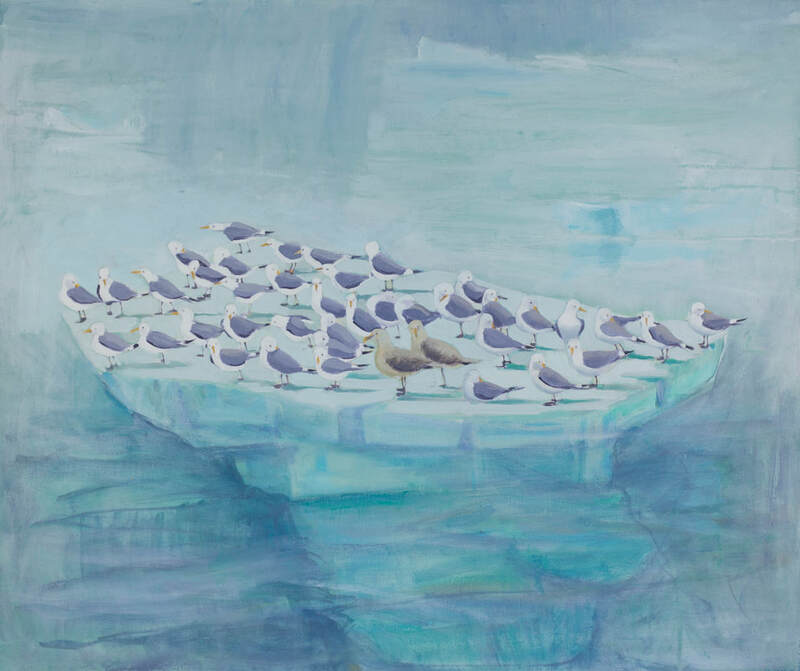 In turn, Berry has responded to their song and story to create a varied body of work showcasing the personalities and fine aesthetic elements of our diverse birdlife. 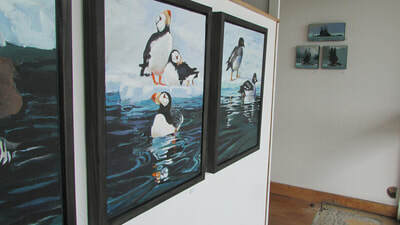 Through this, and several other bird-related projects, Berry is developing and communicating a nuanced understanding of the relationship between humans and our winged companions. 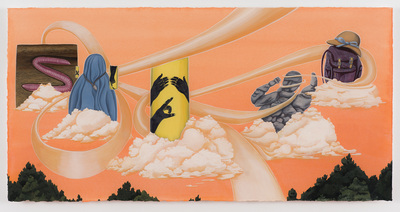 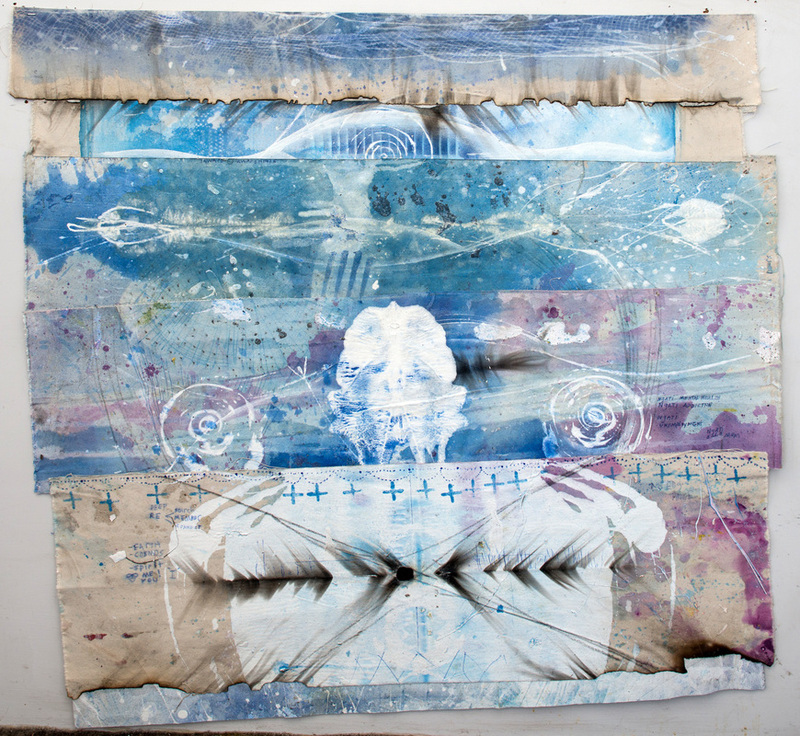 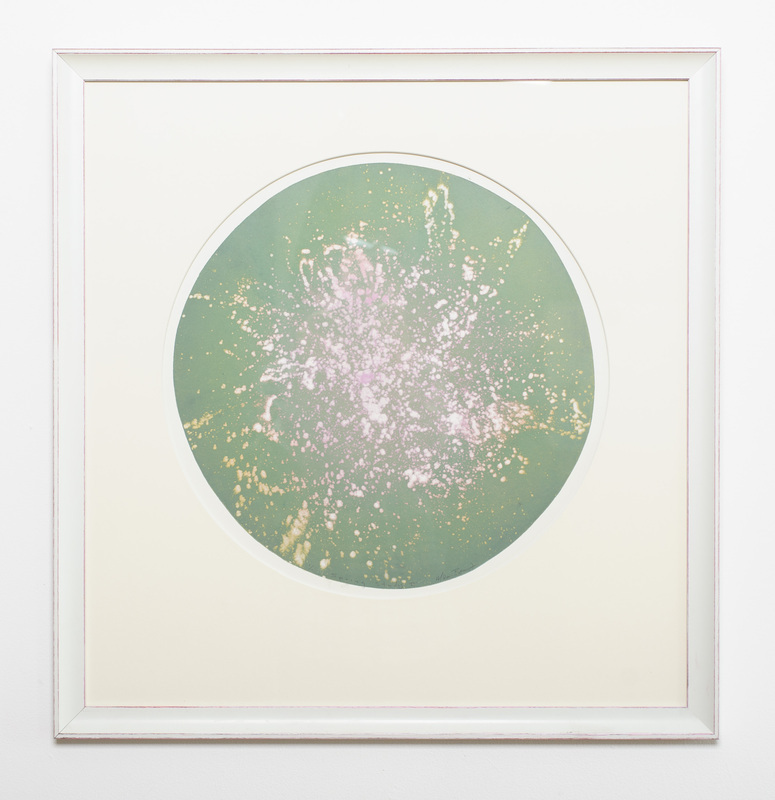 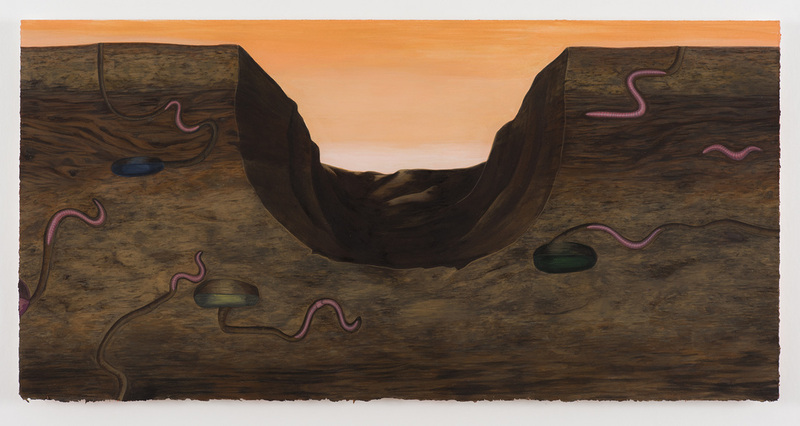 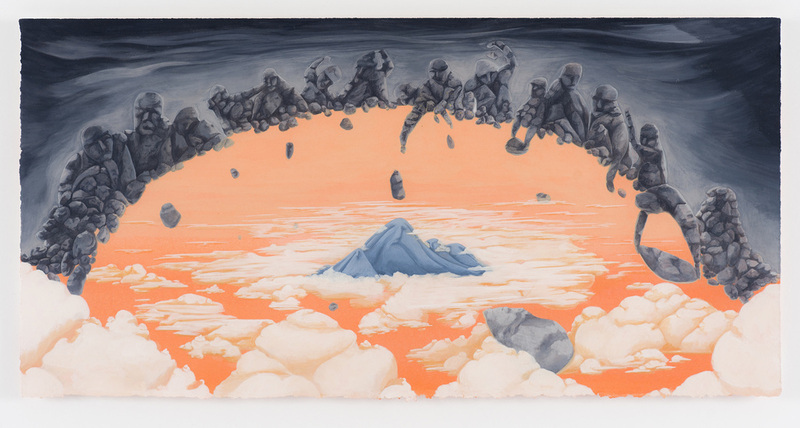 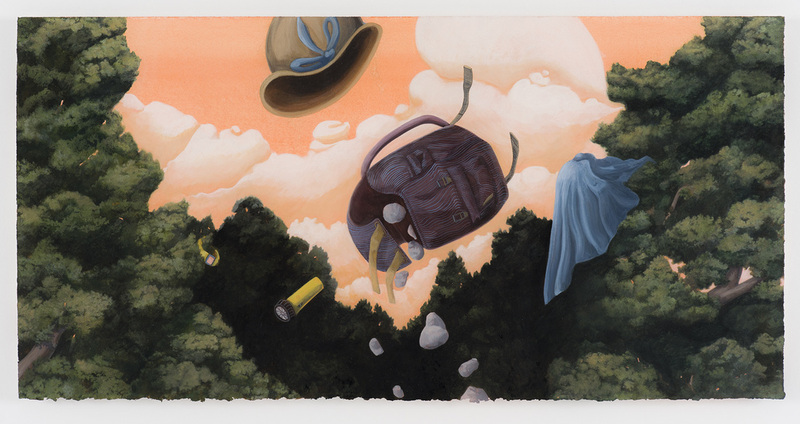 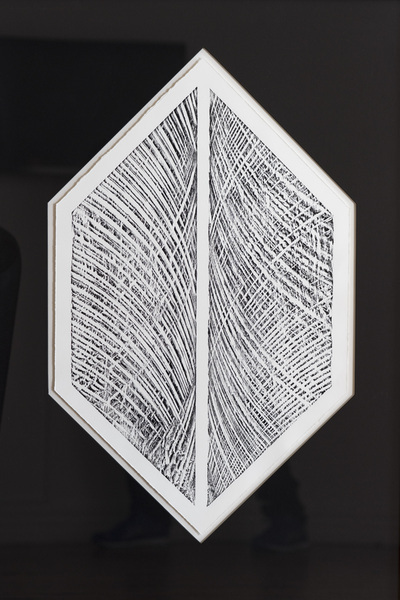 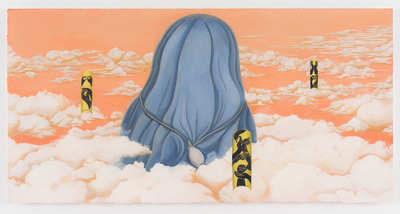 Alongside Berry’s work, Luke Hancock presents new paintings that explore concepts of ‘above, below and in-between’; simplified and defined. 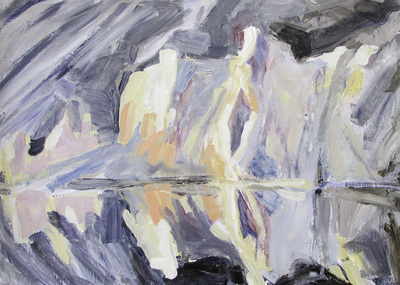 Colour relationships, the materiality of paint, form, edge and surface are all significant here. 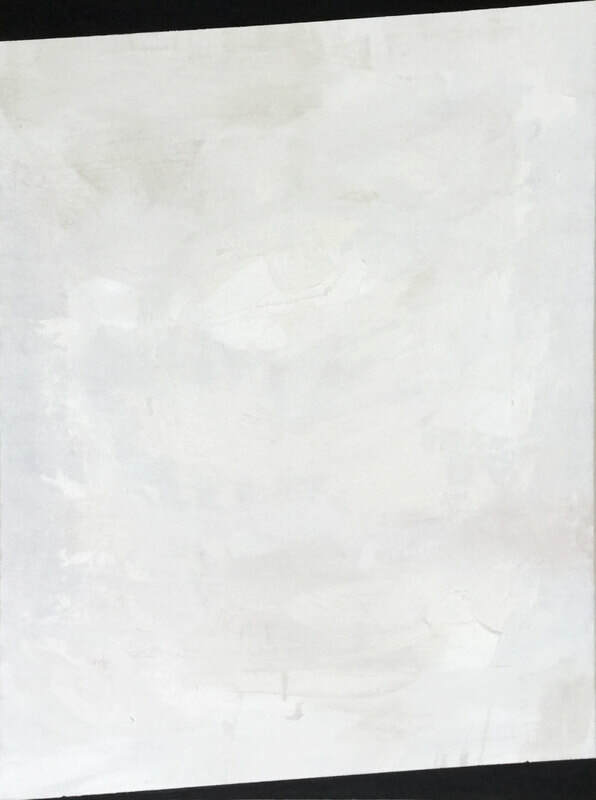 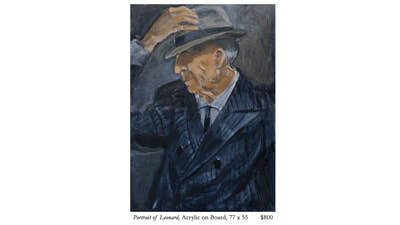 Hancock’s abstract statements lead to an experience of painting, inviting dialogue and interpretation. 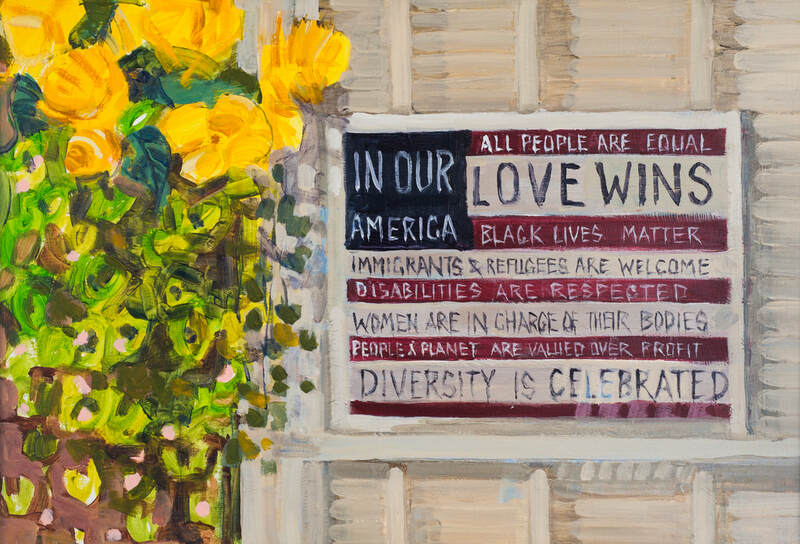 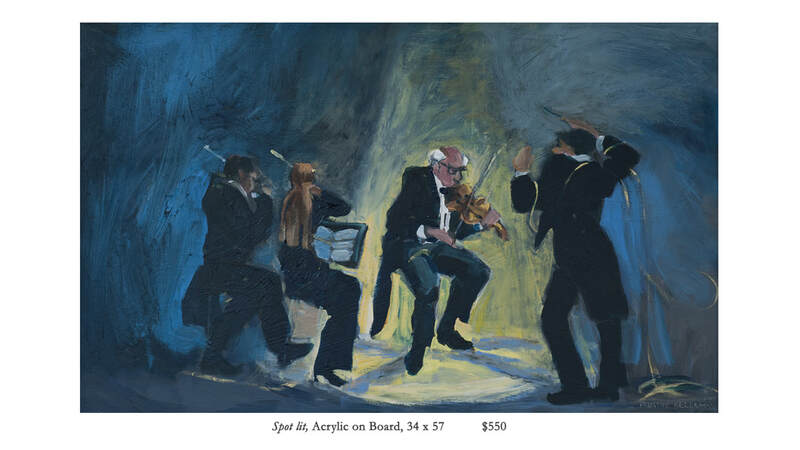 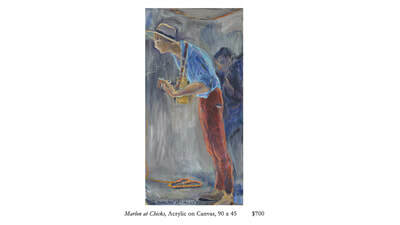 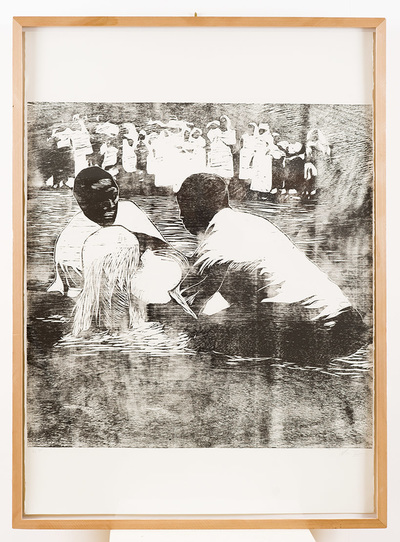 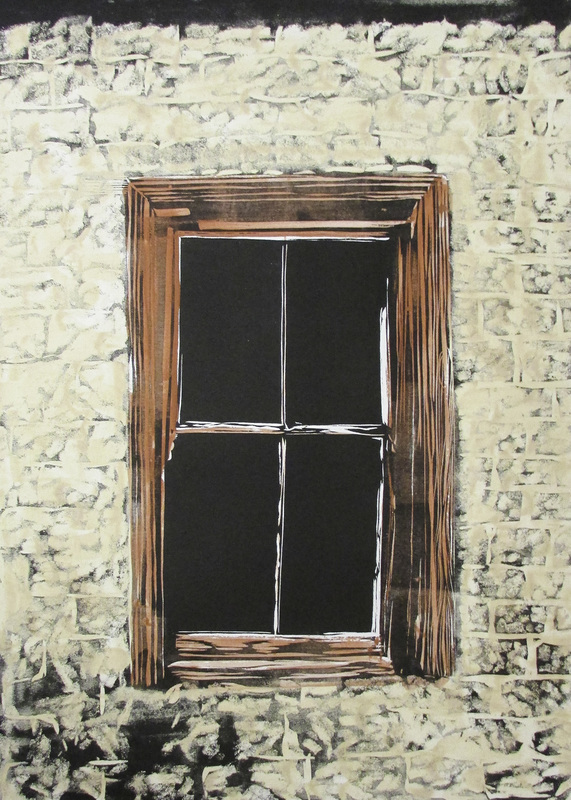 With confident subtlety, they manifest an artist's perspective of a diverse world. 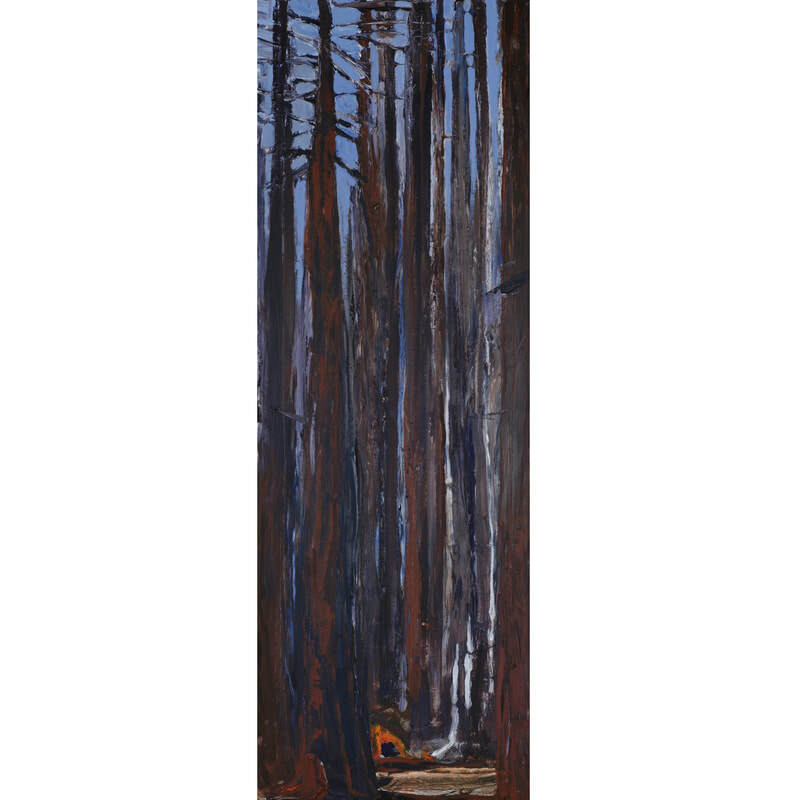 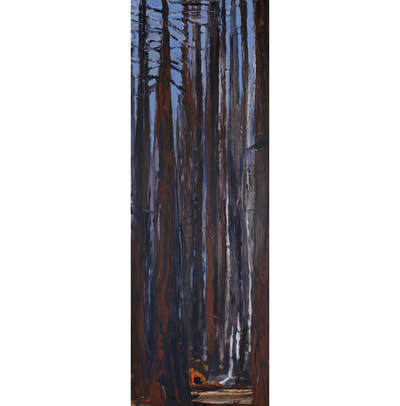 Please join us for the Forests and Fields opening reception this Saturday December the 1st from 4pm. 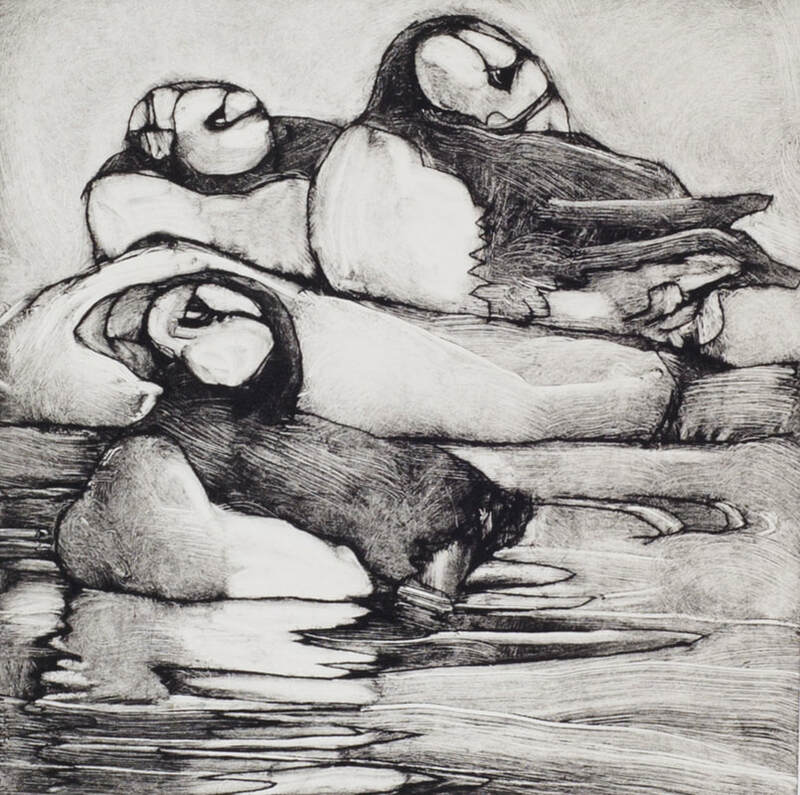 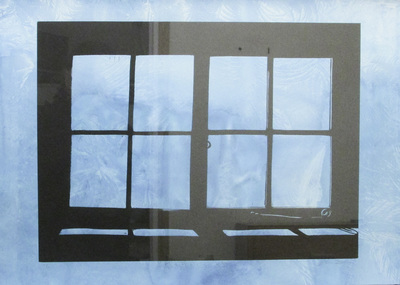 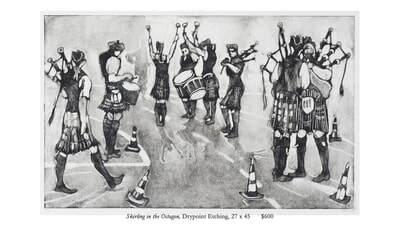 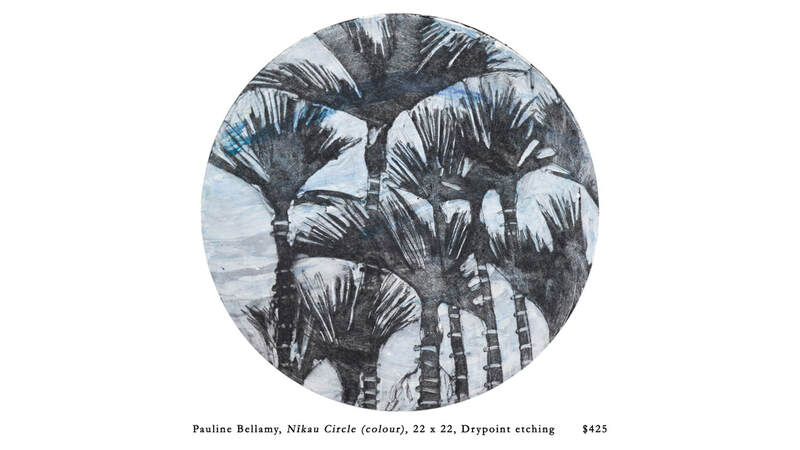 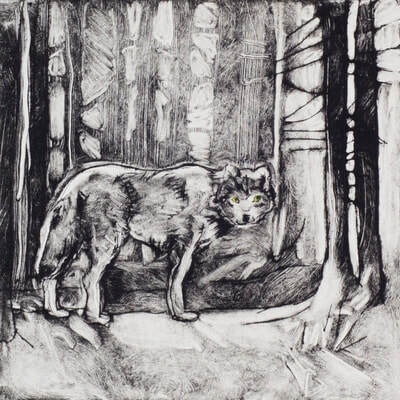 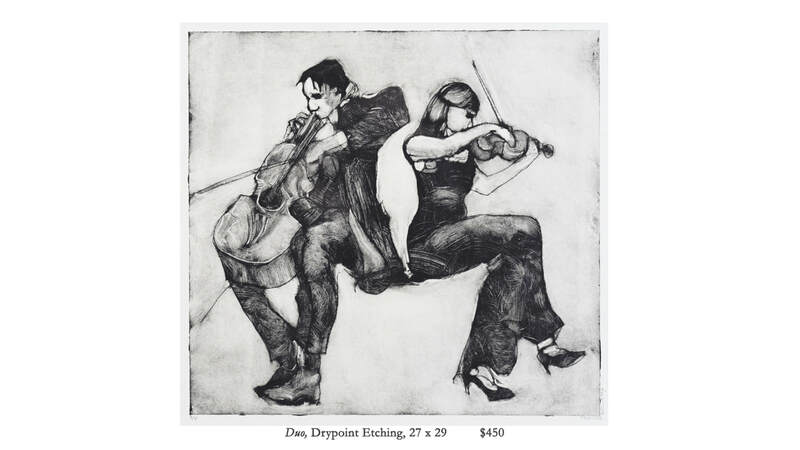 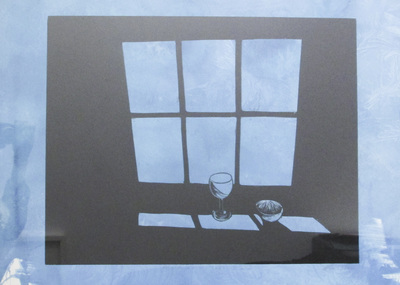 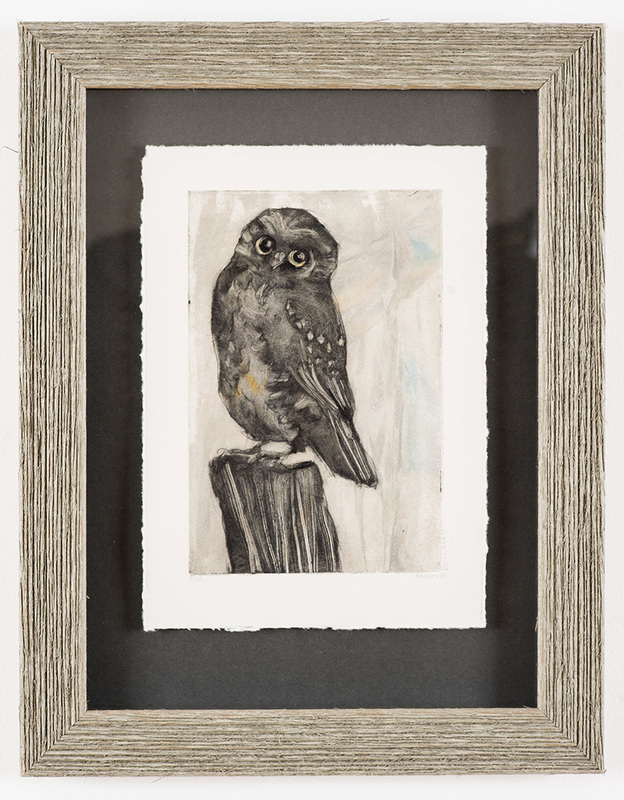 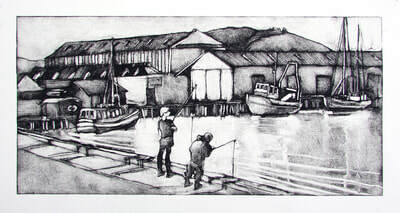 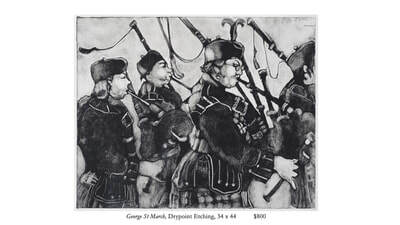 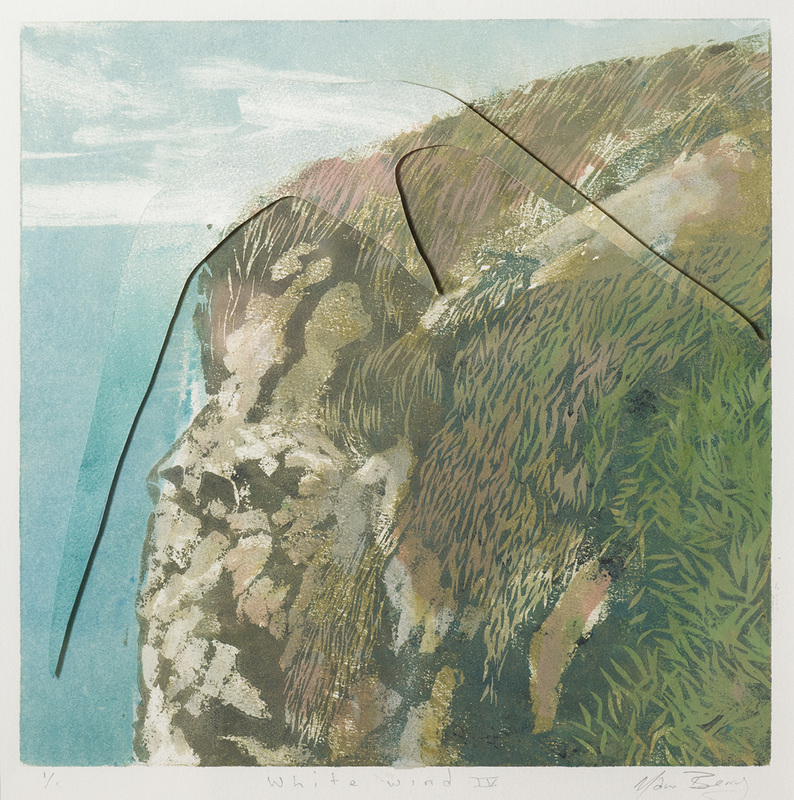 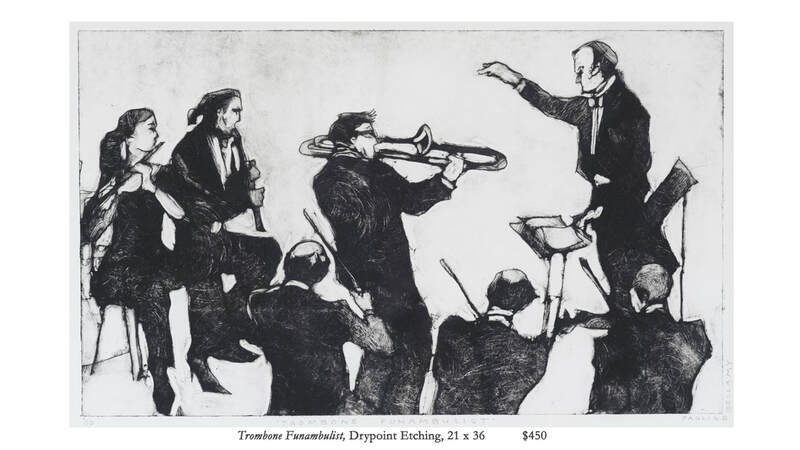 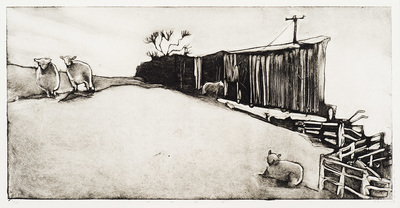 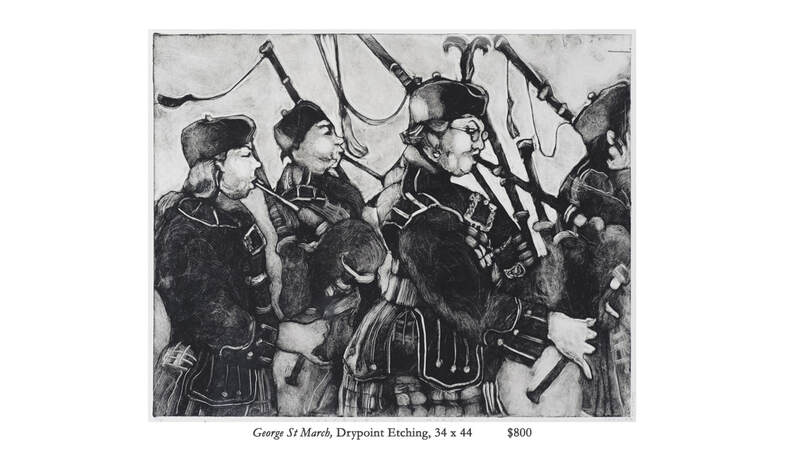 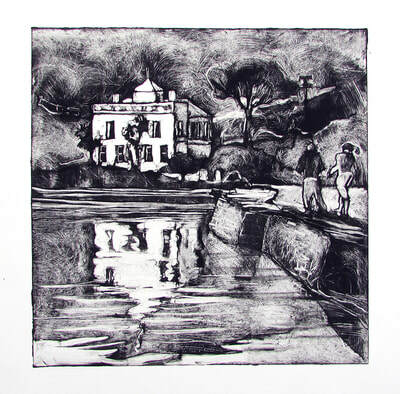 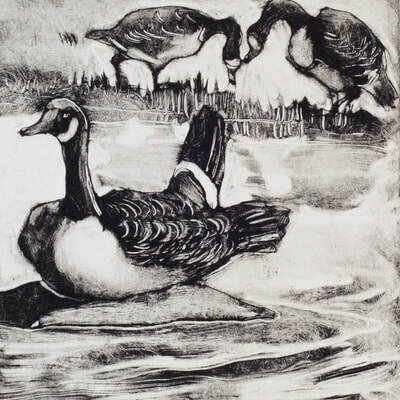 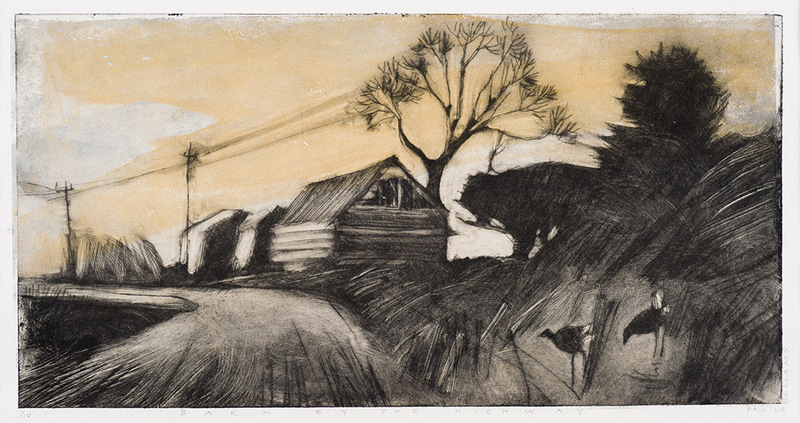 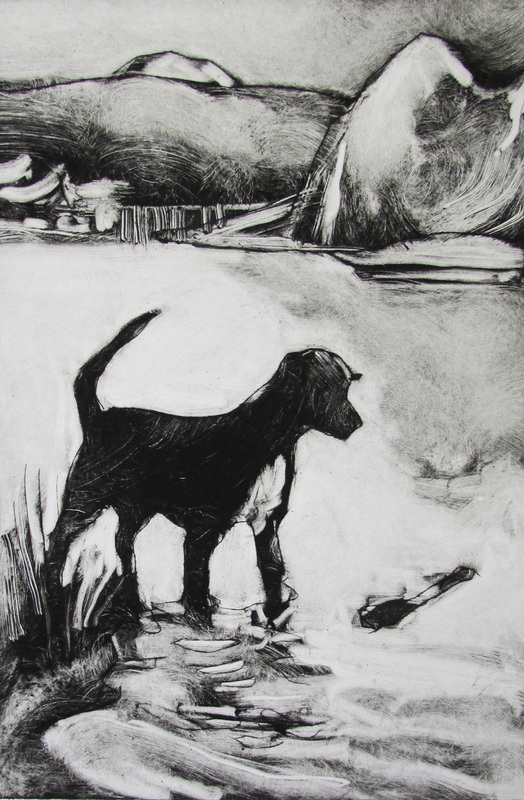 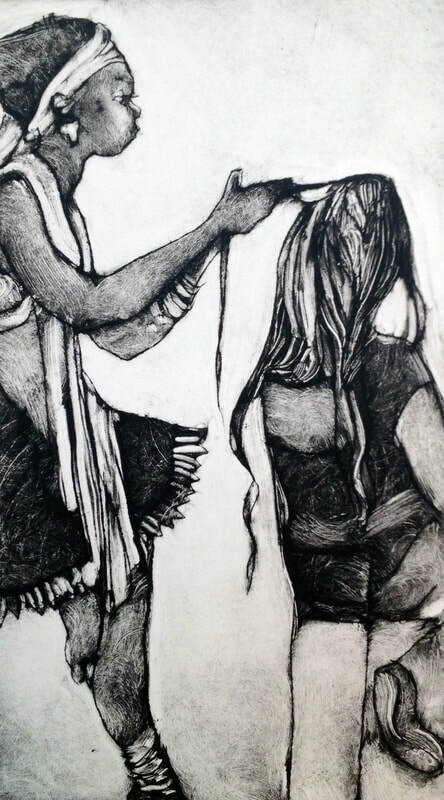 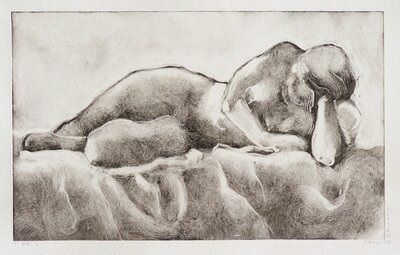 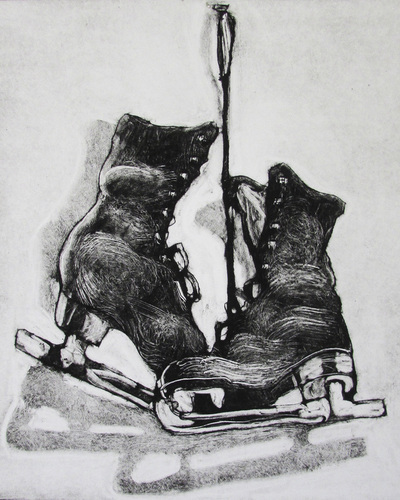 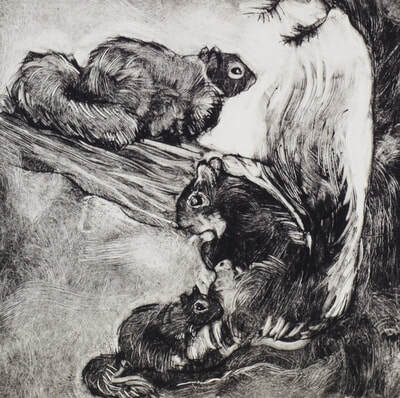 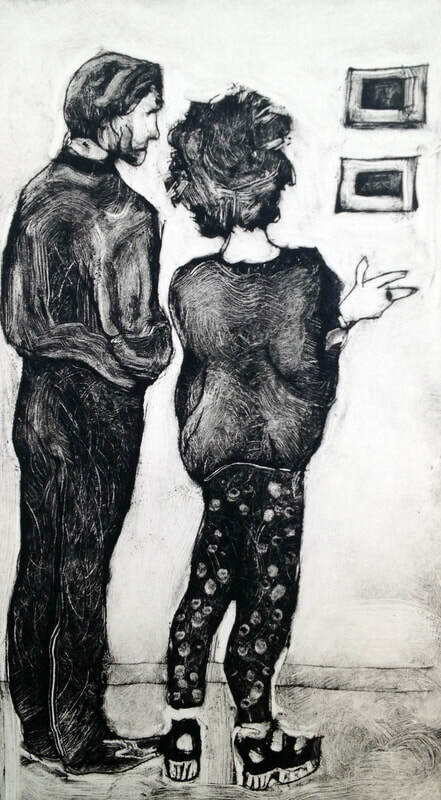 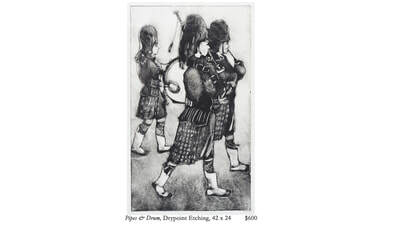 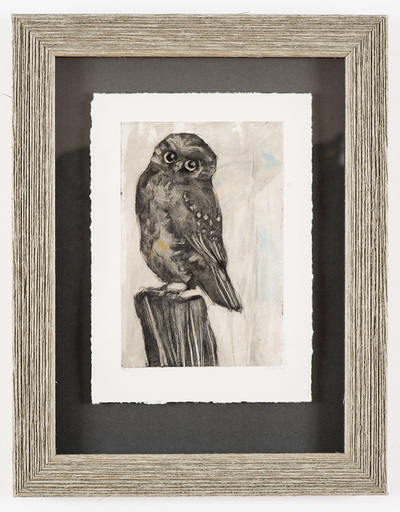 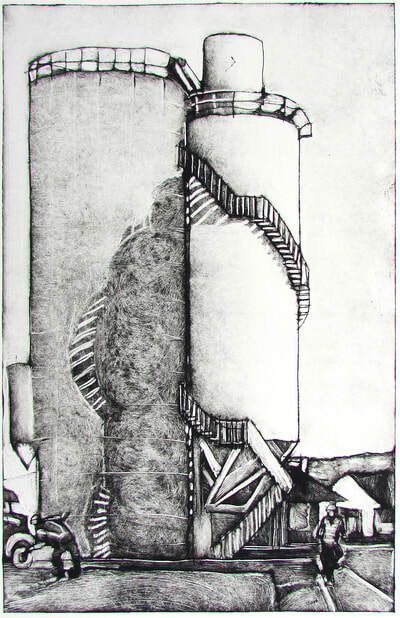 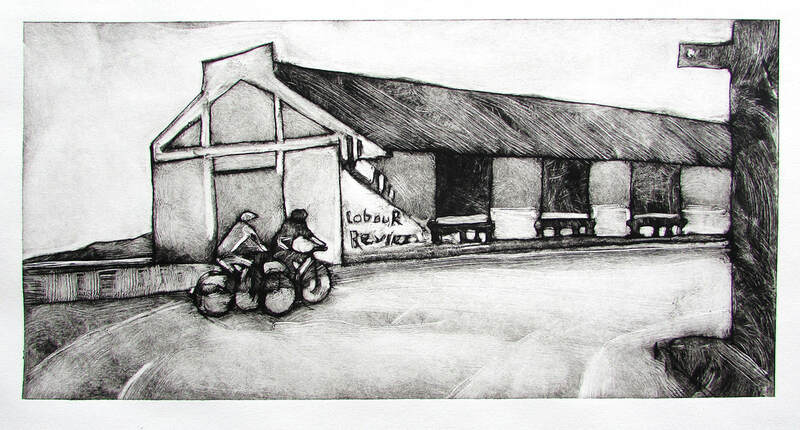 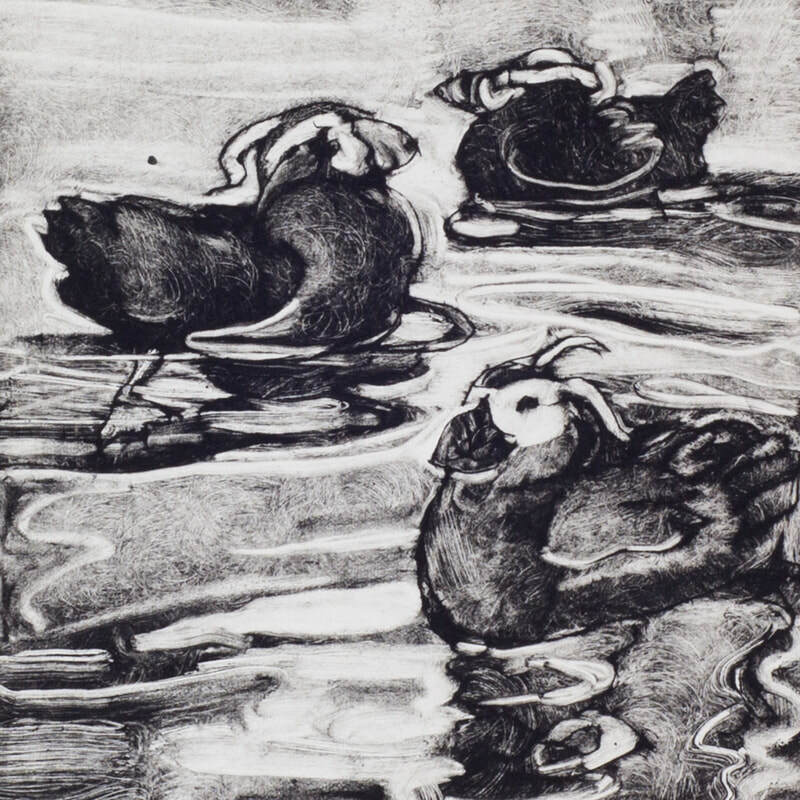 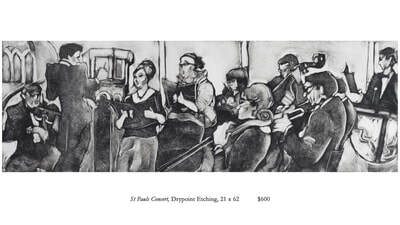 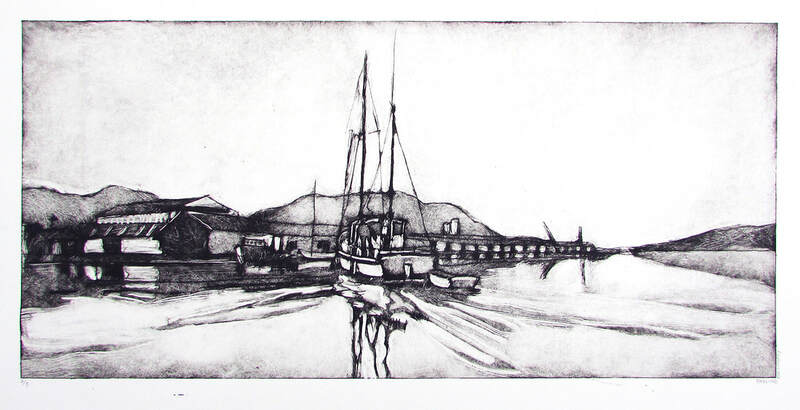 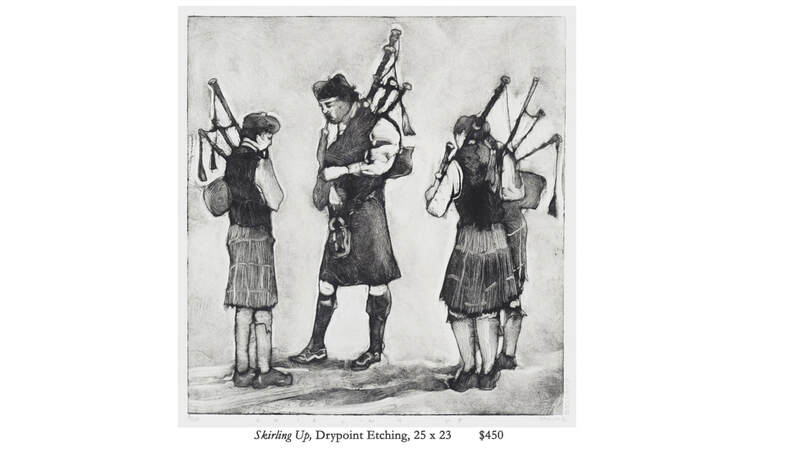 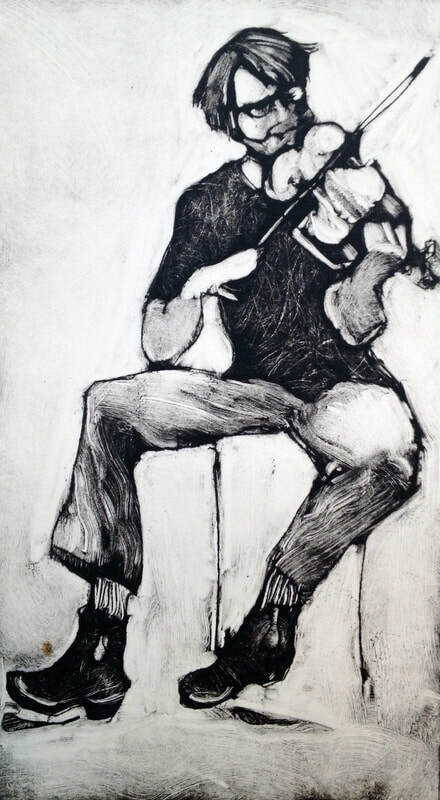 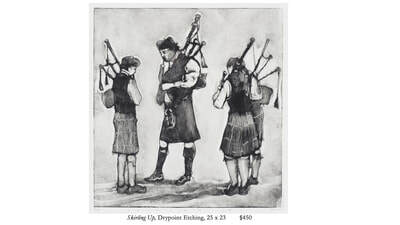 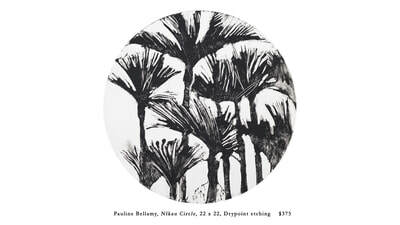 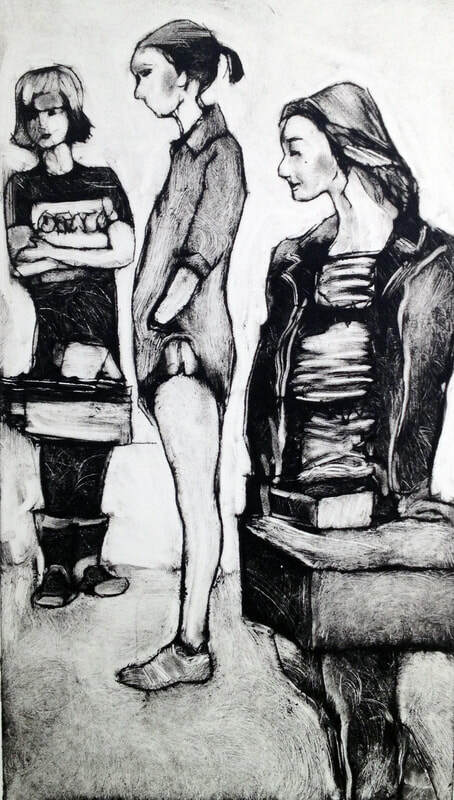 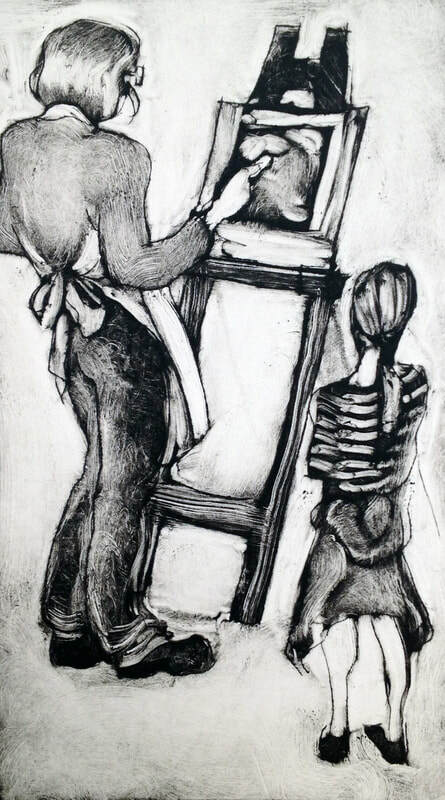 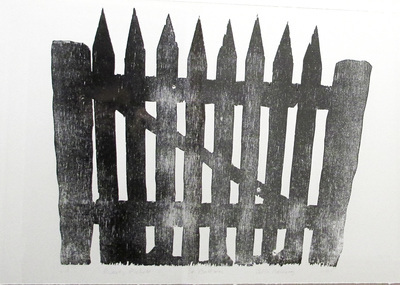 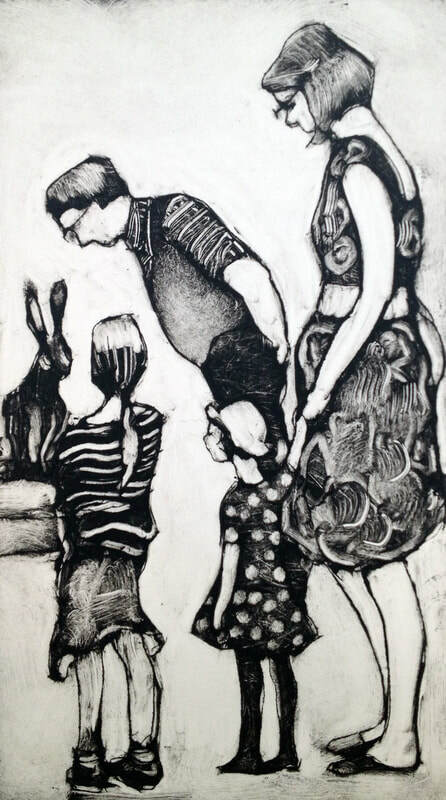 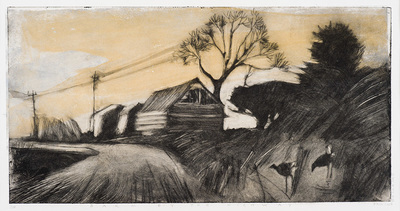 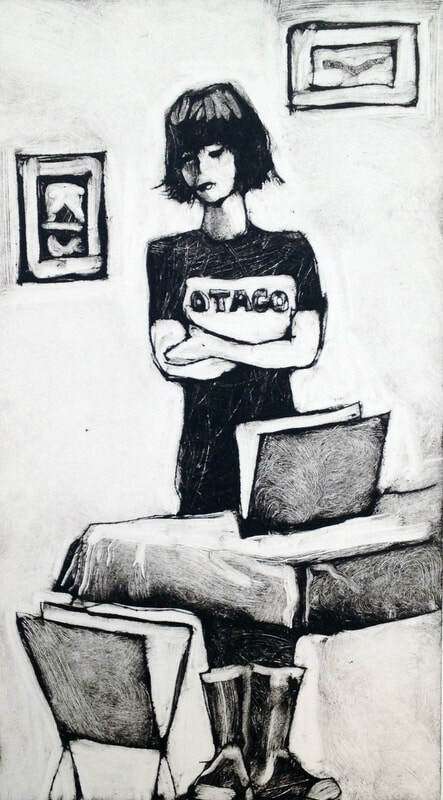 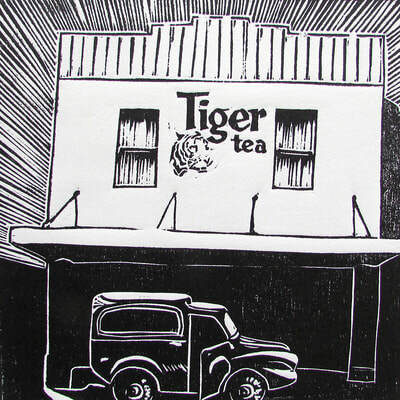 Find these character filled etchings by Pauline Bellamy among many other treasures at the OPenArts Christmas Fair. 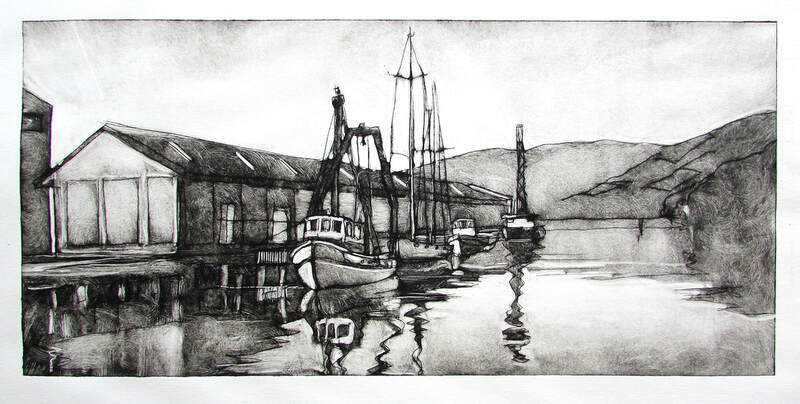 On this weekend at the Macandrew Bay Hall, Saturday the 24th Nov, and Sunday the 25th. 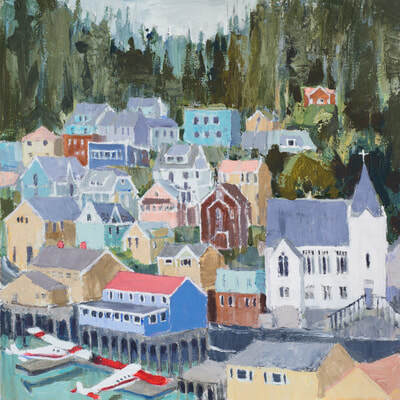 Read a view of North to Alaska by James Dignan in the Otago Daily Times here. 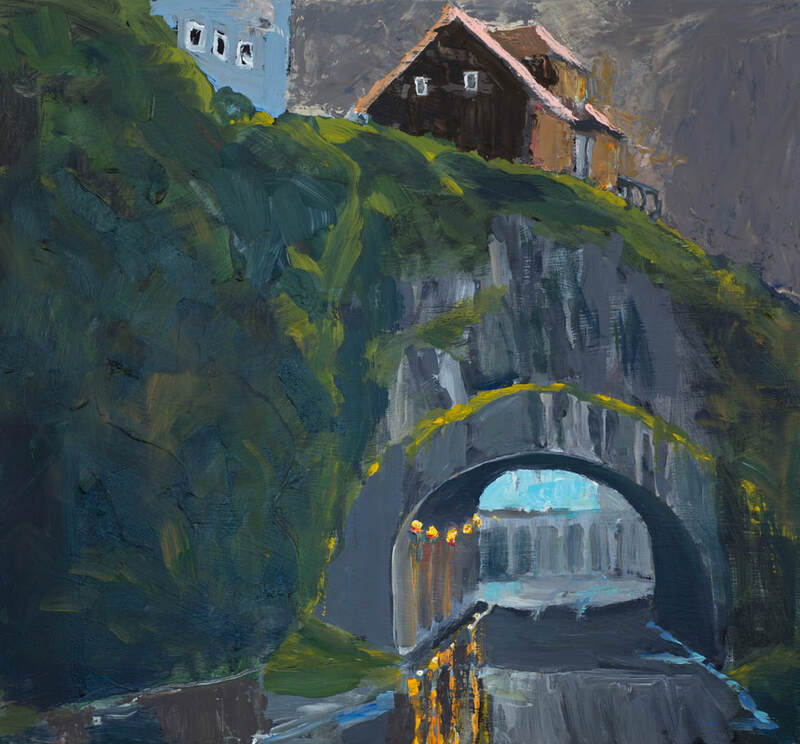 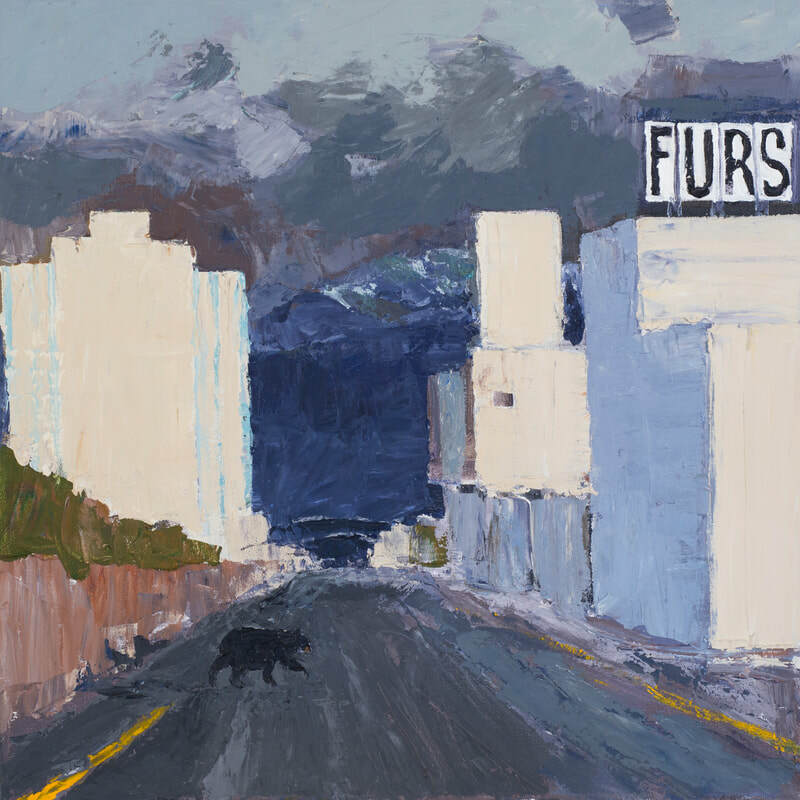 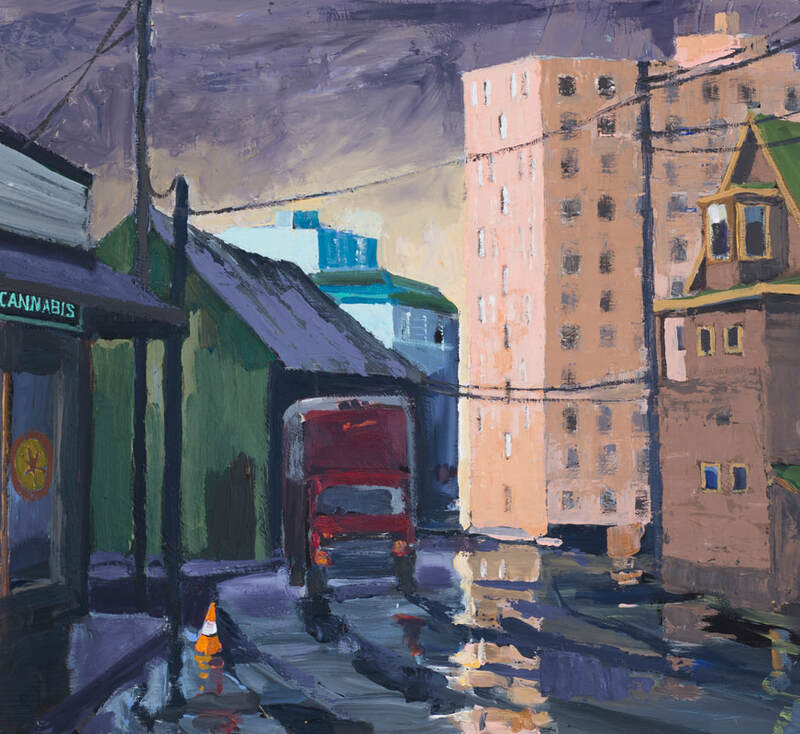 "The astonishing scenery captured in images such as Glacier Bay and Bry Mwy Glacier sits uneasily yet appropriately against the drab cityscape shown in Ketchikan Rain and the head-on meeting of animal and industry in Black Bear, Anchorage. 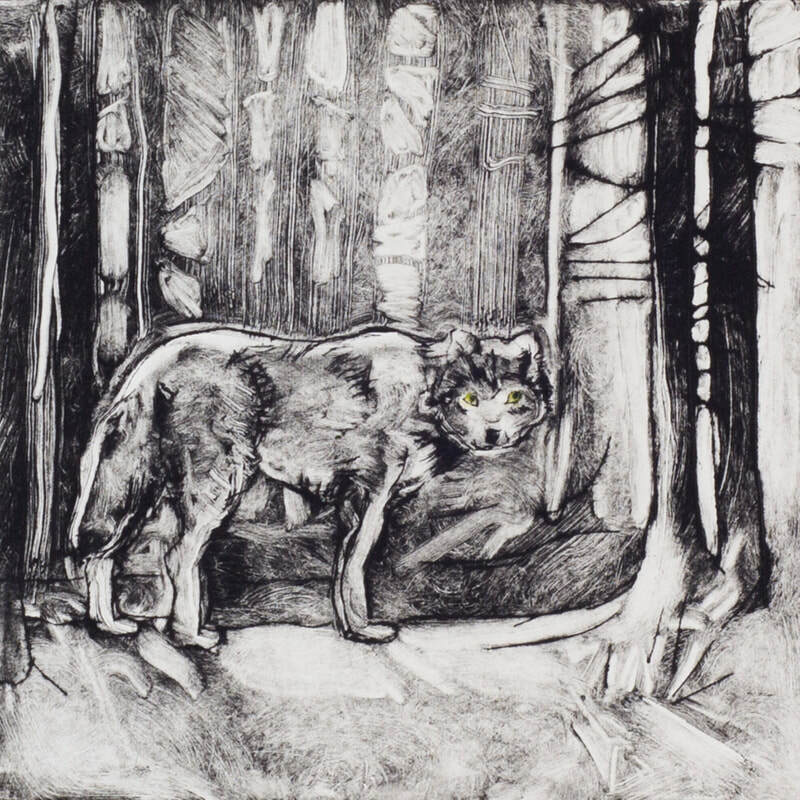 It is, to some extent, the animals which win out - in this exhibition, even if not in reality - with an impressive series of etchings of Alaskan wildlife and painted bird studies. 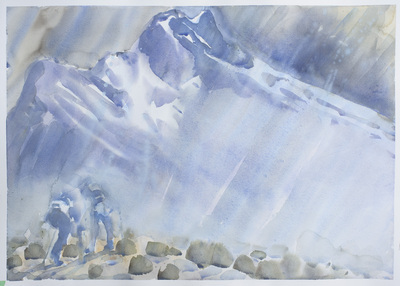 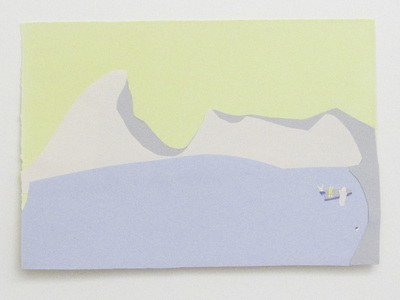 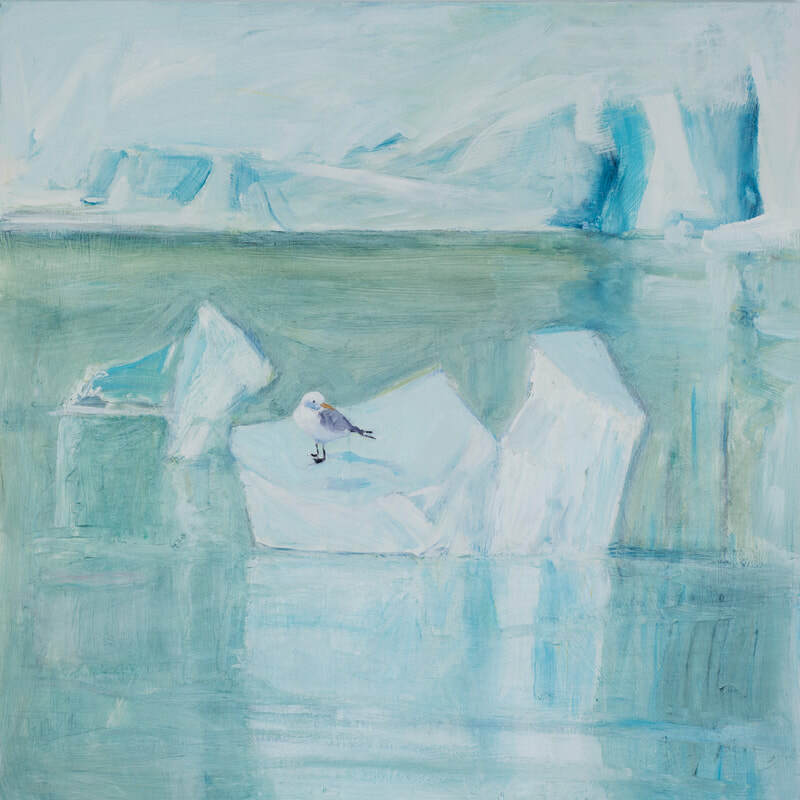 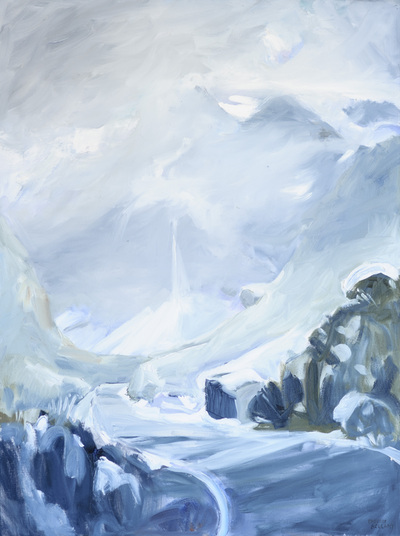 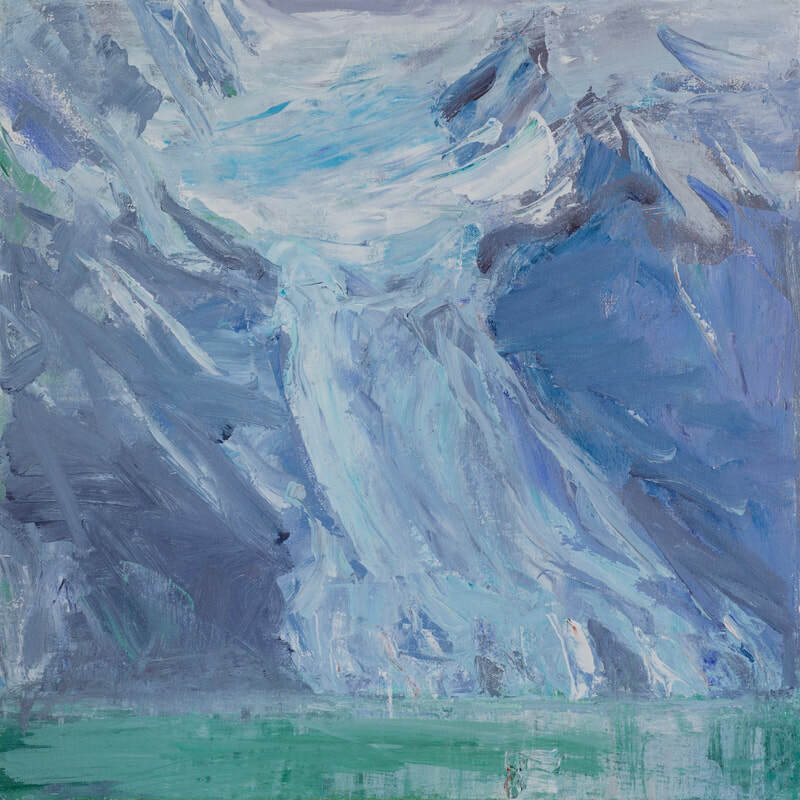 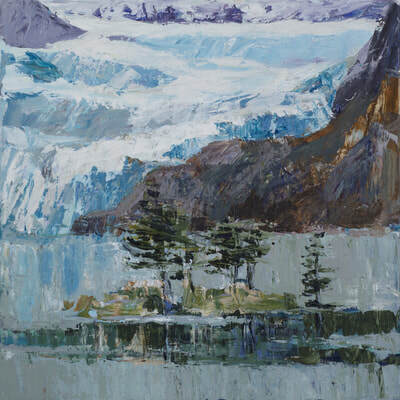 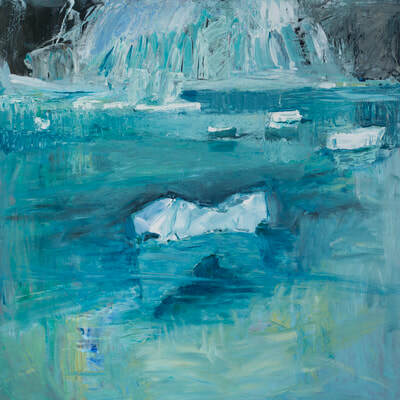 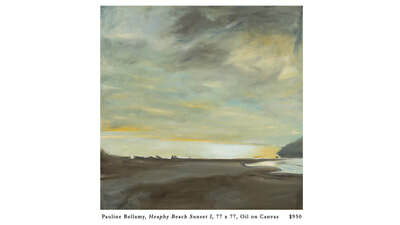 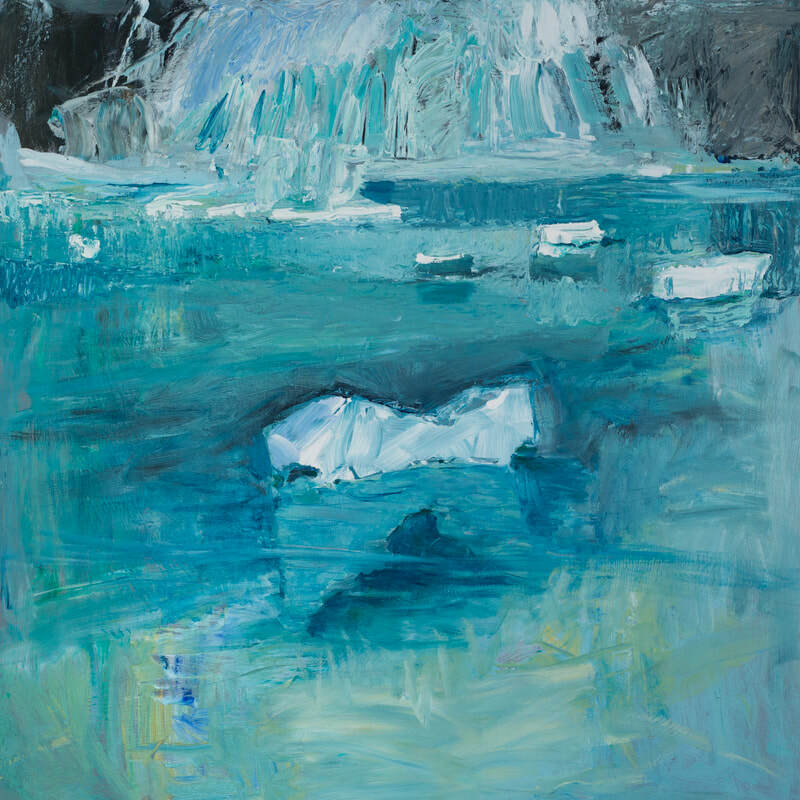 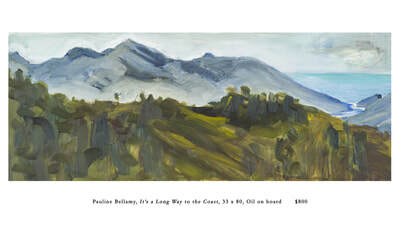 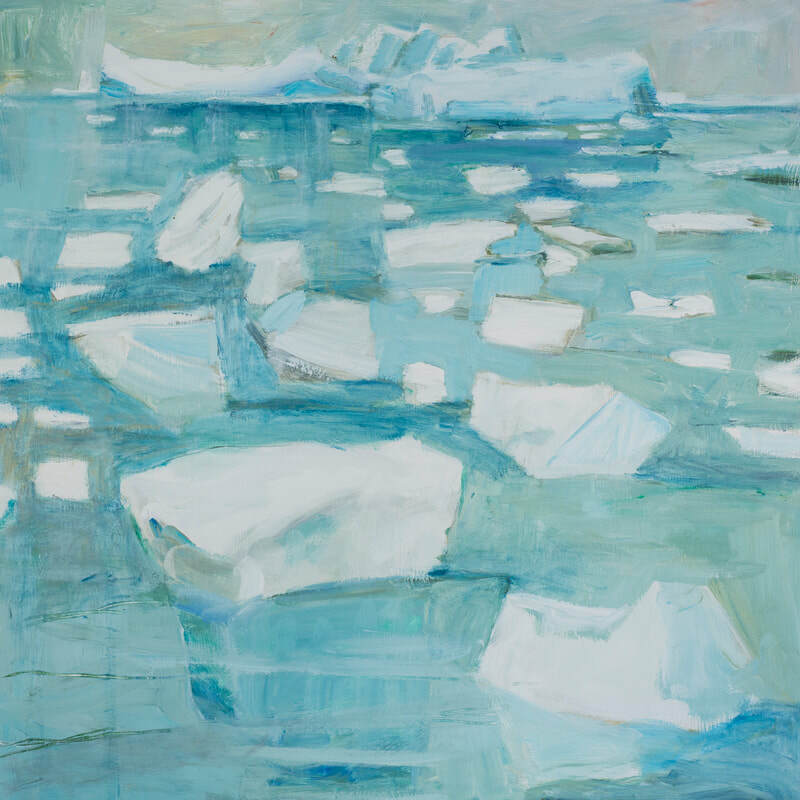 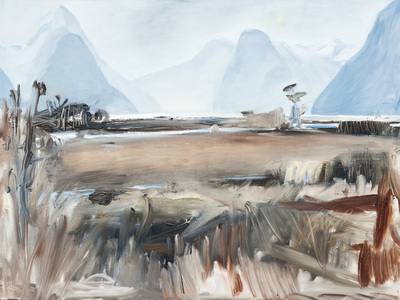 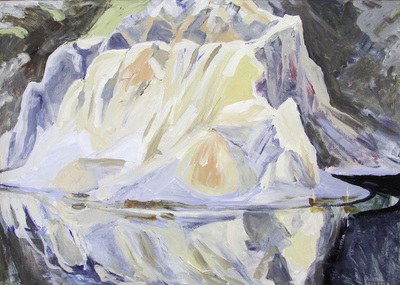 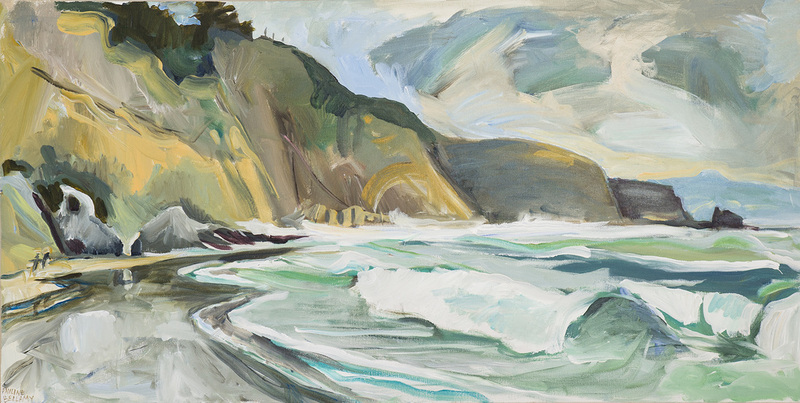 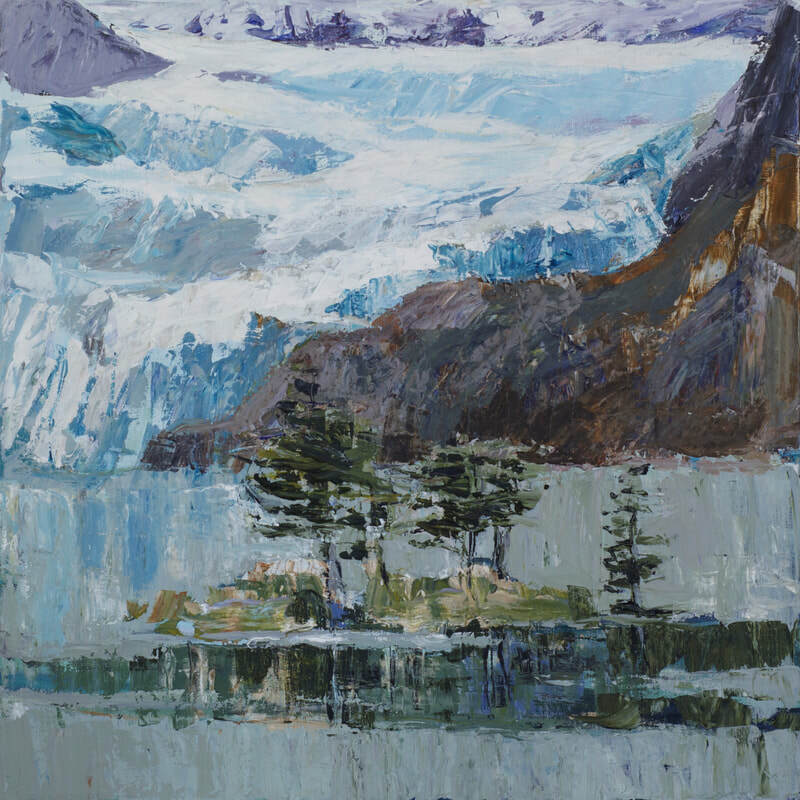 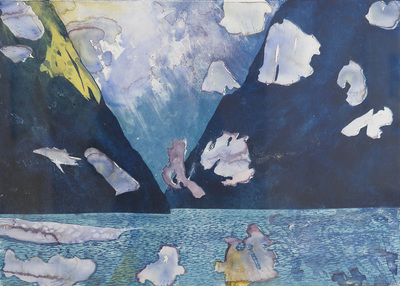 The scenes of Alaska's wilderness are particularly fine, whether they be naturalistic (as with the exhibition's lovely titular work) or reduced to the heavily stylised forms of ice floe and reflecting water epitomised by Leaving College Fjord"
Pauline Bellamy's upcoming exhibition surveys the grandeur of North America's west coast. Her bold compositions brim with a spirit of exploration and adventure. 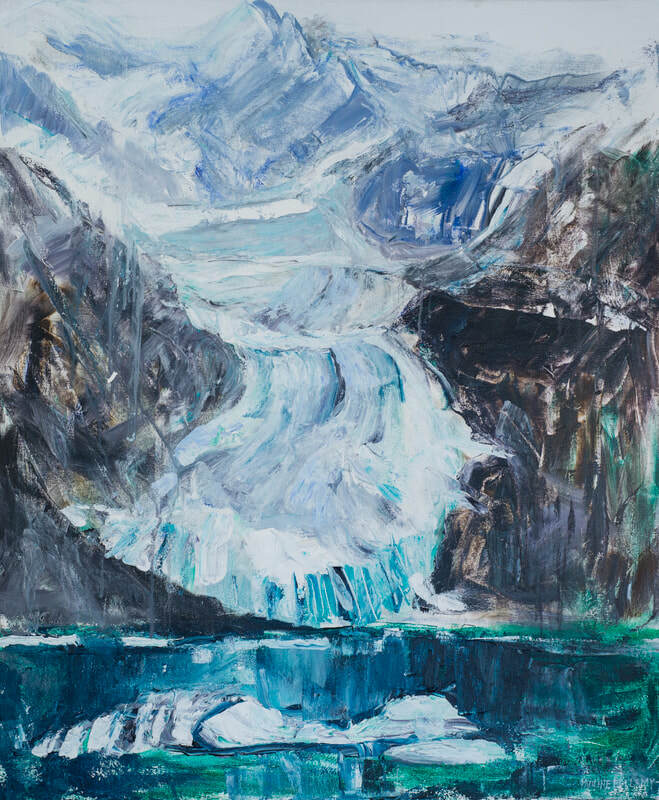 Some pieces celebrate the pristine natural wonder she discovered, others asks questions about the relationship humans have with these locations. You are warmly invited to join us for the opening function on Sunday the 7th of October at 5pm. 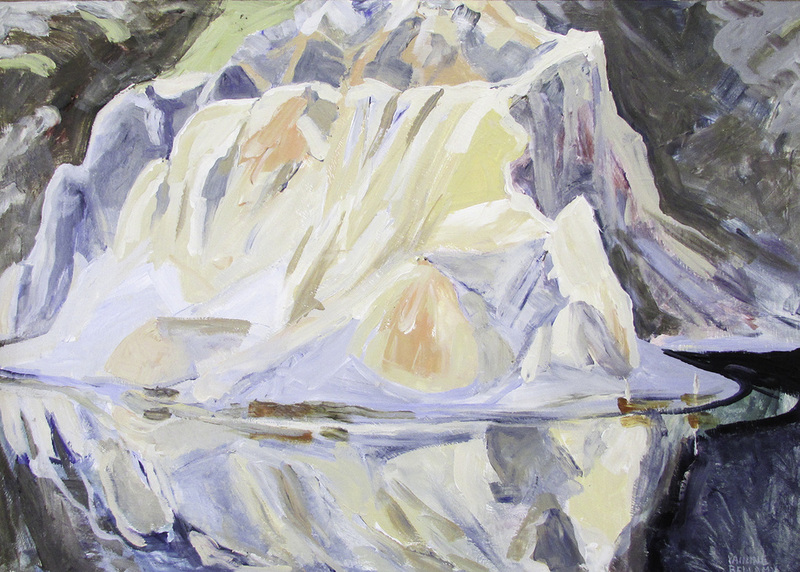 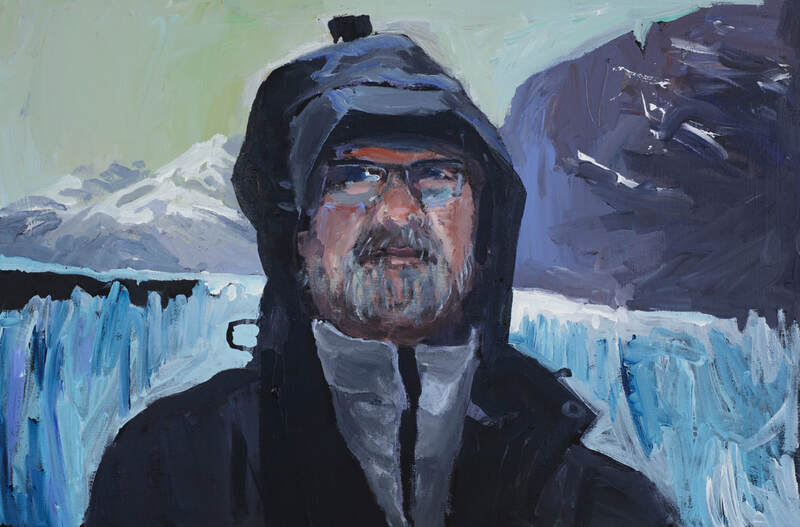 North to Alaska exhibition runs from the 7th October until the 4th November at Bellamy’s Gallery. 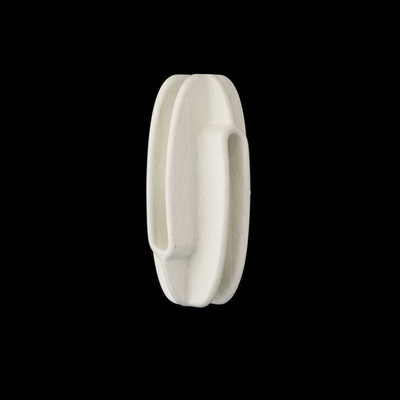 Online catalogue available on our home page. The Heaphy waking track in the Kahurangi National Park traverses a remarkably diverse section of our unique native landscape. From climbing into windswept tussock tops, to gliding through pristine forests of Nīkau, this ever-changing track has much to offer. 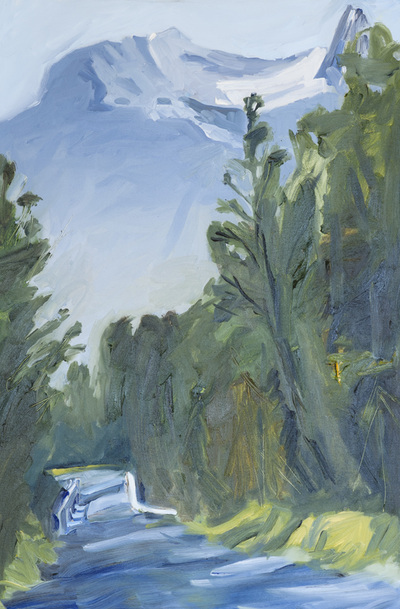 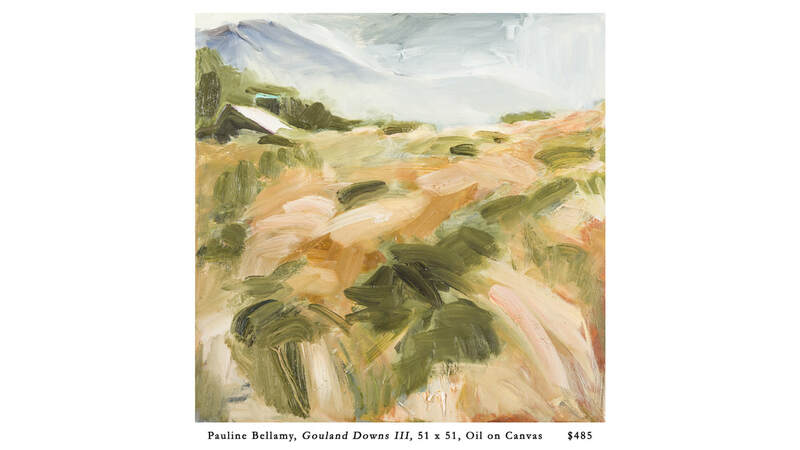 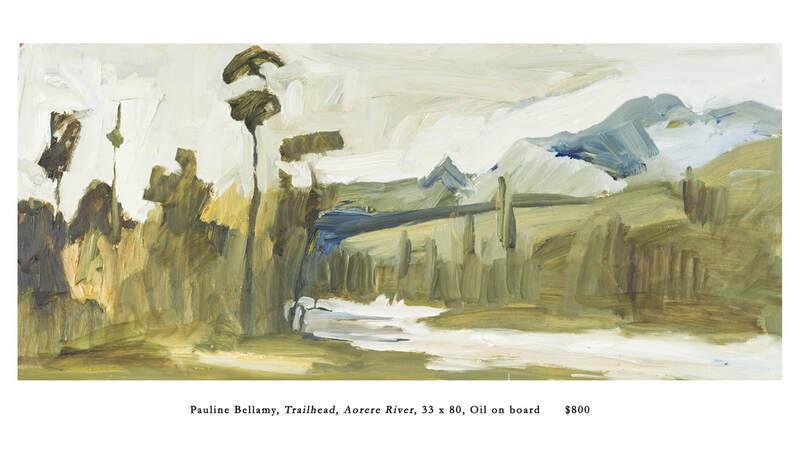 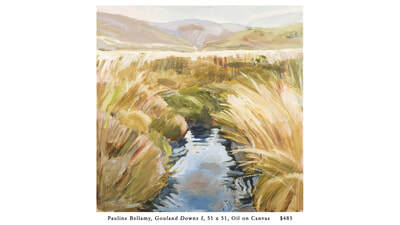 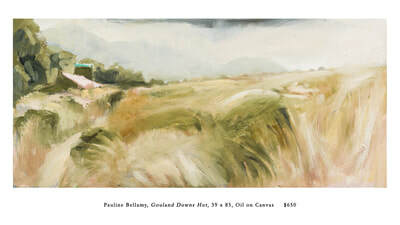 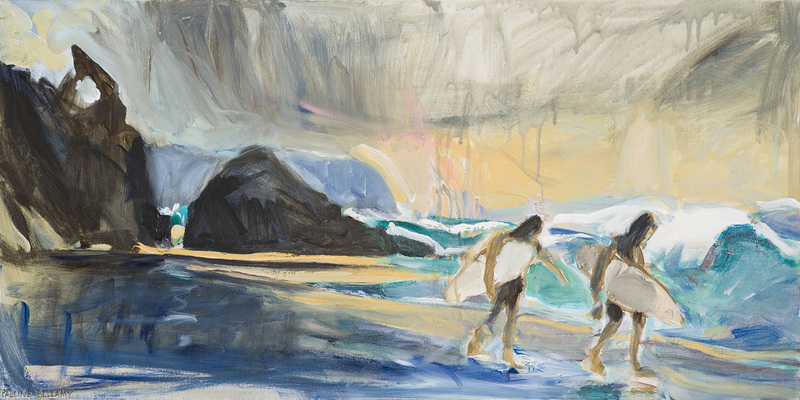 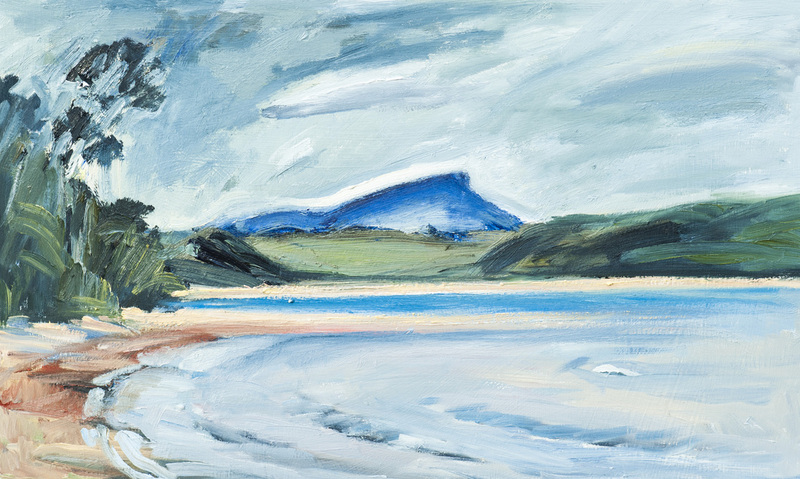 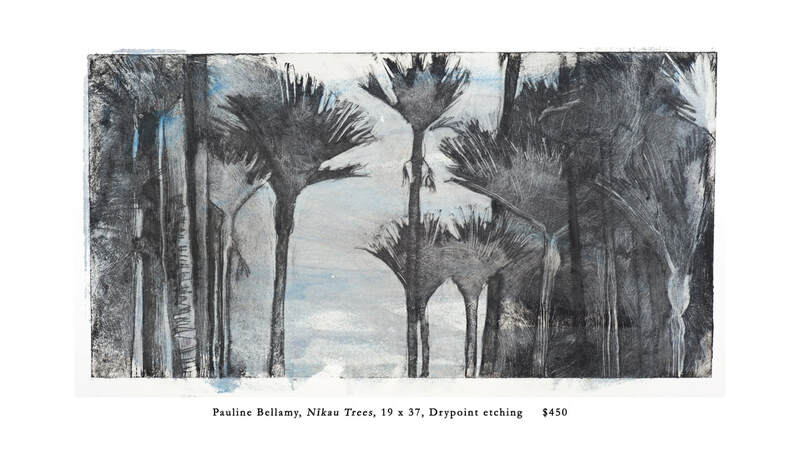 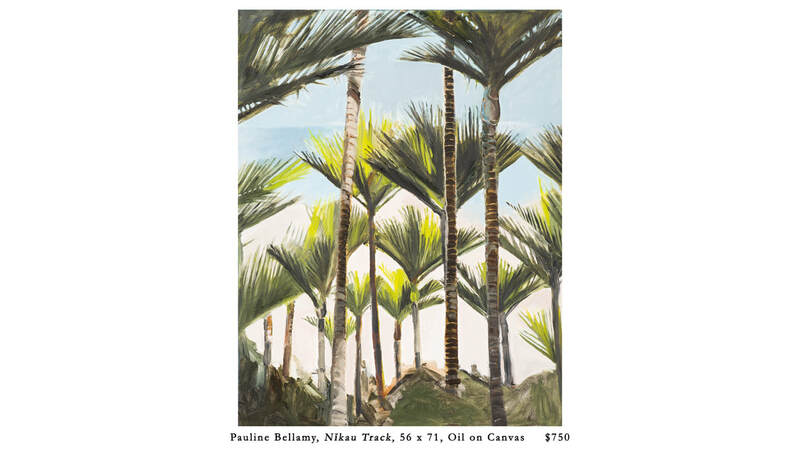 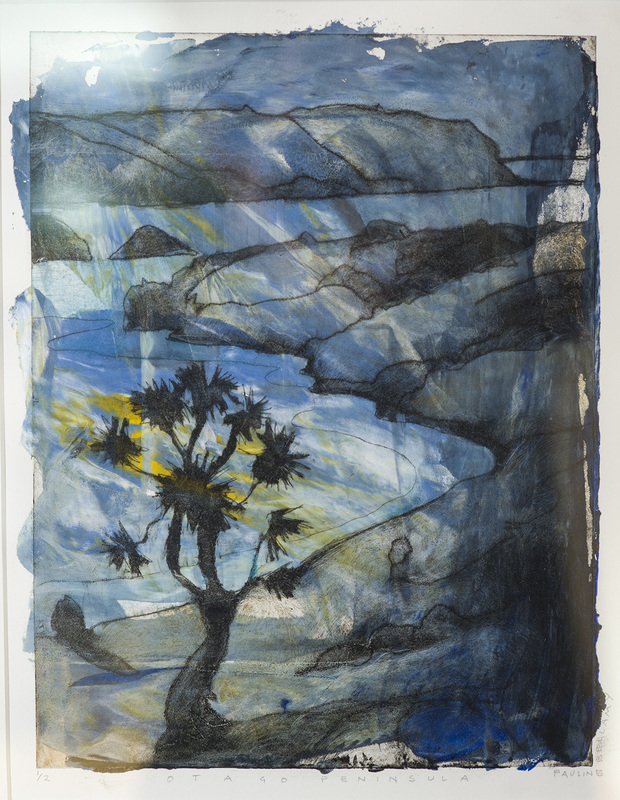 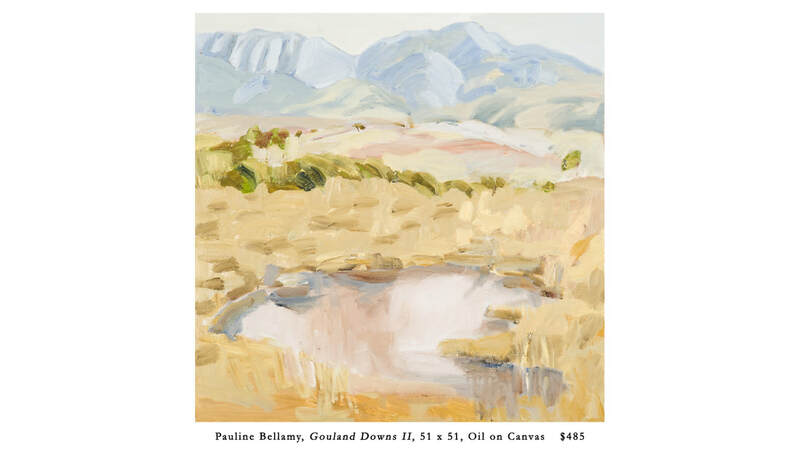 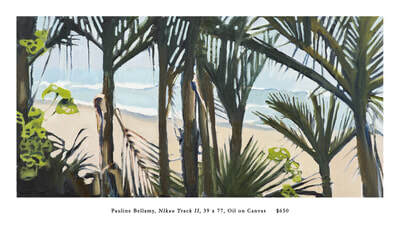 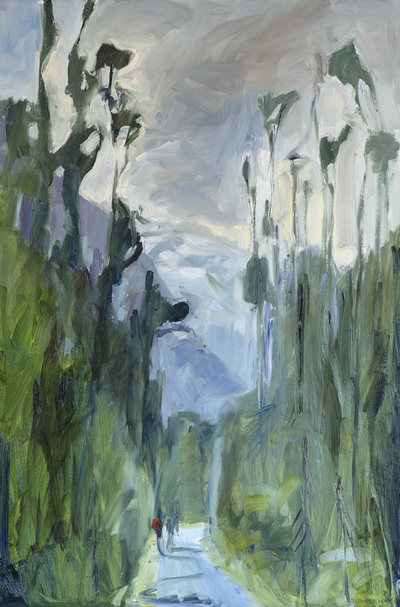 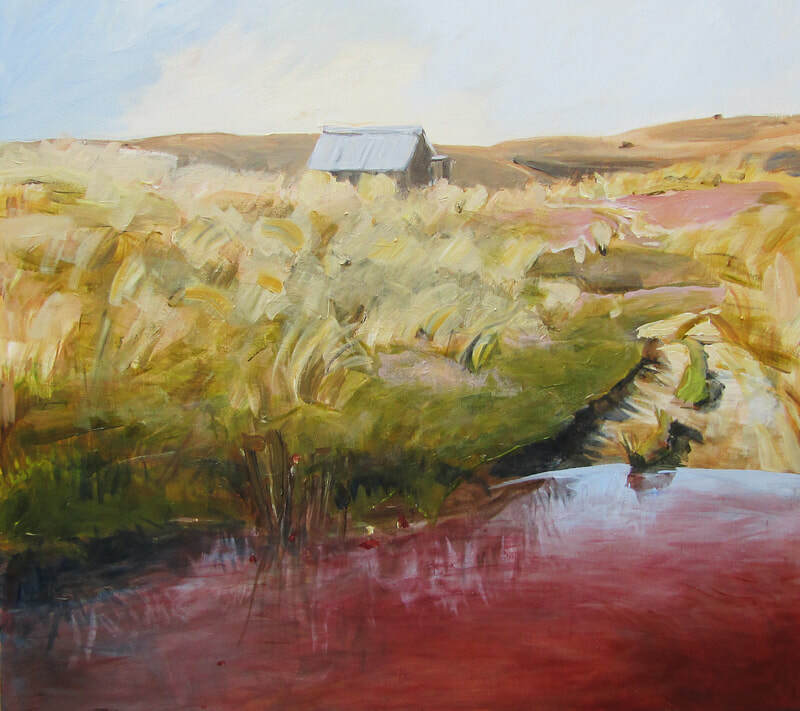 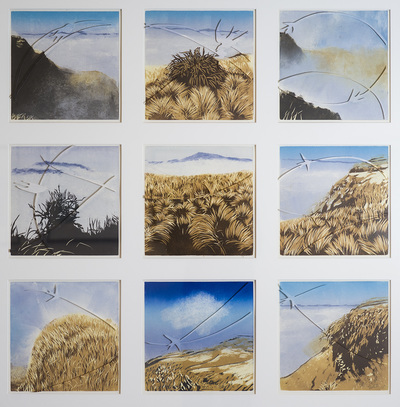 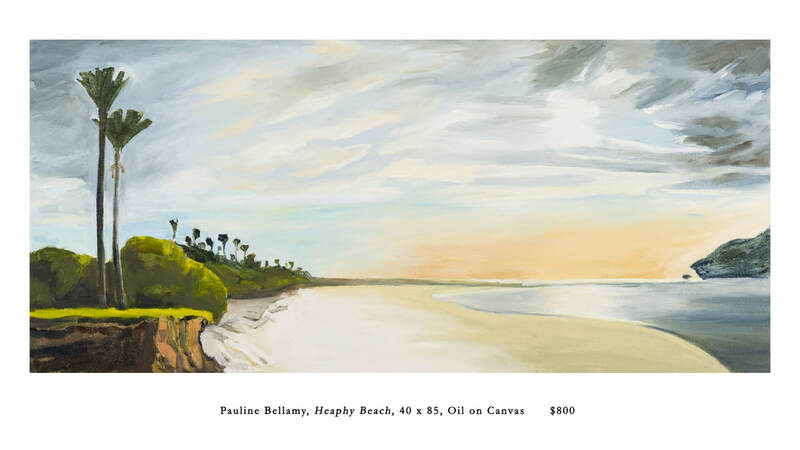 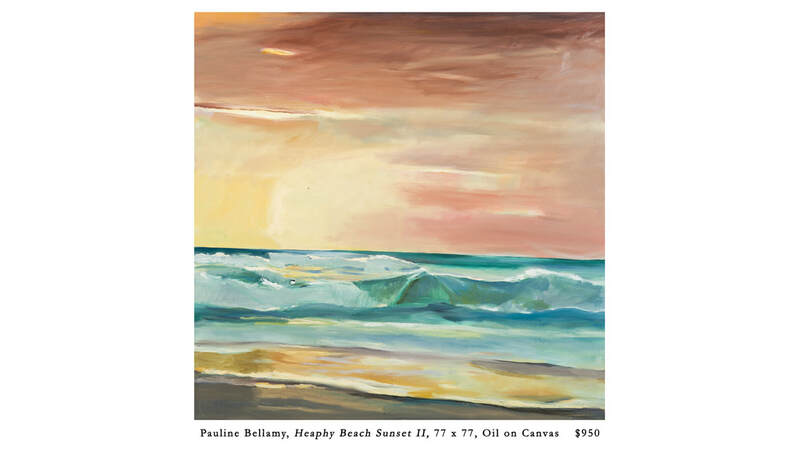 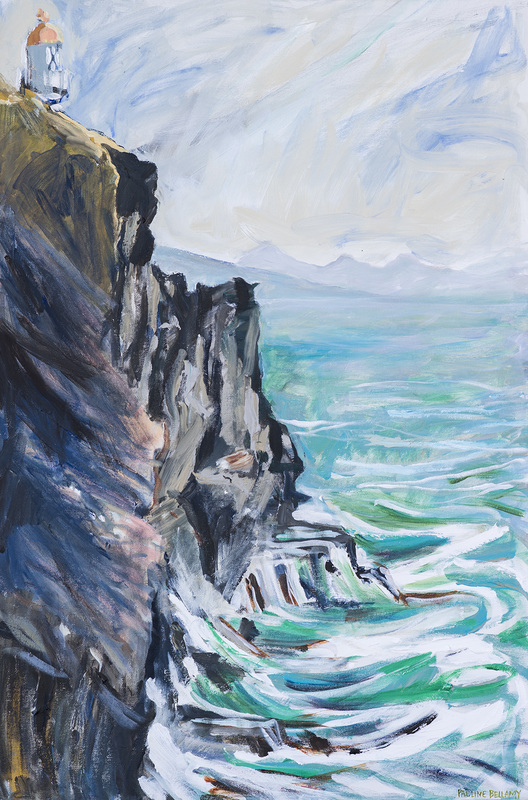 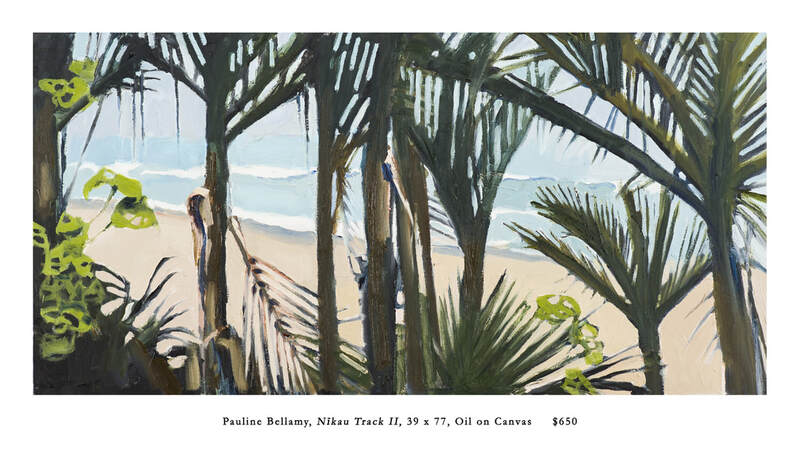 When Pauline Bellamy set about tramping the Heaphy last spring, at every opportunity she stopped to sketch, paint and respond to the striking drama of these environments. 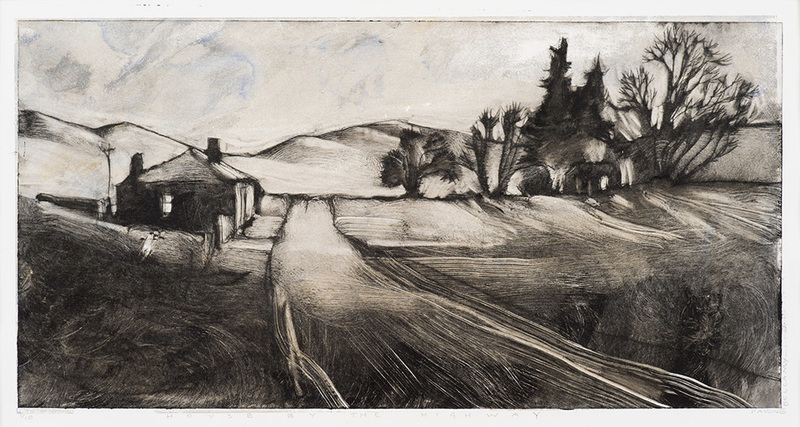 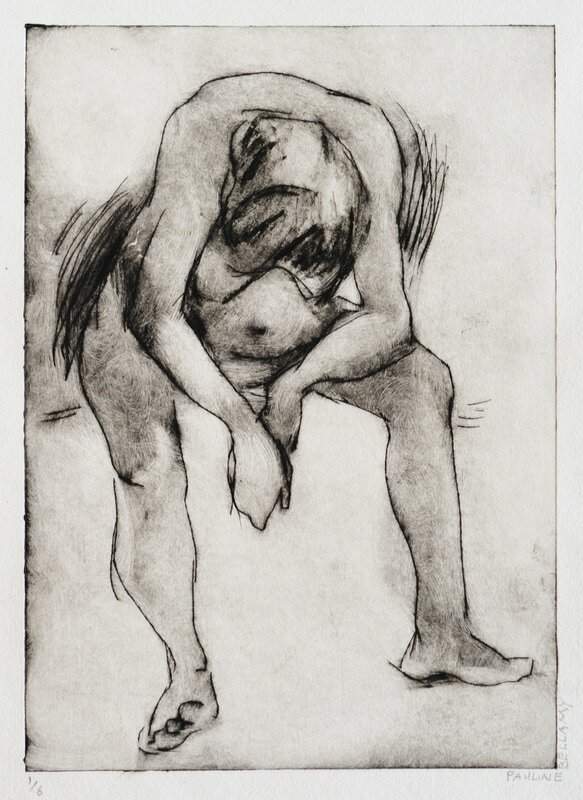 Over the course of the following months, Bellamy has worked to resolve these sketches and impressions into an exceptional new body of painting and etching. 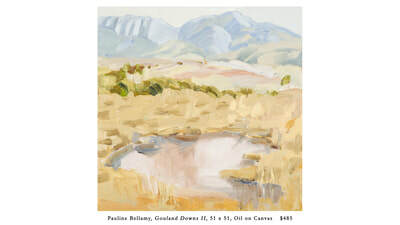 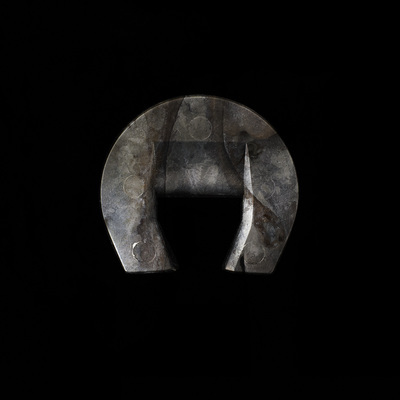 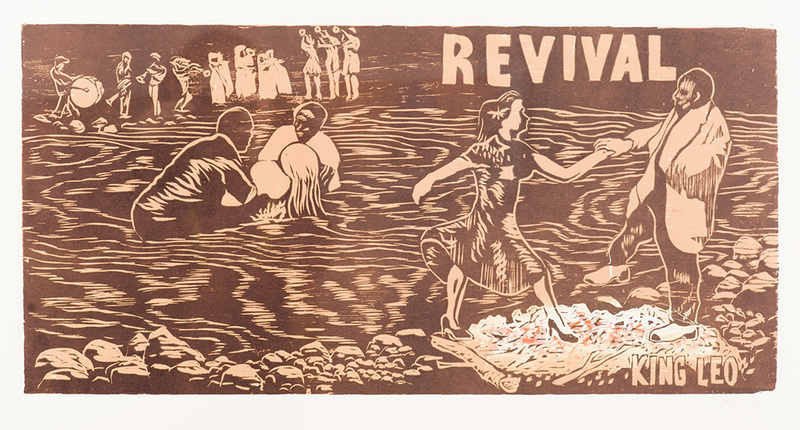 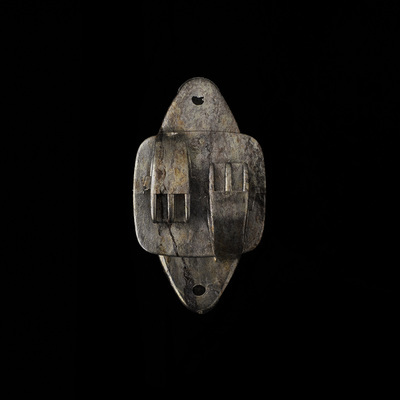 Click here to view a PDF catalogue of all the work in this exhibition. 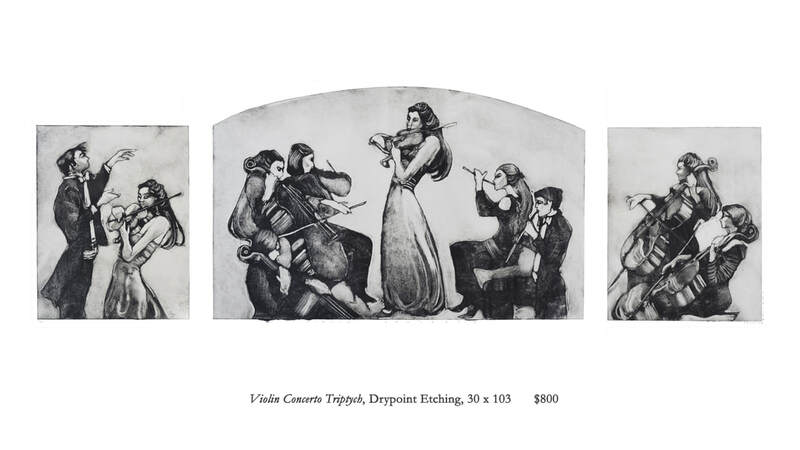 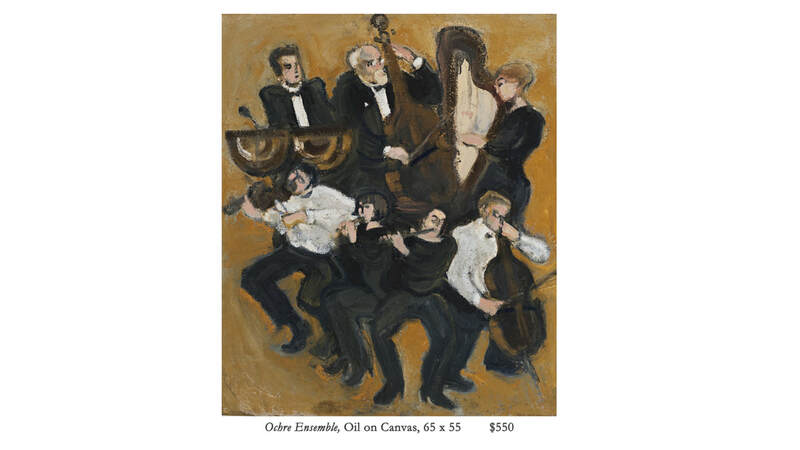 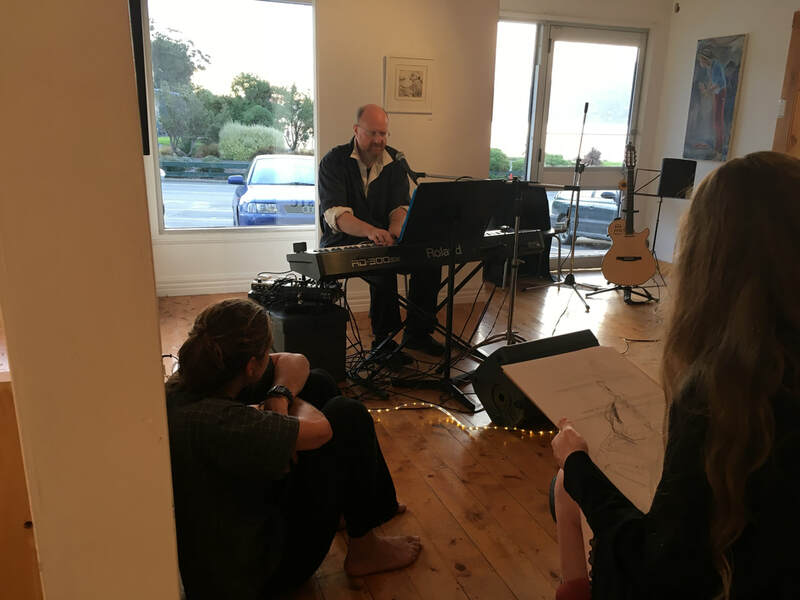 ​As part of the 2018 Dunedin Fringe Festival, Sunday the 11th March is our Drawn to Music concert at Bellamy's Gallery. 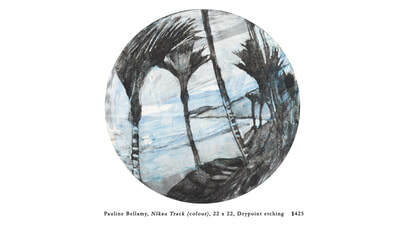 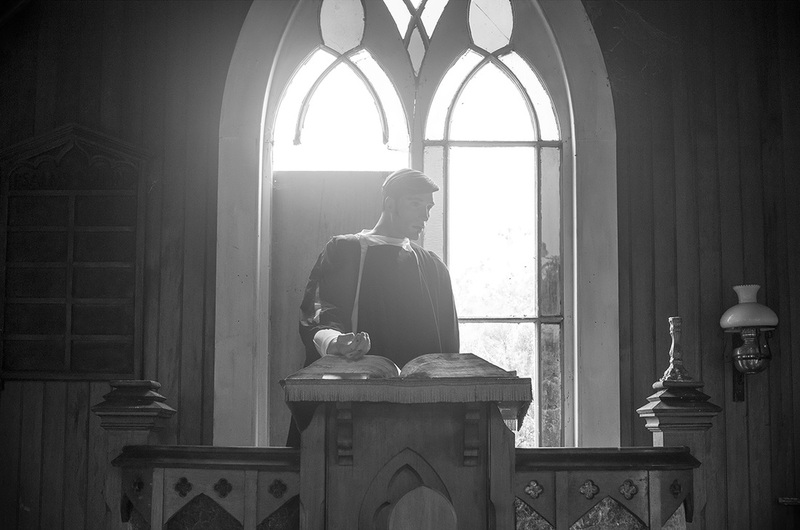 Two deeply evocative Dunedin musicians, Nick Knox & Bethany Robertson invite you to respond to their music. 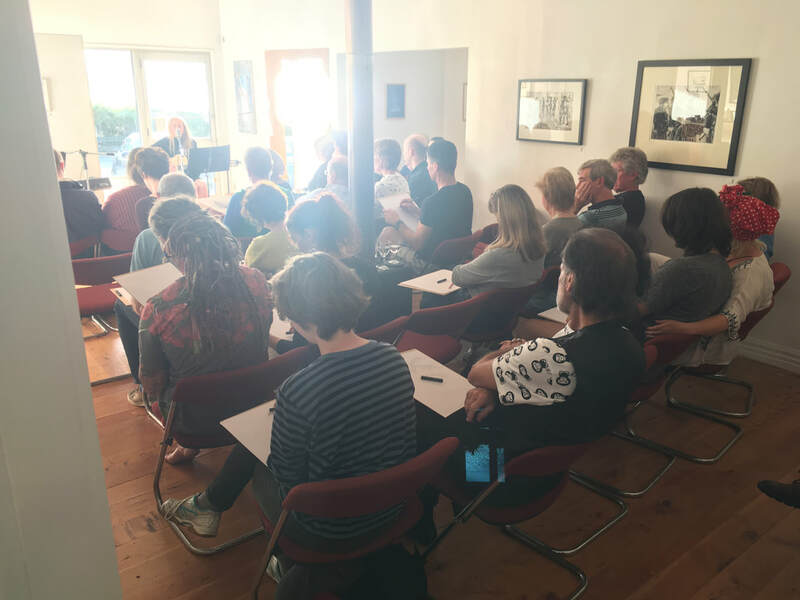 Art materials are provided, such that if you feel inspired, you can journey with them, exploring your own creative flows. 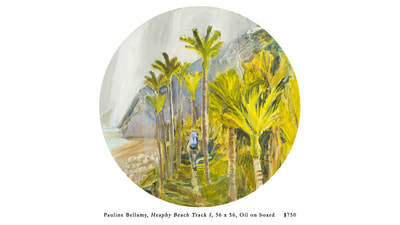 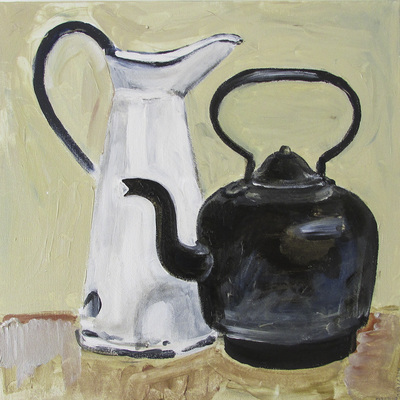 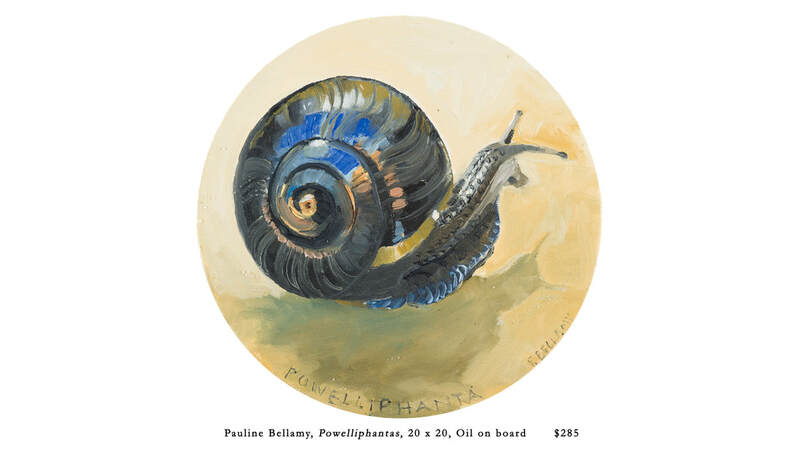 Our concert is set alongside an exhibition of new and old Pauline Bellamy artwork inspired by music. 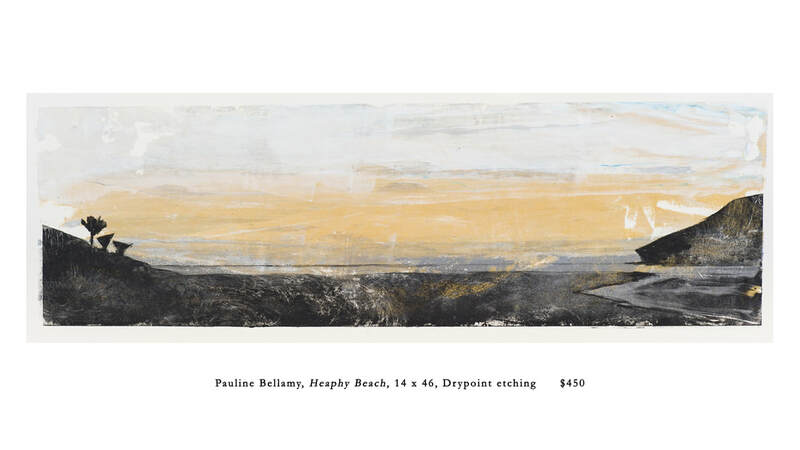 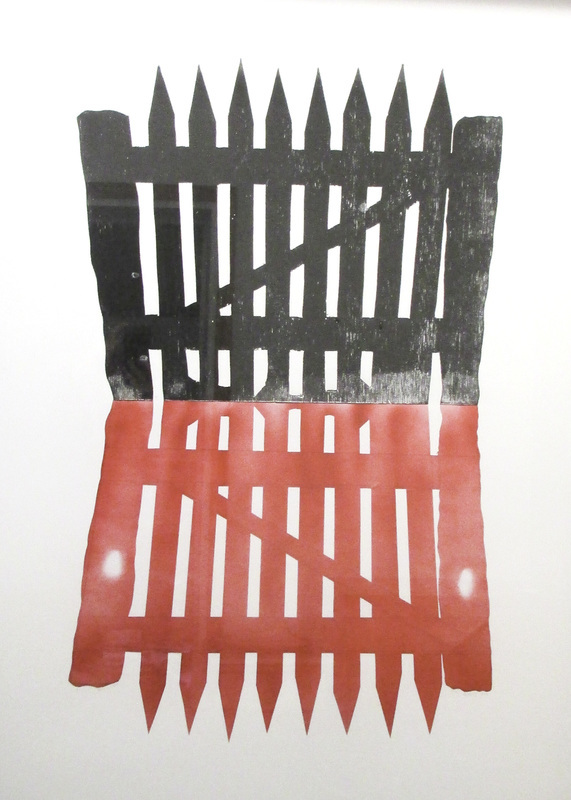 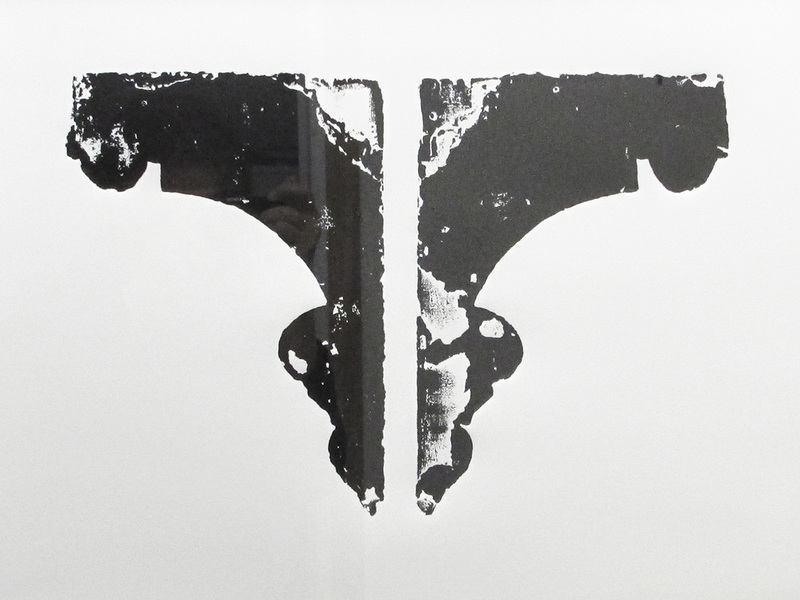 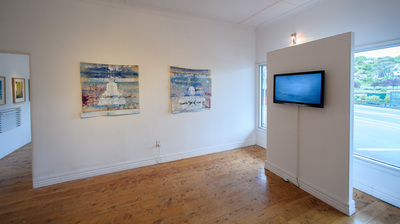 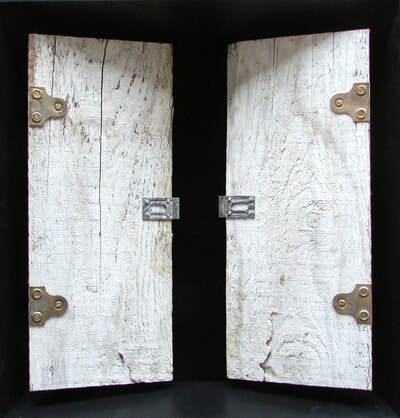 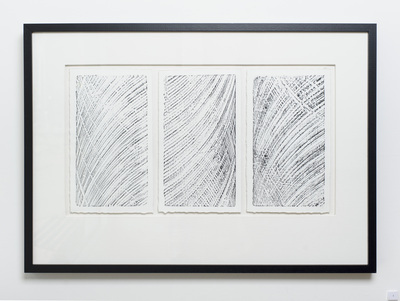 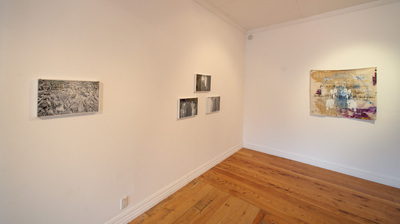 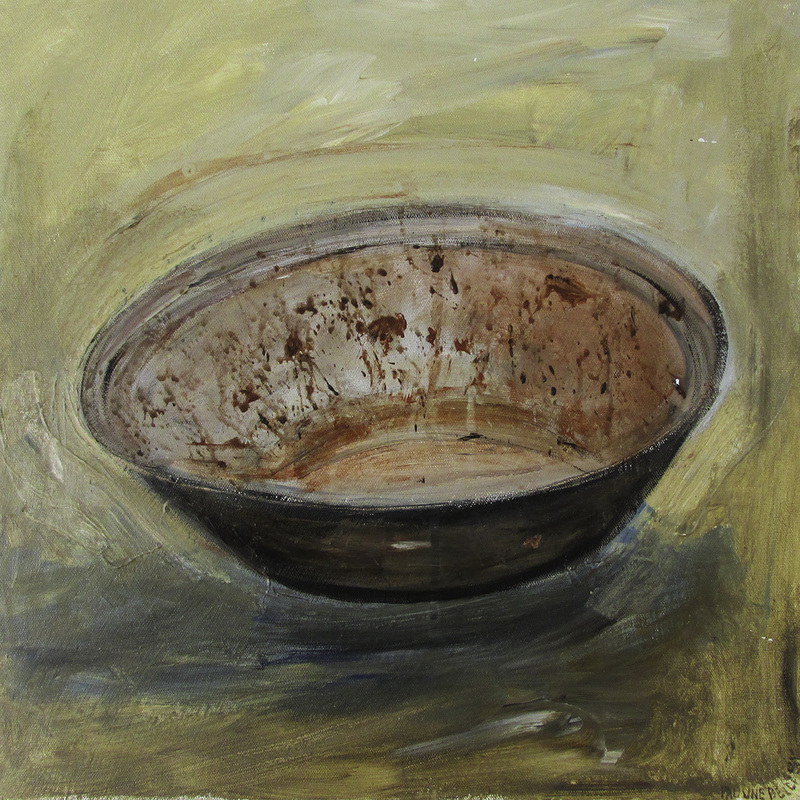 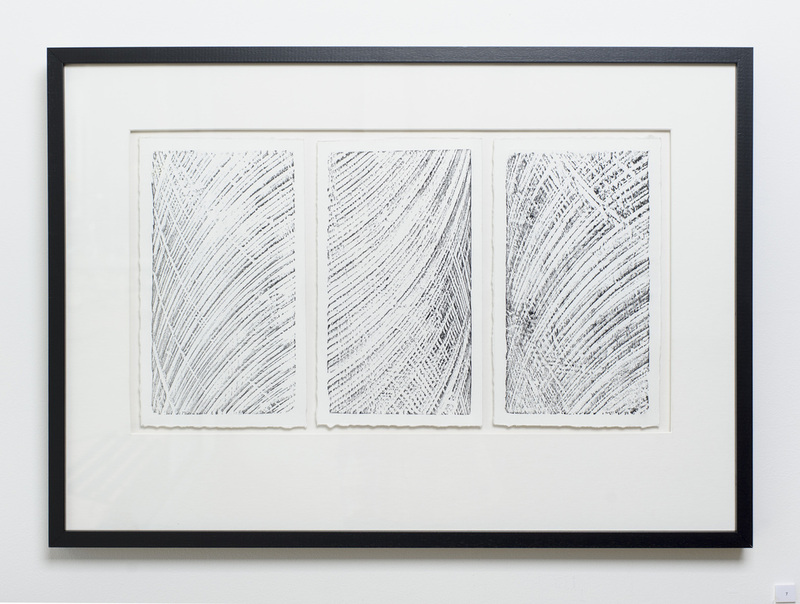 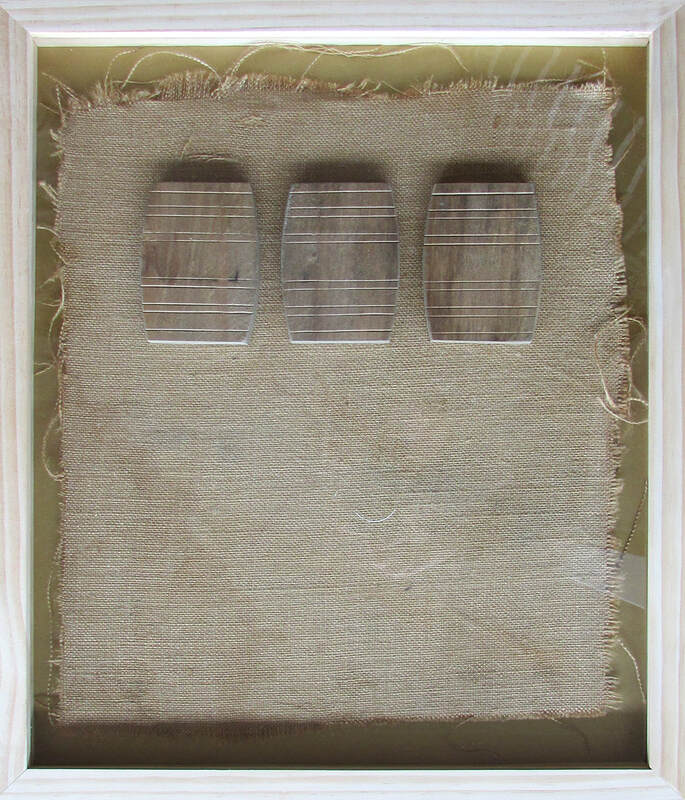 Weathered features new work by Pauline Bellamy, Manu Berry and John Bellamy. 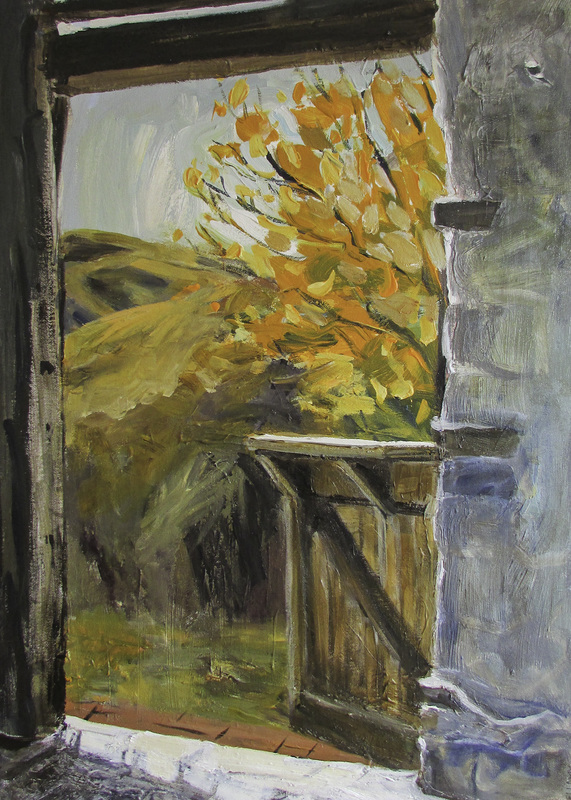 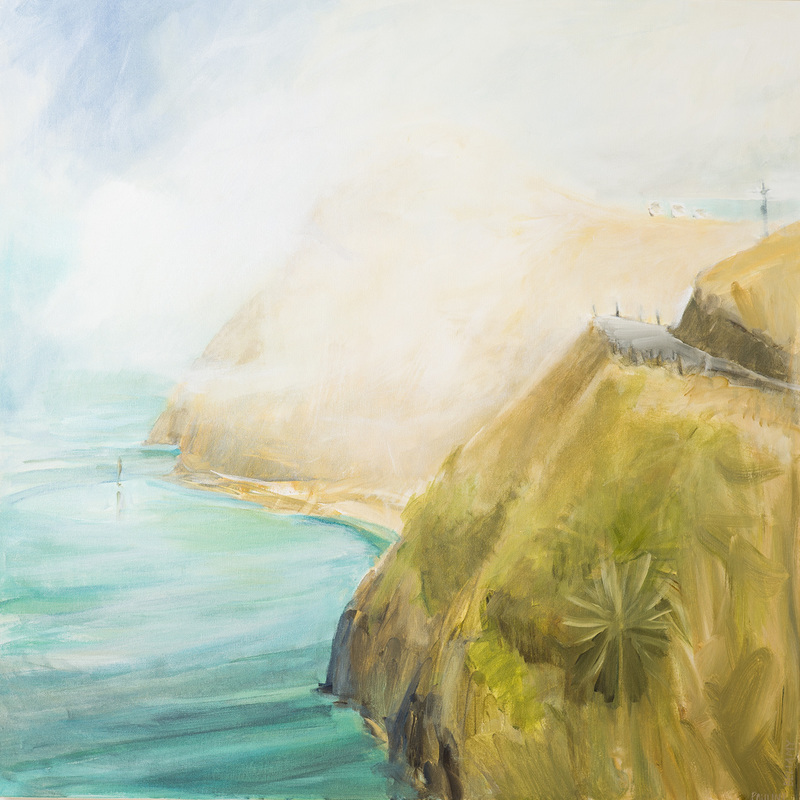 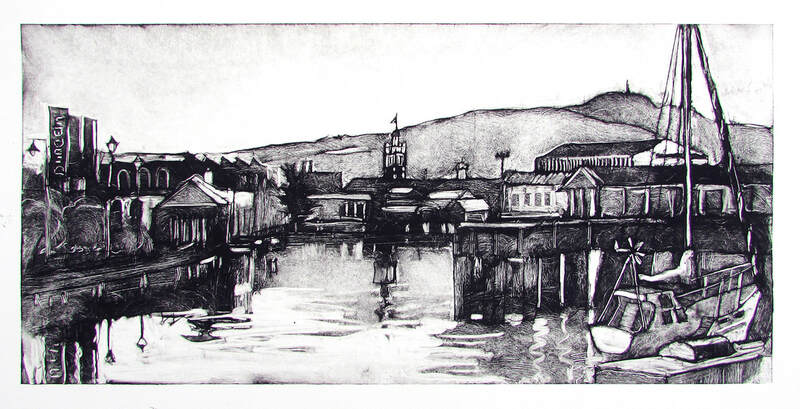 The varied, curious areas built around the edge of the Otago Harbour have become the subject of detailed explorations by each of our artists. A diverse range of graphic techniques comes together to capture these picturesque environments. 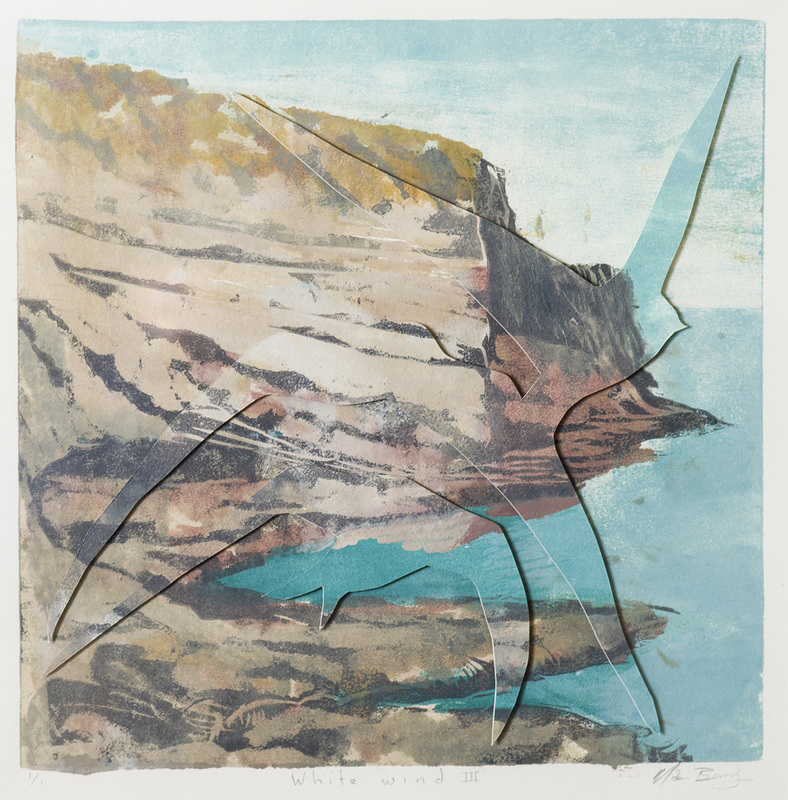 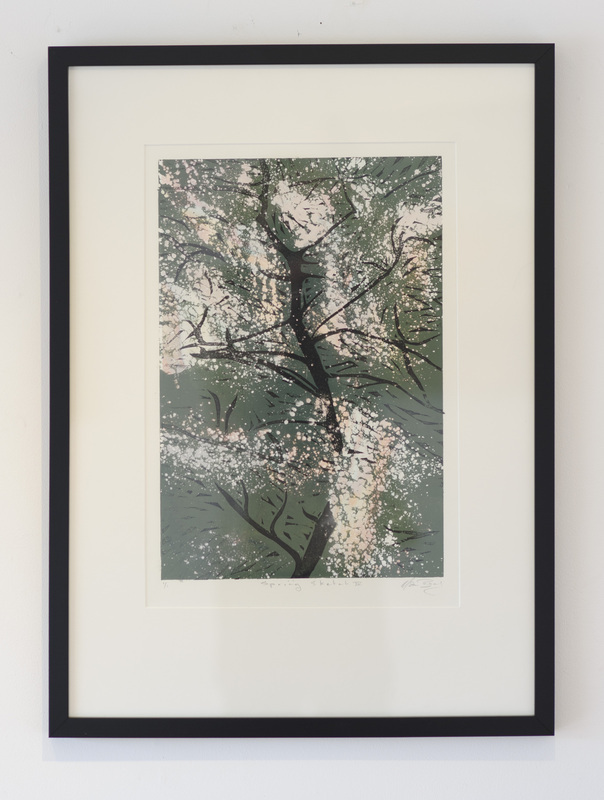 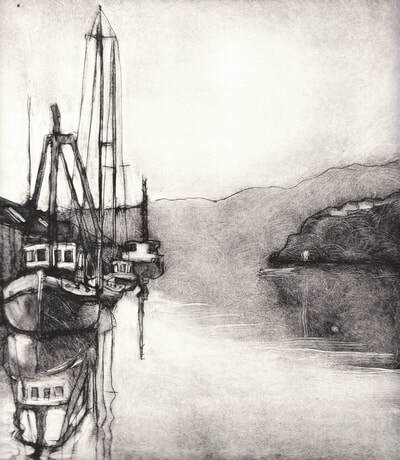 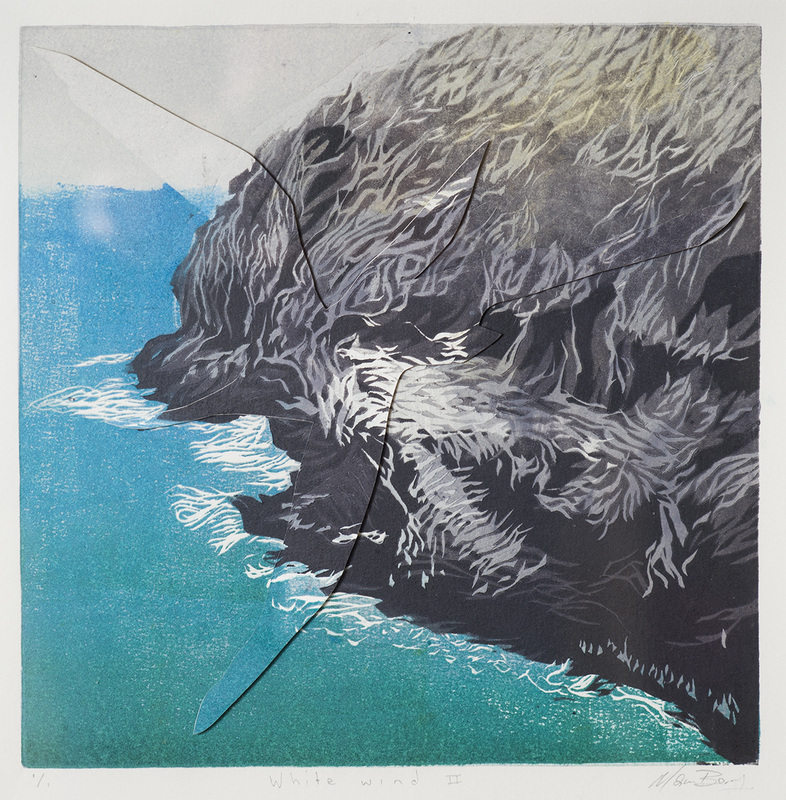 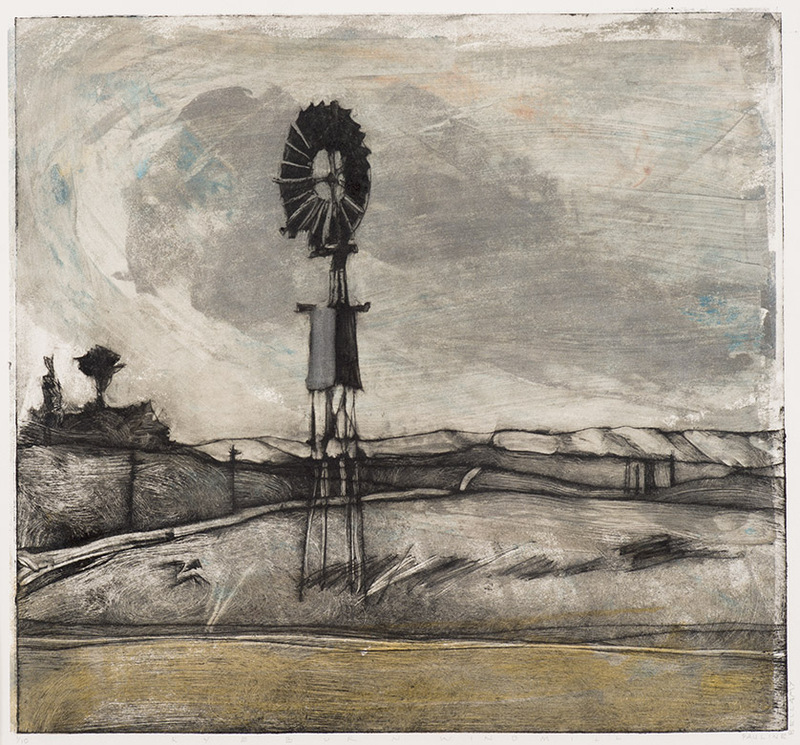 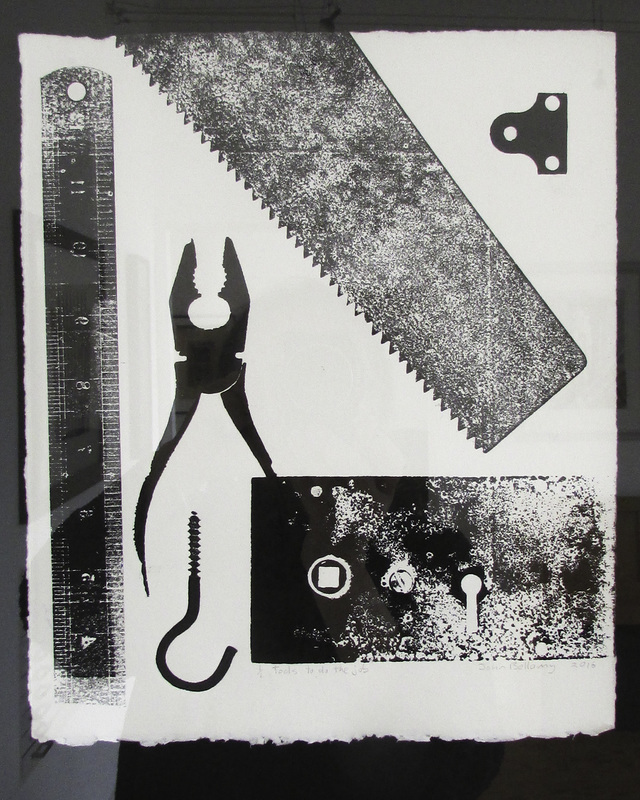 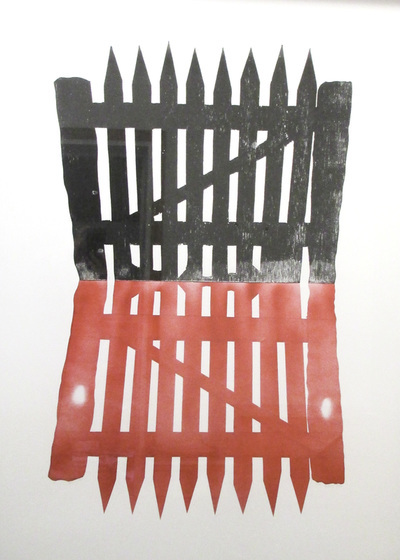 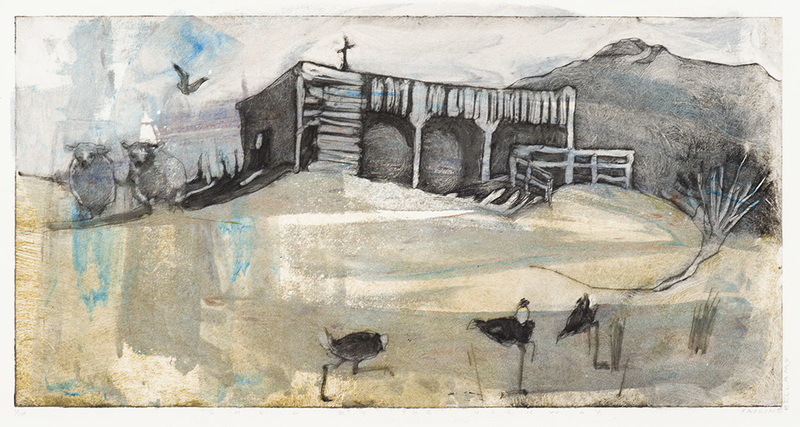 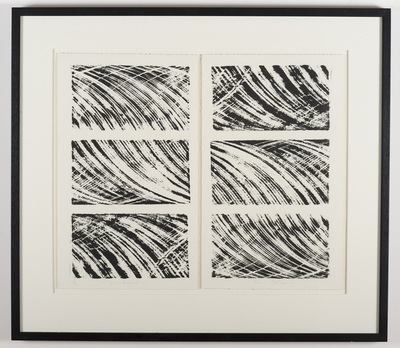 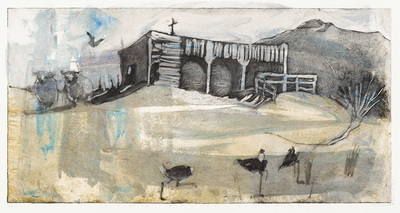 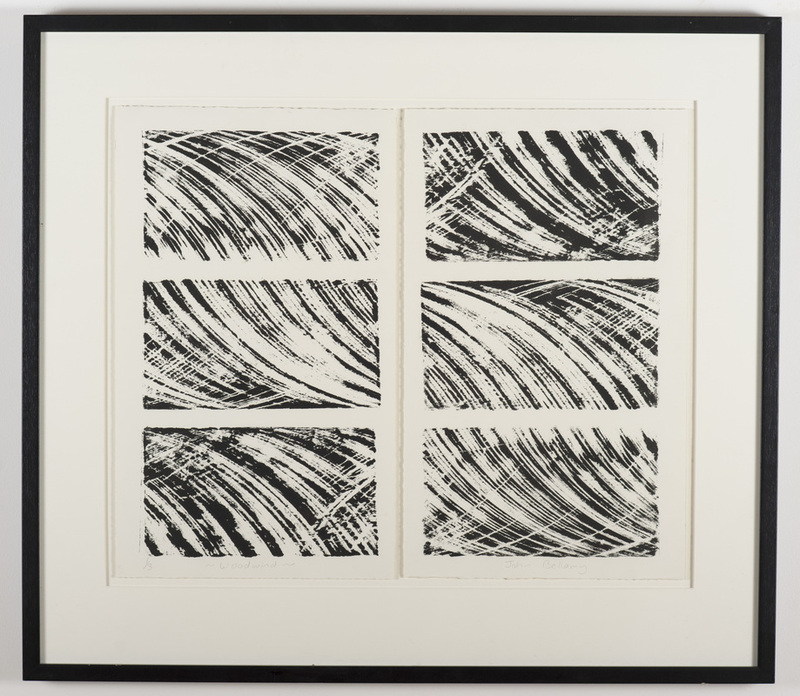 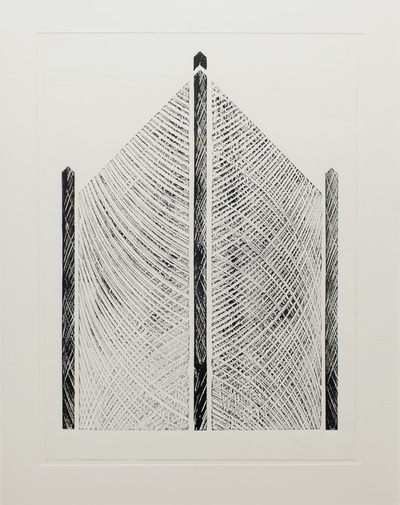 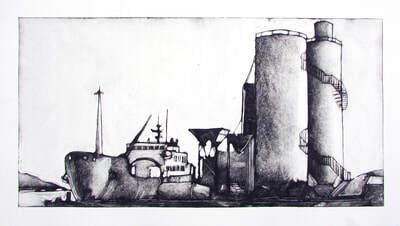 In Pauline and John Bellamy's pieces, the working area’s of the industrial inner harbour have inspired a series of composed, geometric drypoint etchings and playful mixed media textural studies. 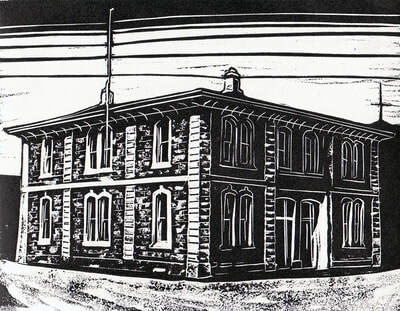 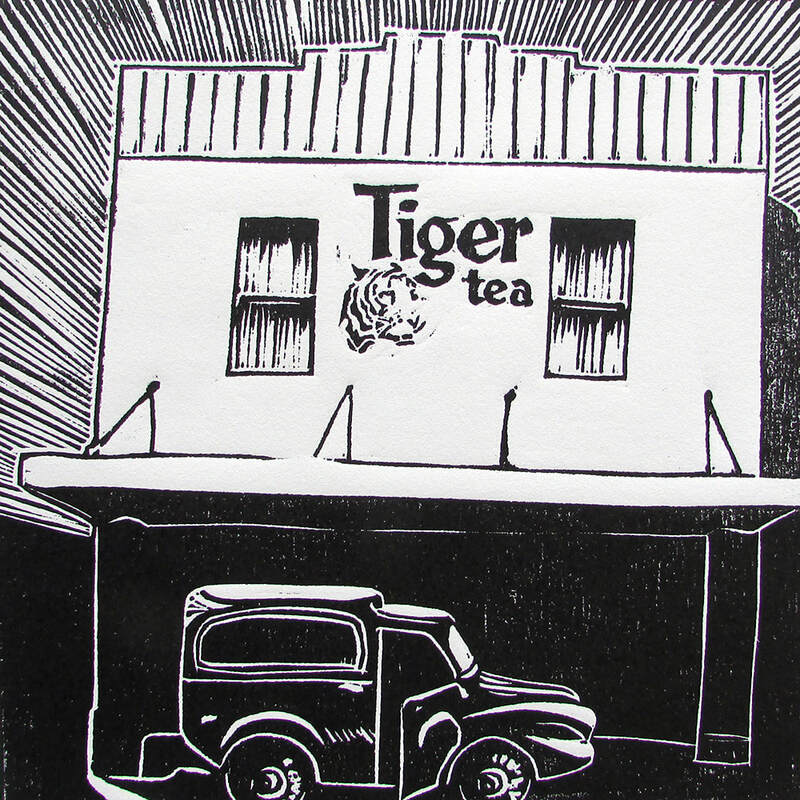 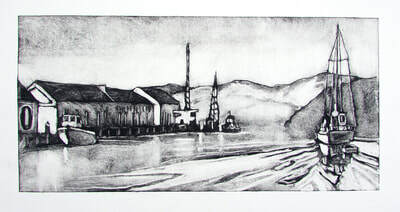 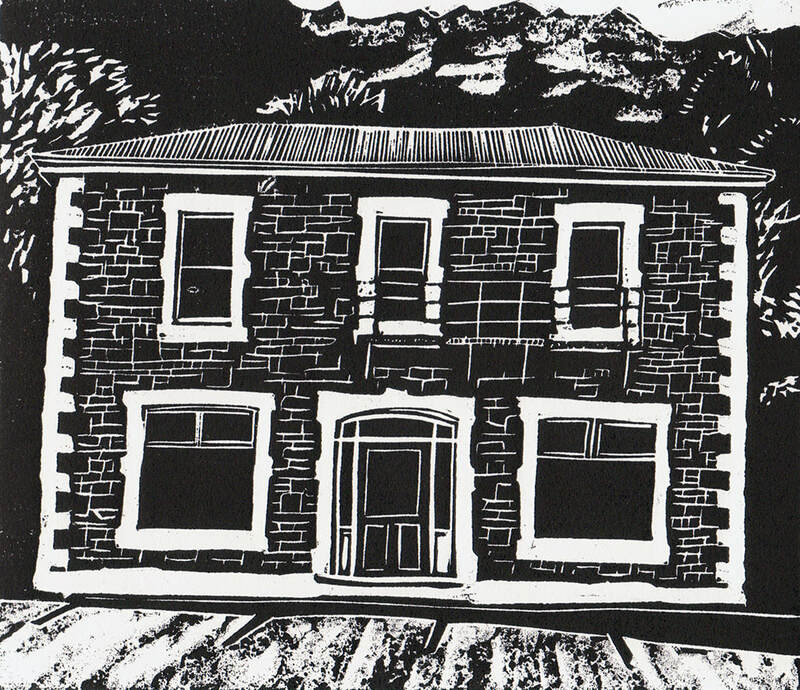 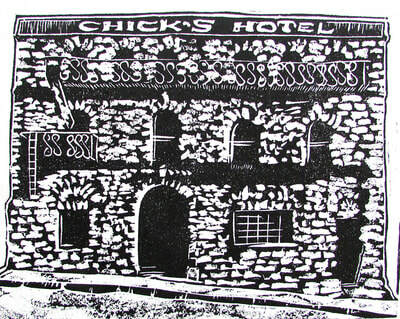 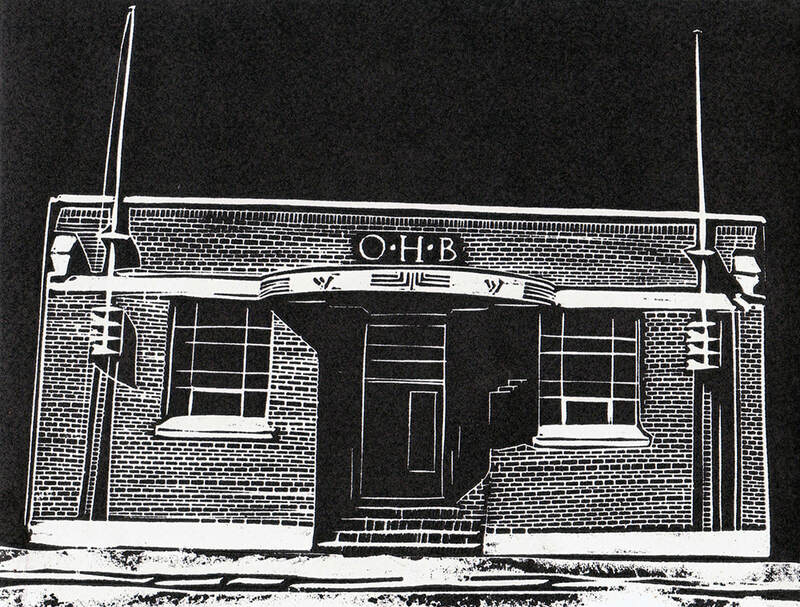 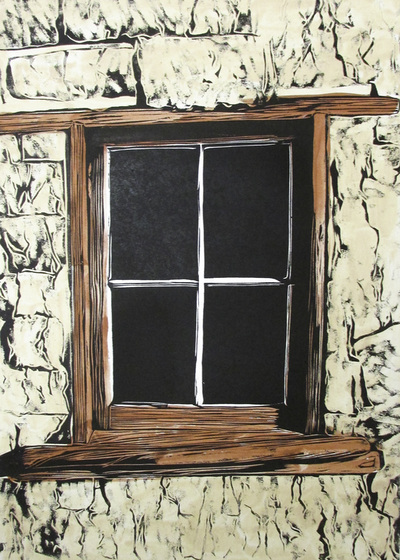 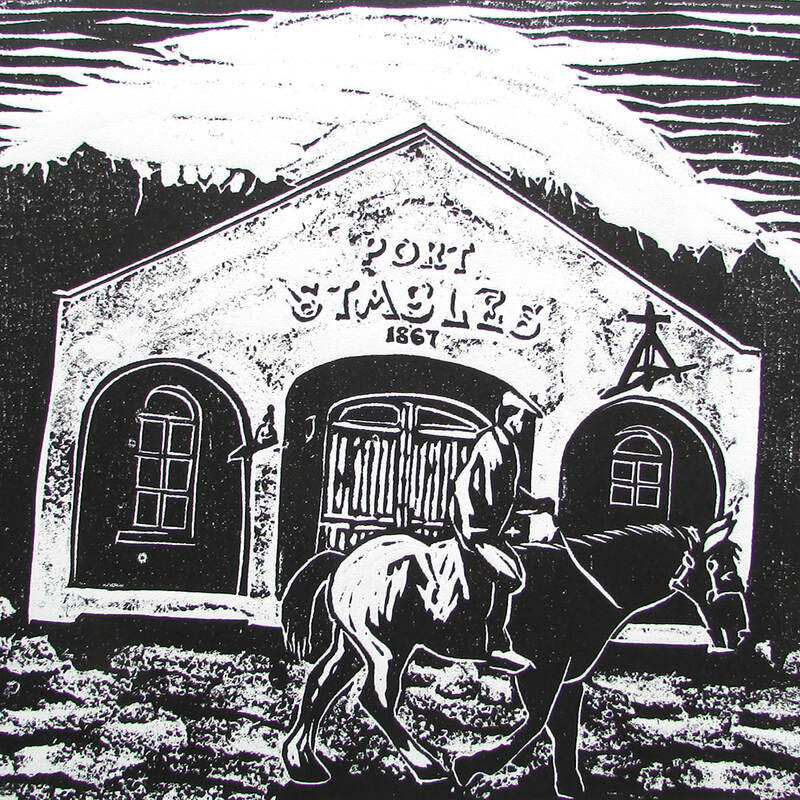 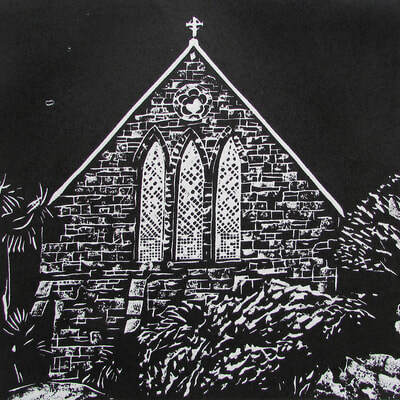 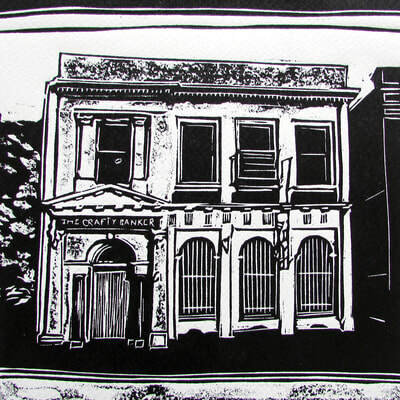 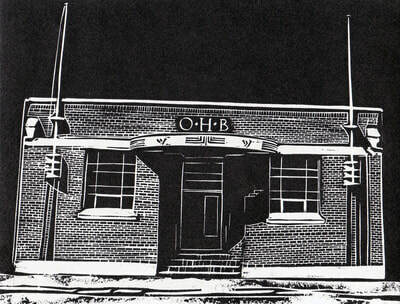 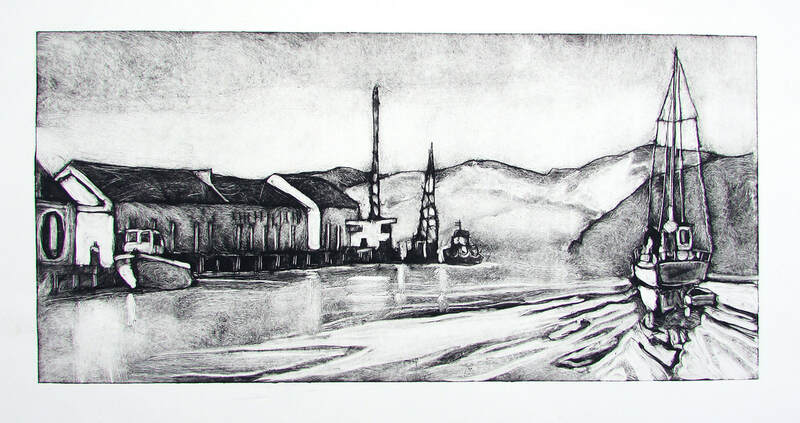 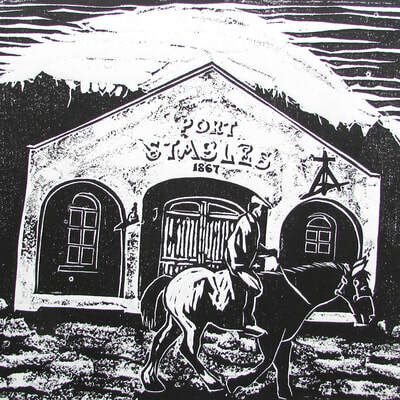 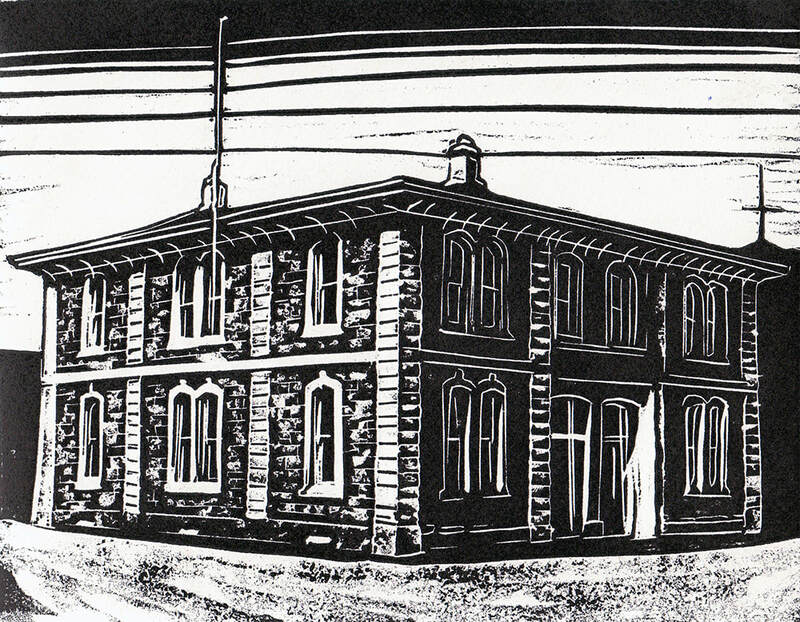 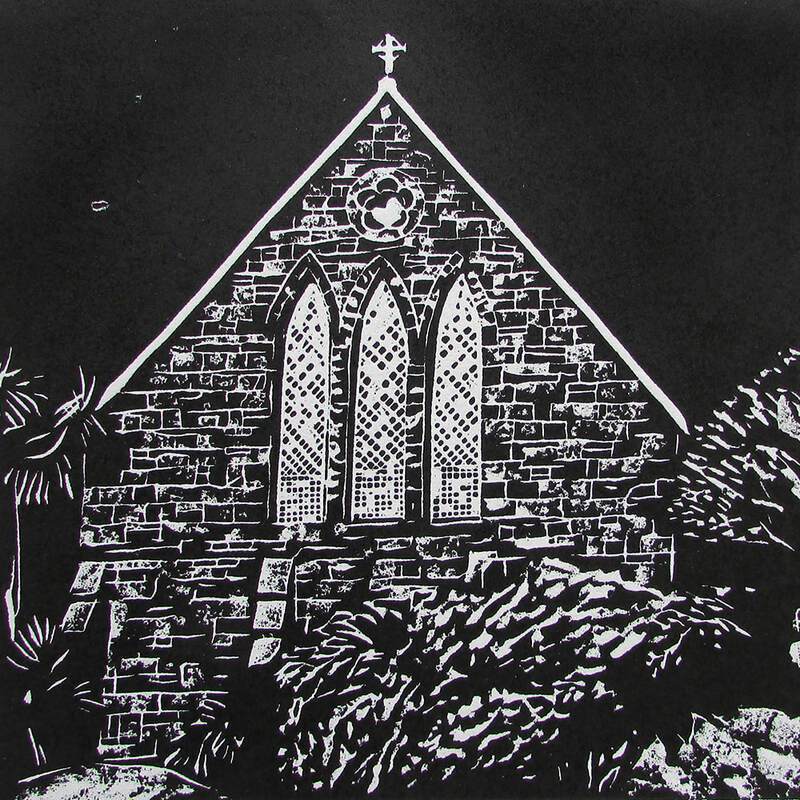 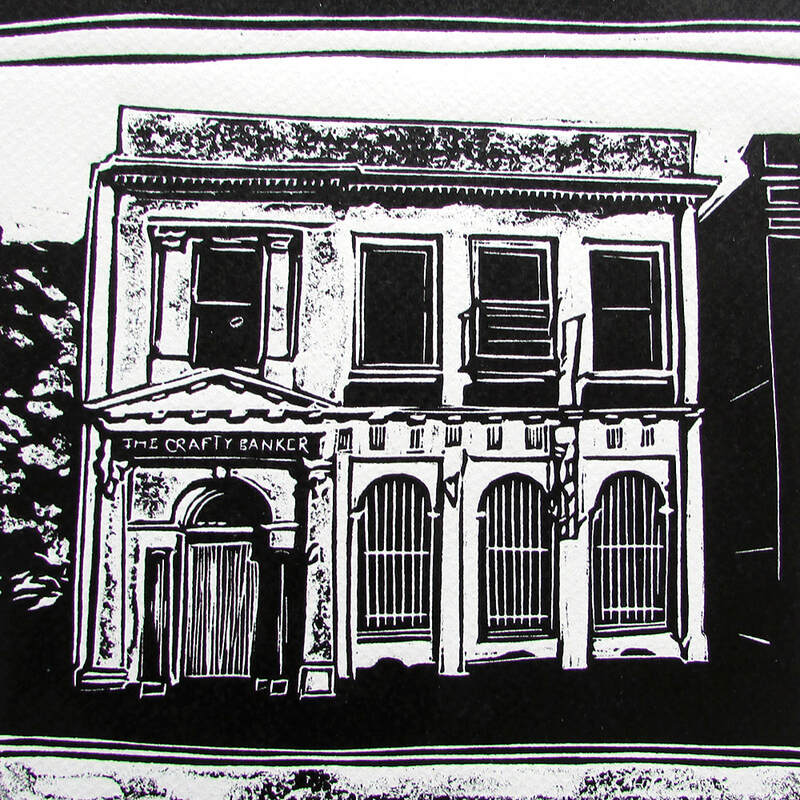 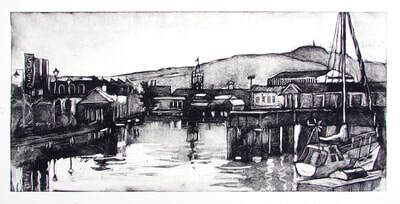 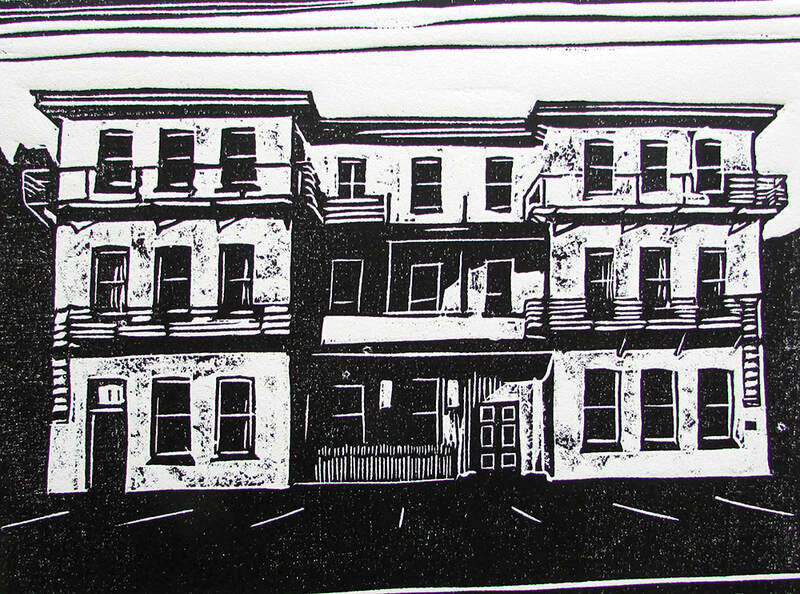 Manu Berry has focused on the Port Chalmers area, isolating distinctive and recognisable vignettes of some of the iconic local architecture in a series of striking monochromatic woodcut prints. 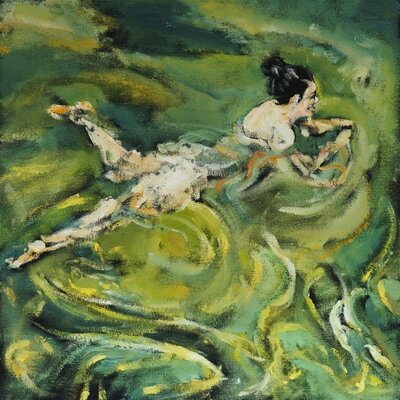 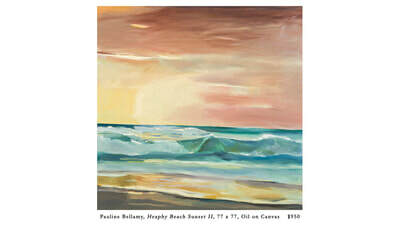 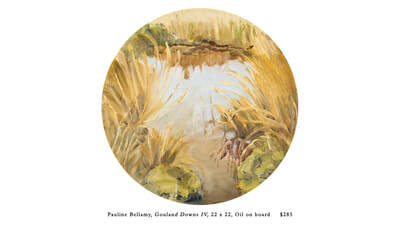 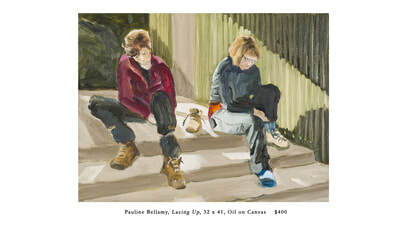 Bathers / Bodies presents a suite of new work by Manu Berry and Pauline Bellamy. 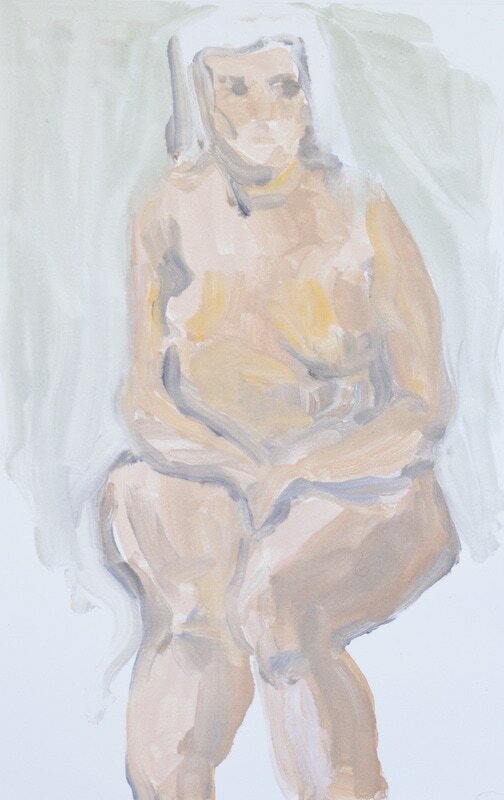 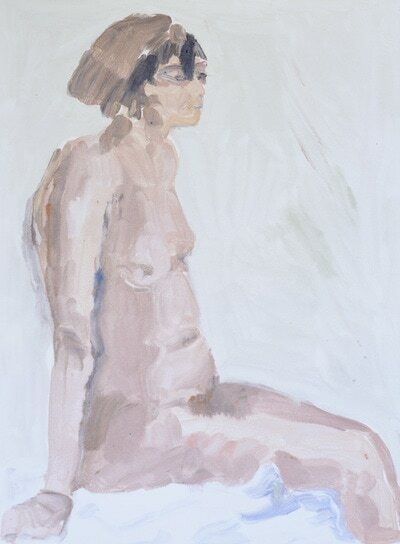 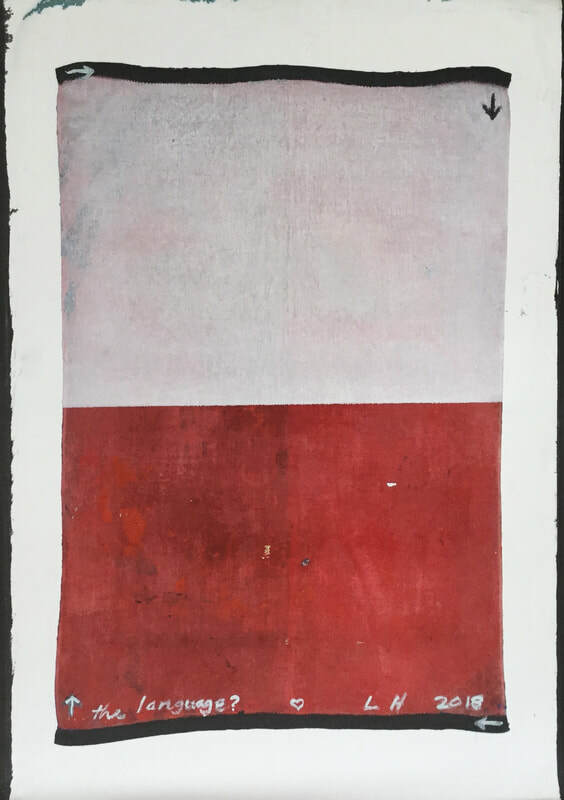 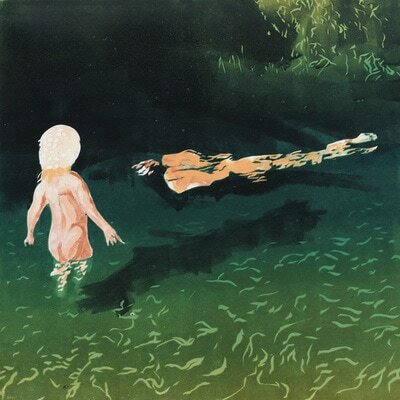 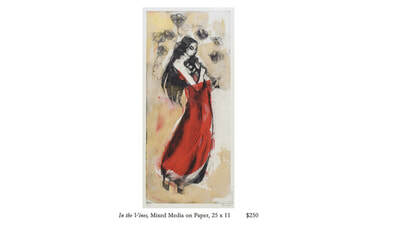 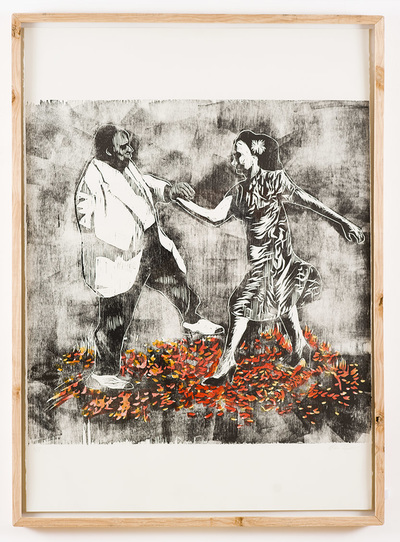 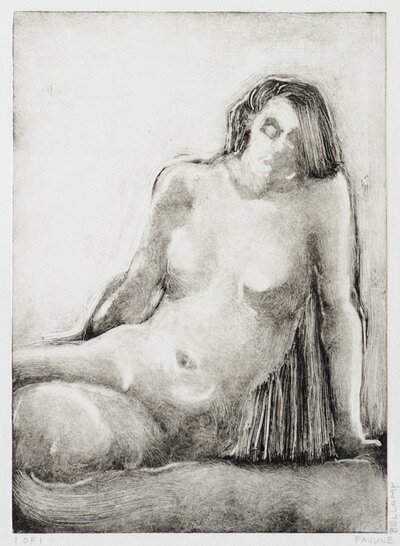 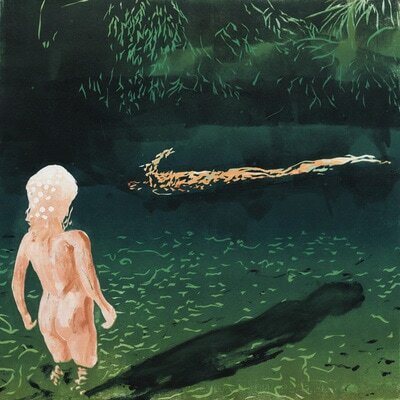 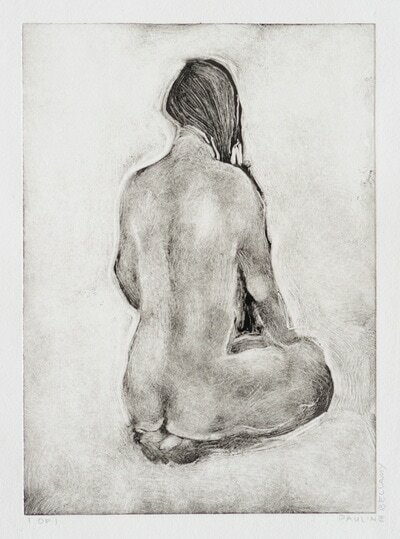 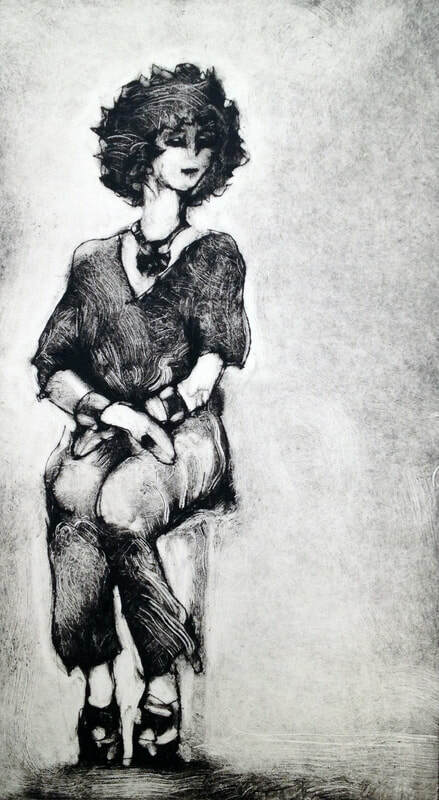 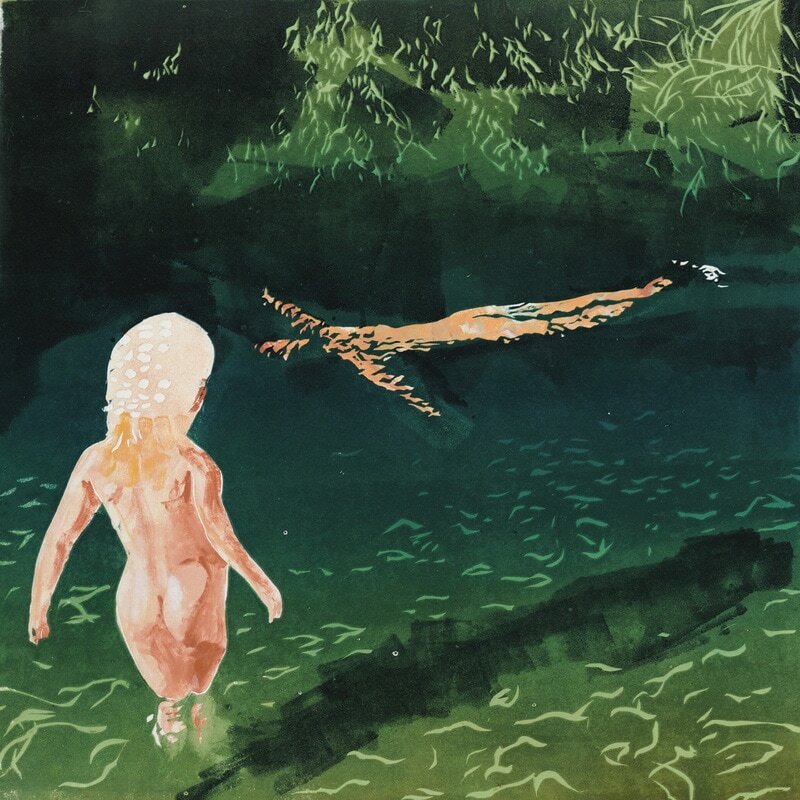 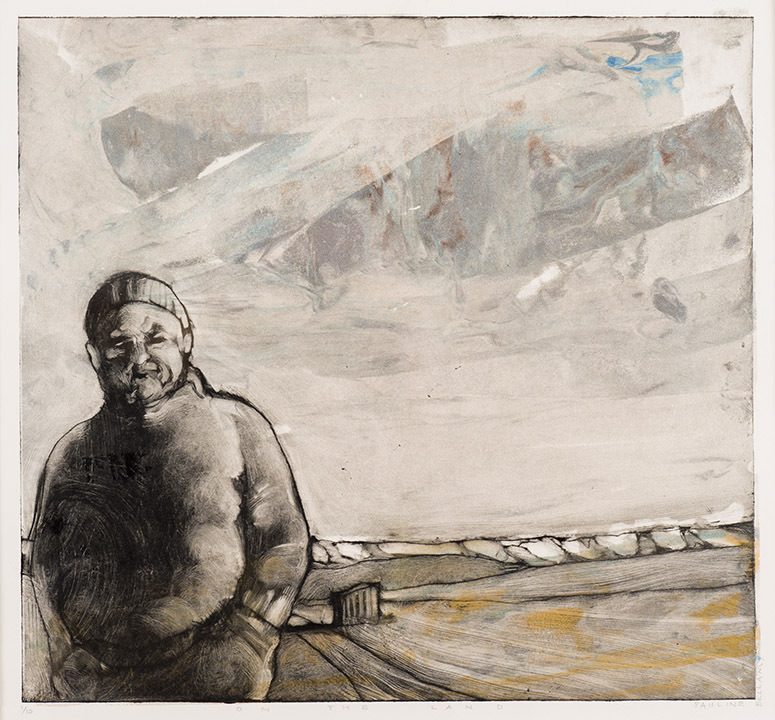 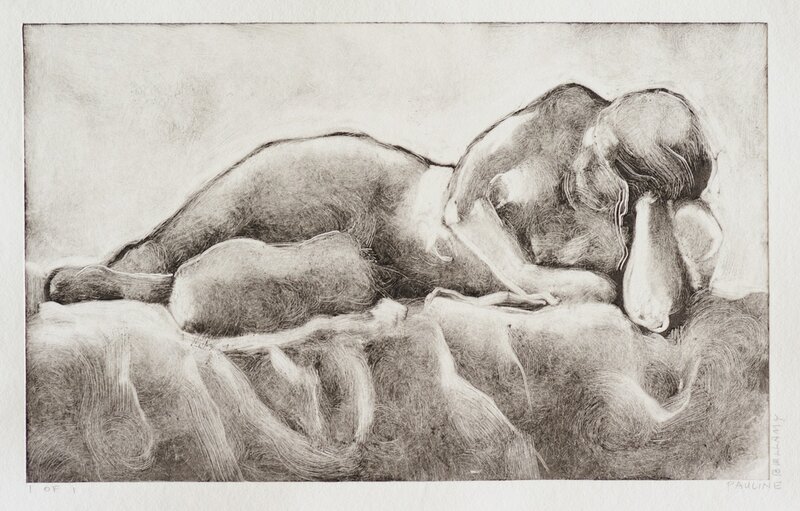 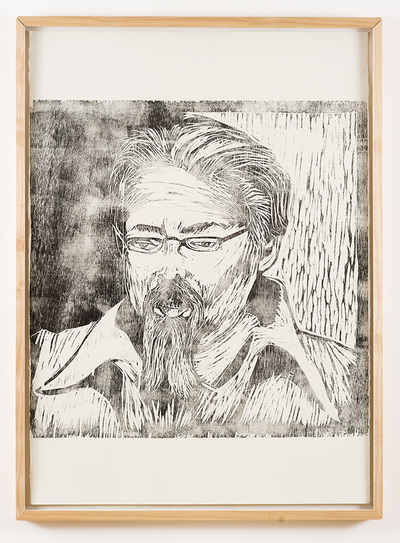 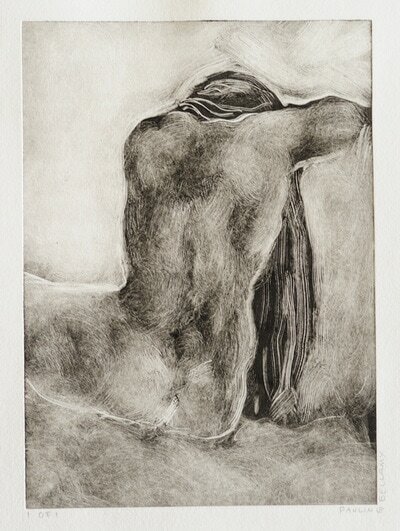 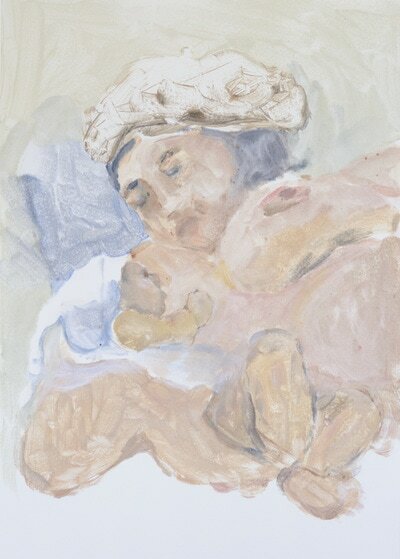 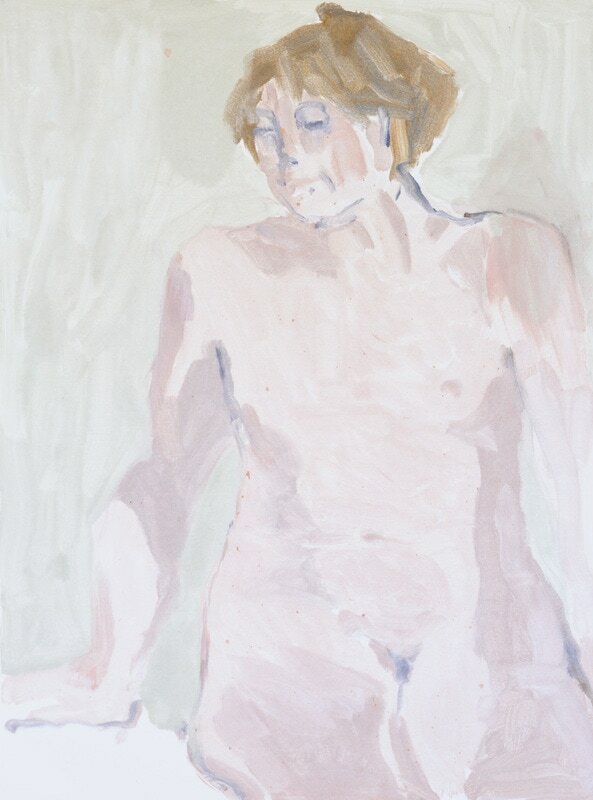 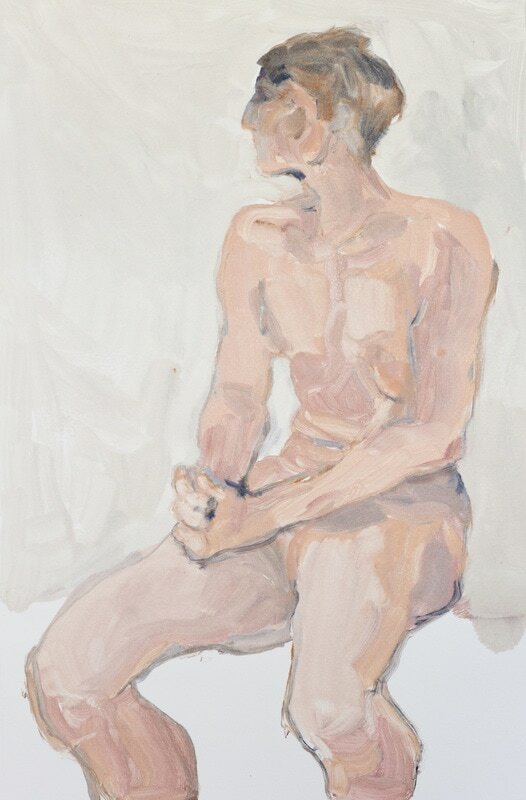 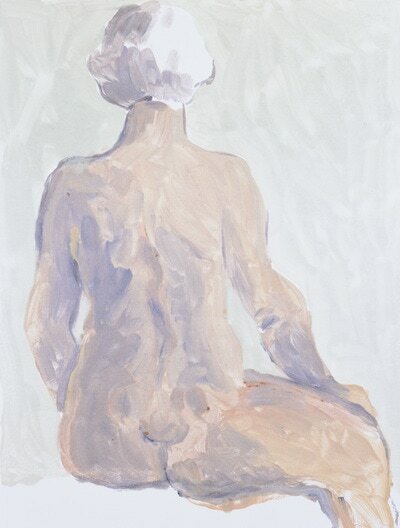 Bellamy’s new series Whispered Monoprints employ a muted palette to compassionately render the emotionally charged poses held by her life models. 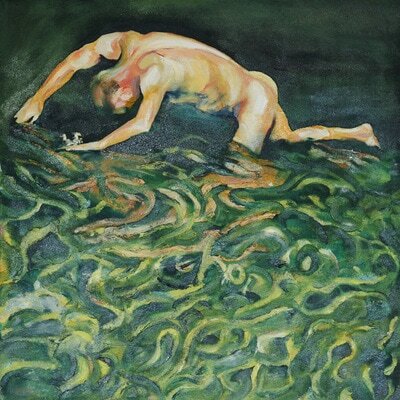 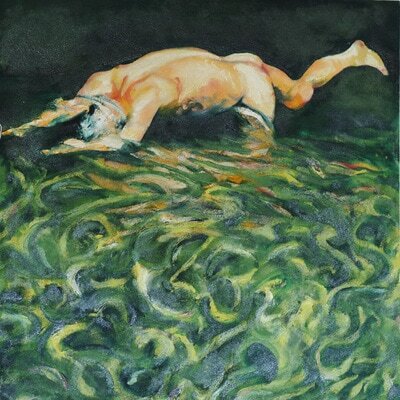 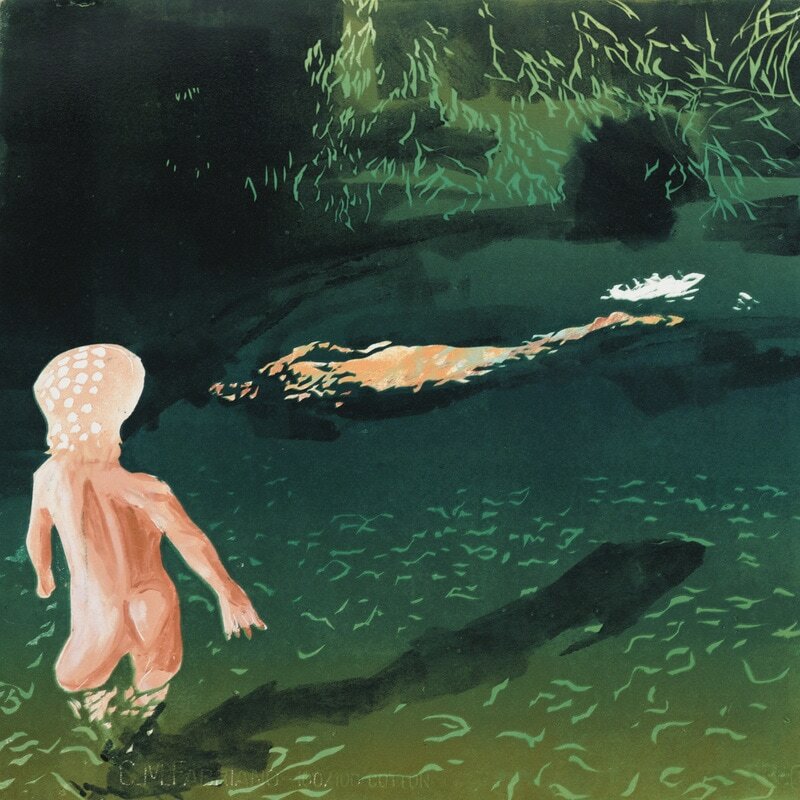 Berry has set his figures within the natural environment, swimming and bathing in lakes and rivers. 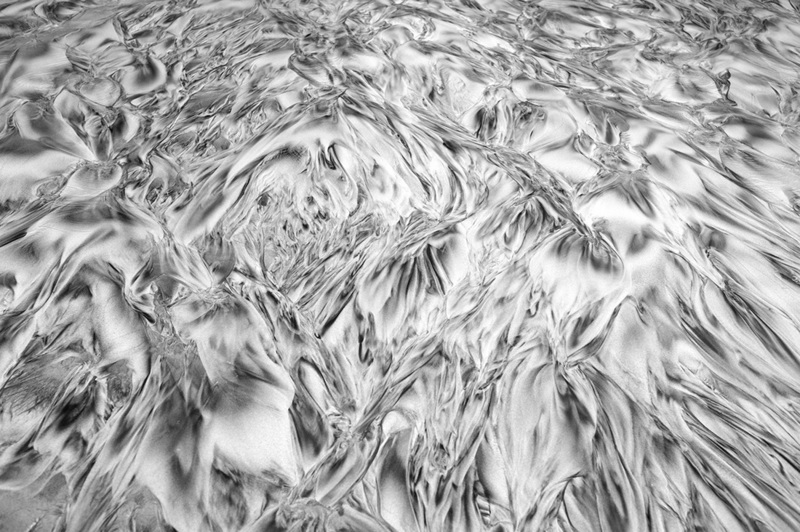 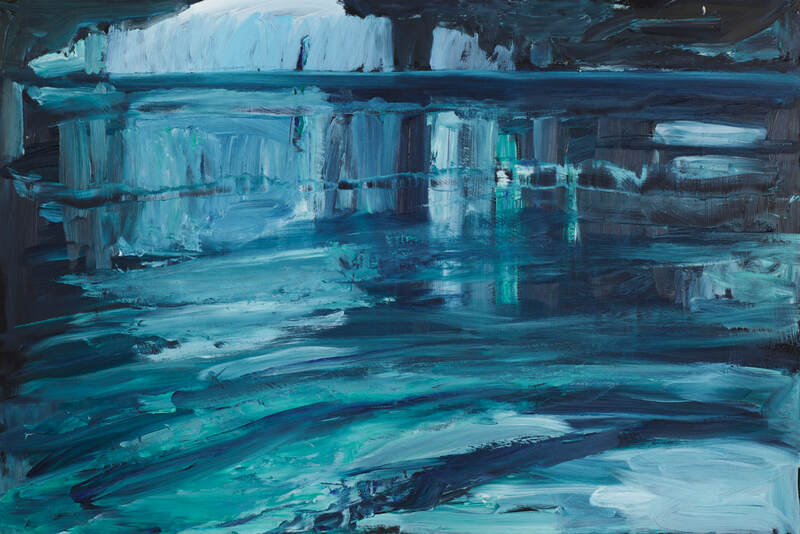 The interplay between the refracted water surfaces and human form make for a body of bold visual studies. 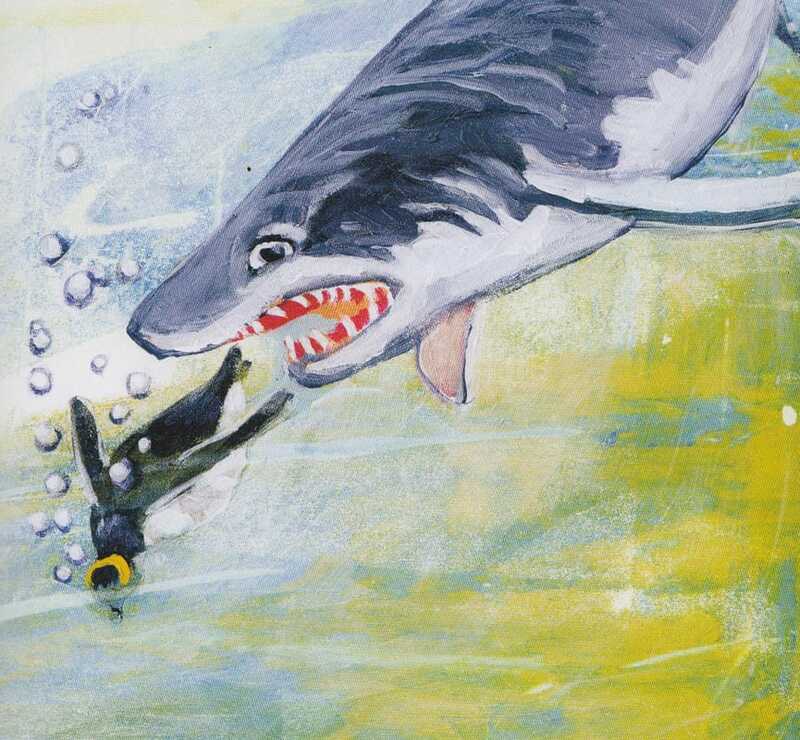 Sharkie Smartie children's book and exhibition of original illustrations. 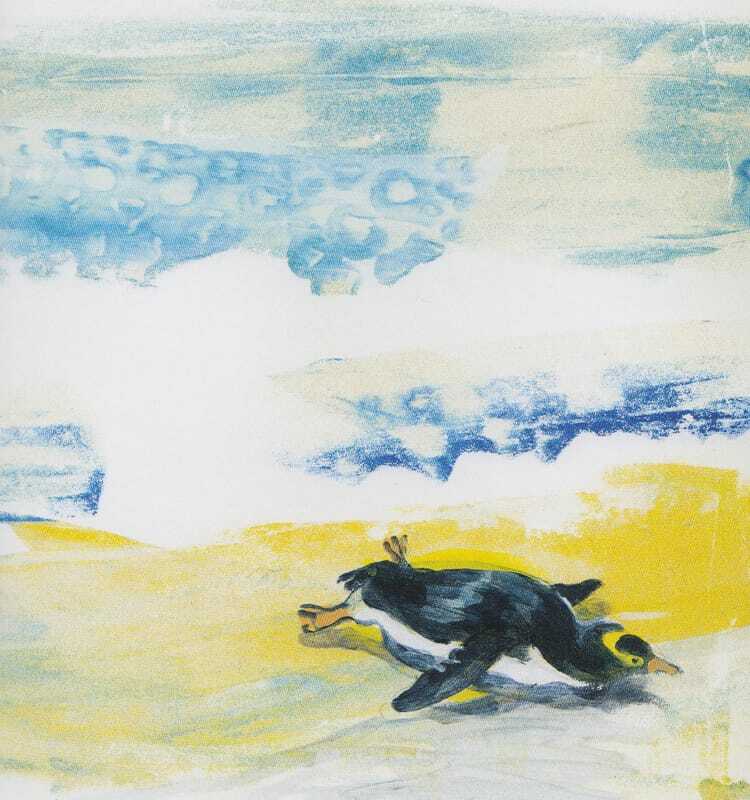 Inspired by the true story of a yellow-eyed penguins unlucky run in with a shark and it's journey to recovery at David and Wilma Mckay's reserve at Cape Saunders, this exquisitely illustrated book celebrates the bright-eyed inhabitants that live on the shores of the Otago Peninsula and the caring people that work to protect them. 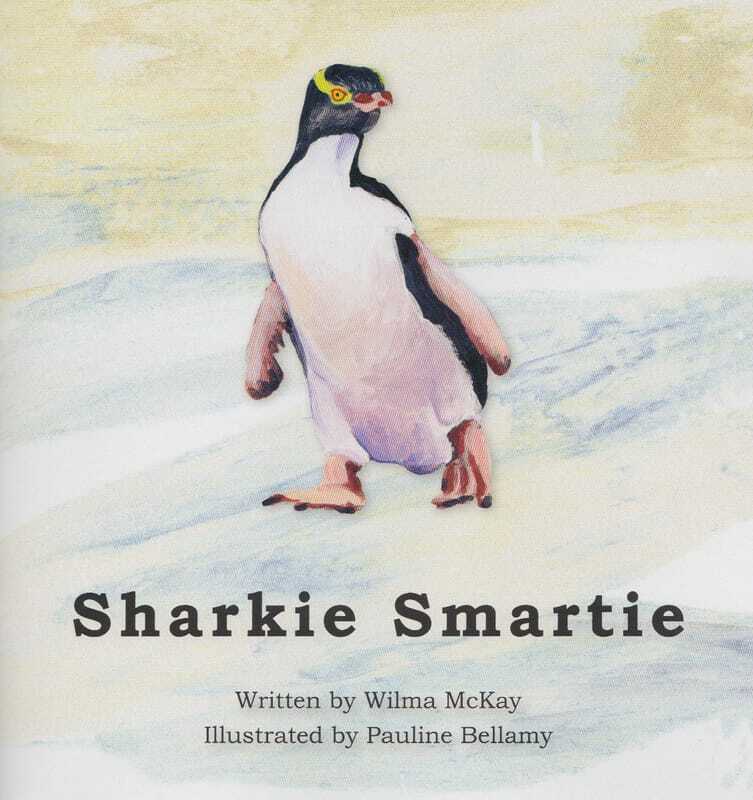 At age 17, Sharkie was thought to be one of the oldest yellow-eyed penguins to be living on the Otago Peninsula. Belonging to the Megadyptes Antipodes species, one of the rarest and most threatened penguin species in the world, they are endemic to southern New Zealand and the sub Antarctic Islands. Only 202 breeding pairs remain in mainland colonies and many things including disease, climate change and commercial fishing continue to threaten these unique marine animals. 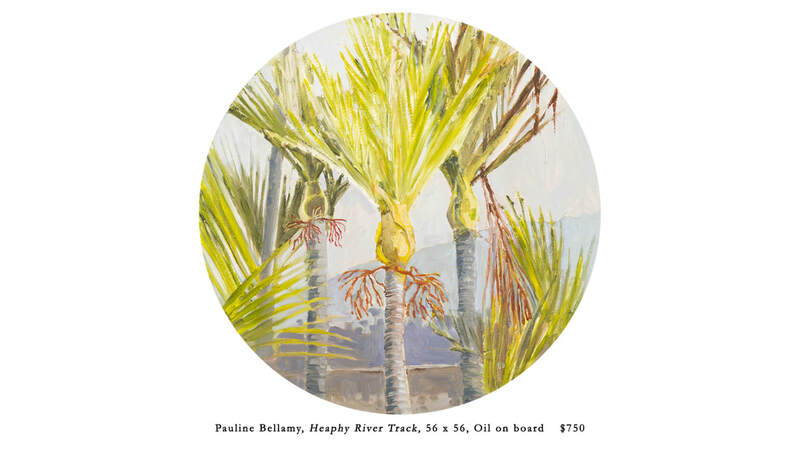 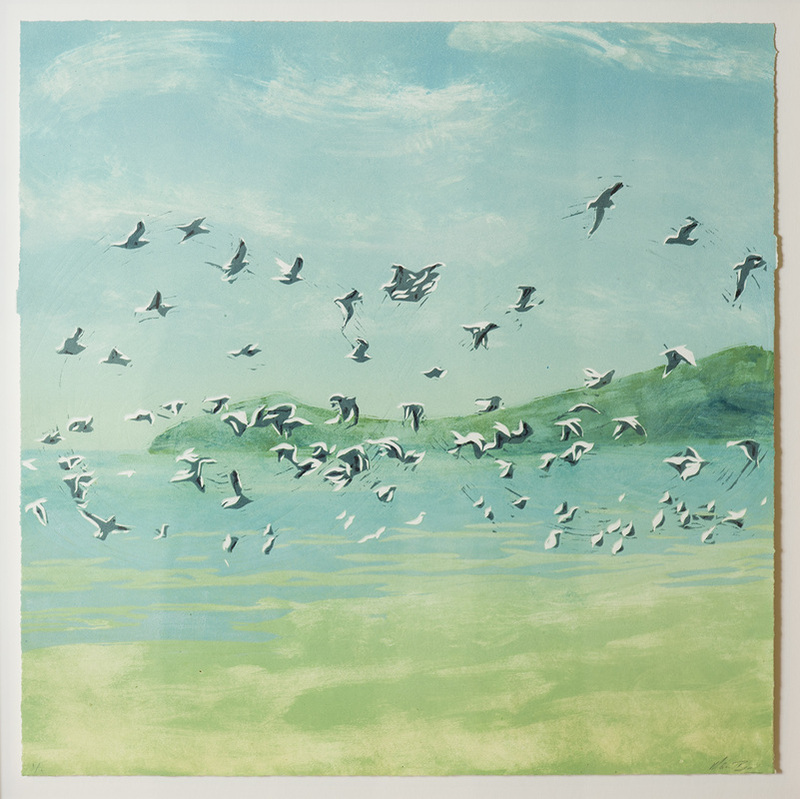 The book launch will coincide with the opening of a revolving exhibition of wildlife etchings and paintings by Pauline Bellamy which will be on display until Sunday 29th of January 2017. Sharkie Smartie is available to purchase from the gallery for $20. 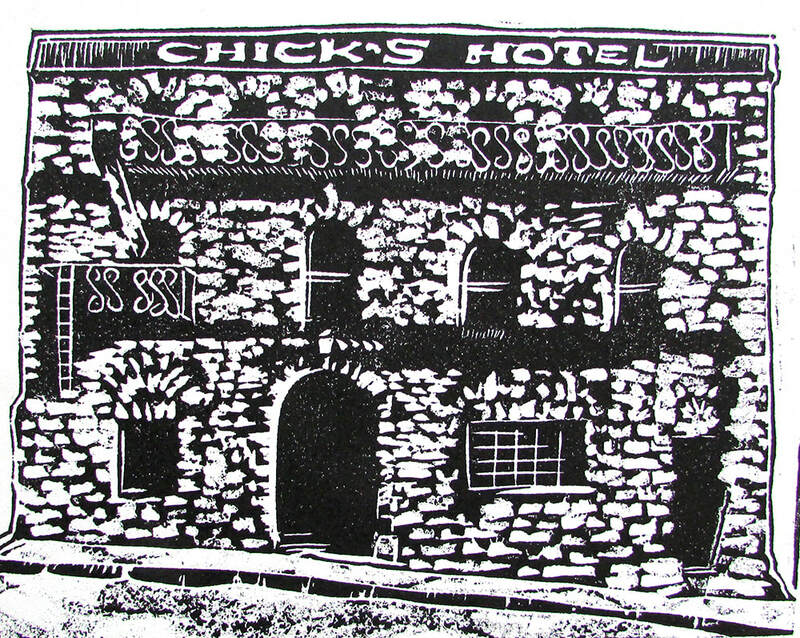 The iconic 135+ year old St Bathans Billiard Saloon in the heart of Central Otago has long been a creative sanctuary for the family and many other artists. 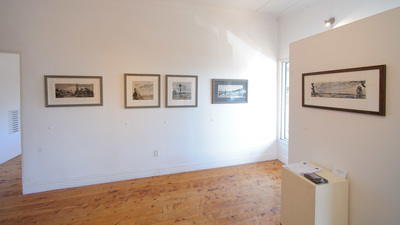 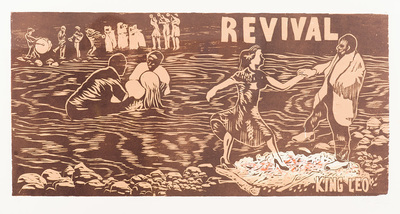 The Saloon and its surroundings are brimming with creative potential, which has informed new work in a range of media for this group exhibition. 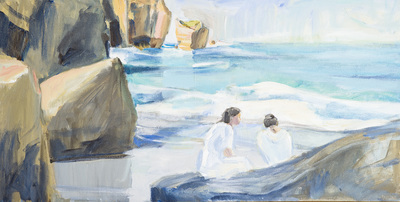 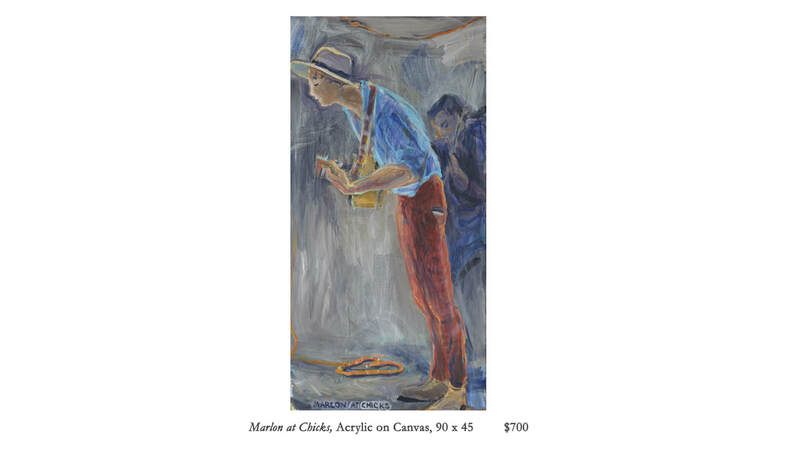 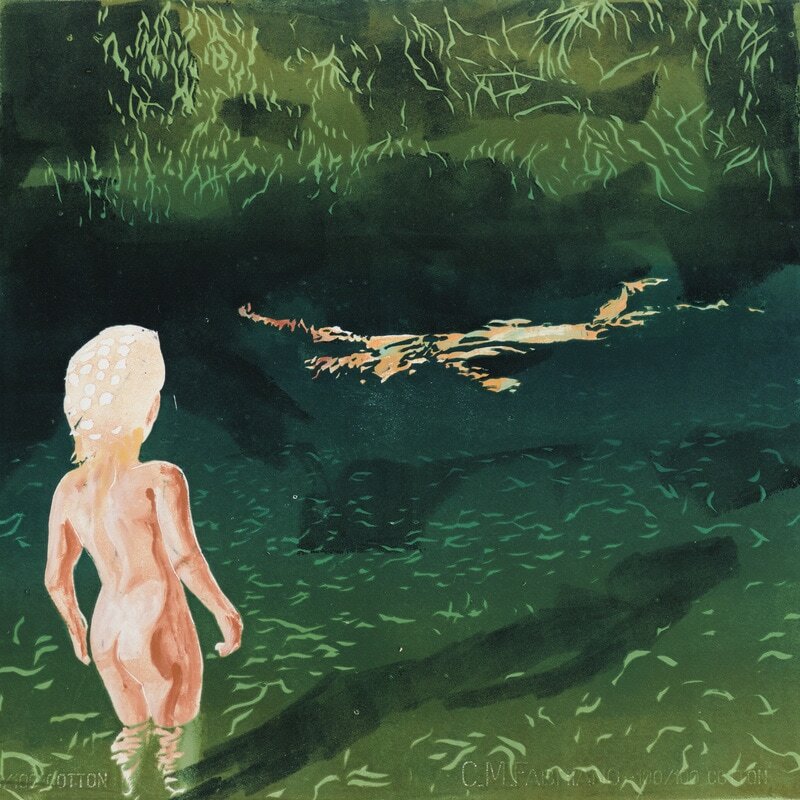 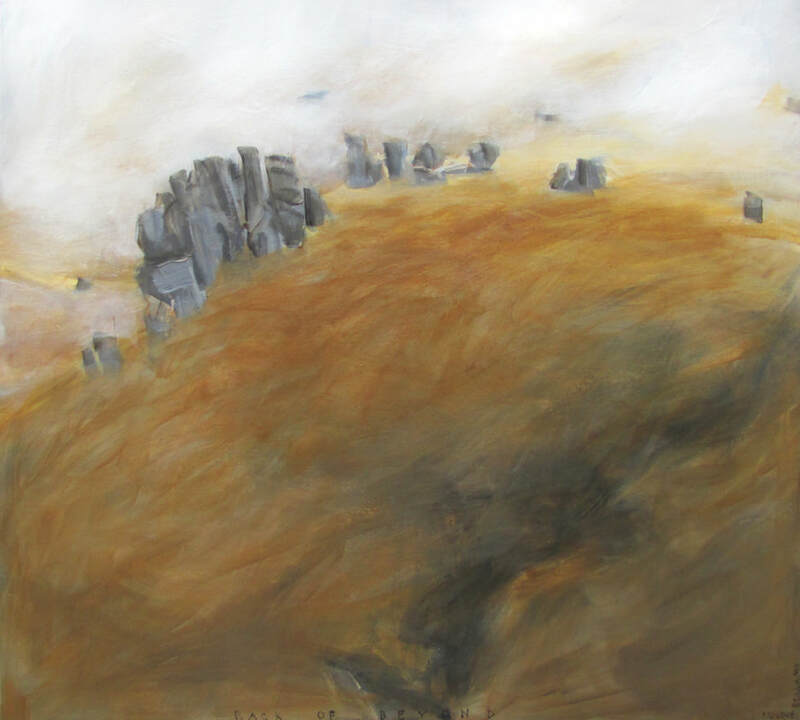 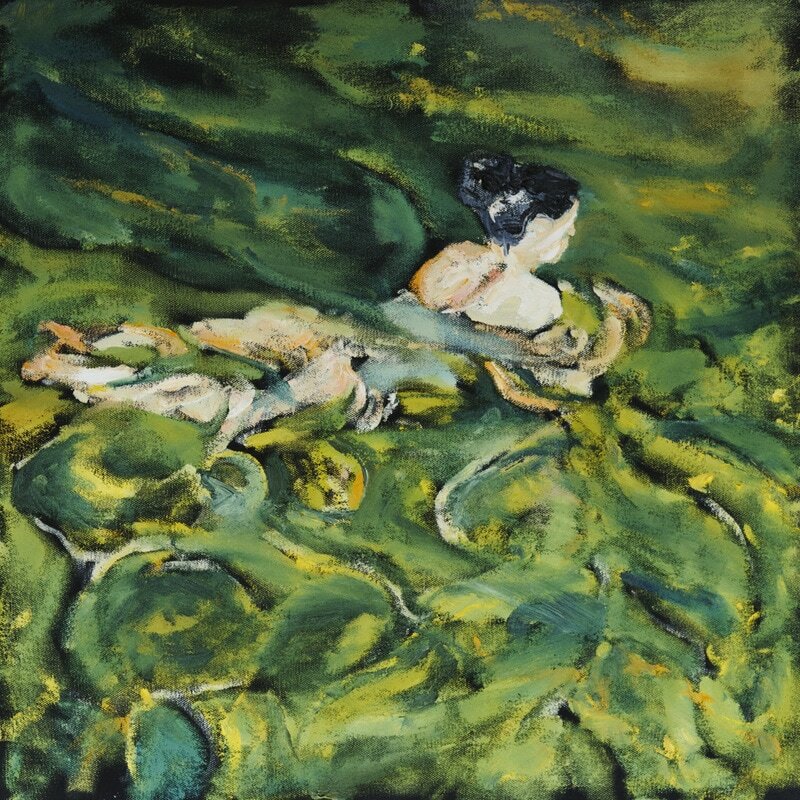 Wonder Word is an exhibition of new paintings produced by Emma during her time as The Lavinia Winters Fellow at New Zealand Pacific Studios earlier this year. 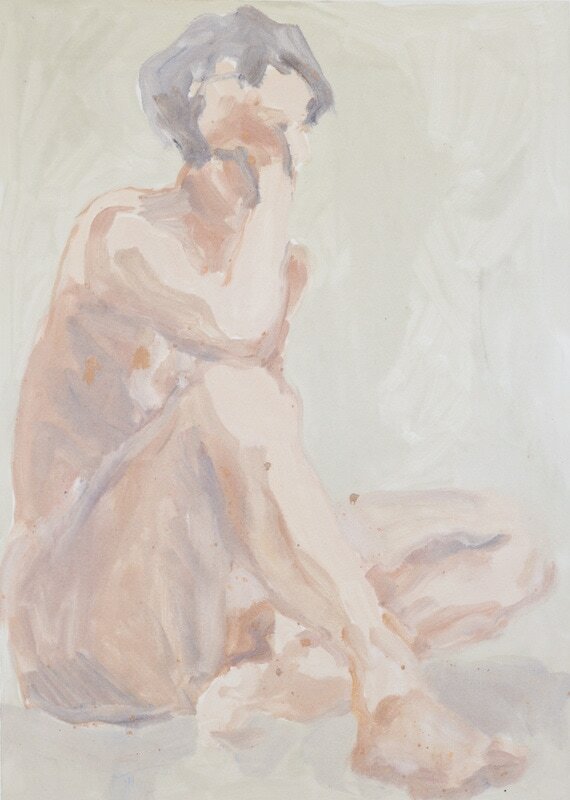 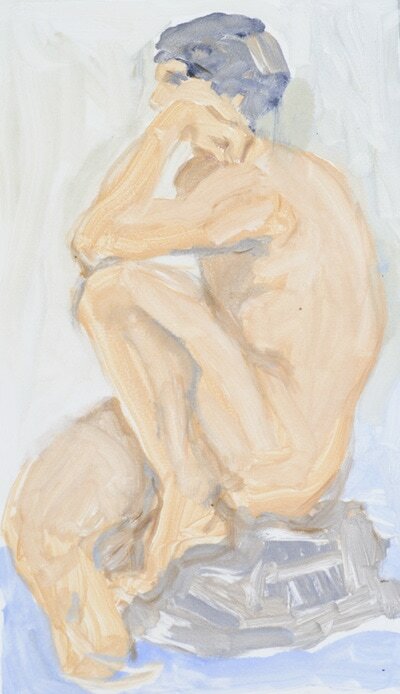 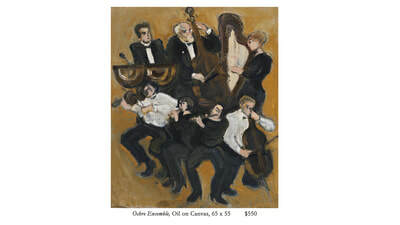 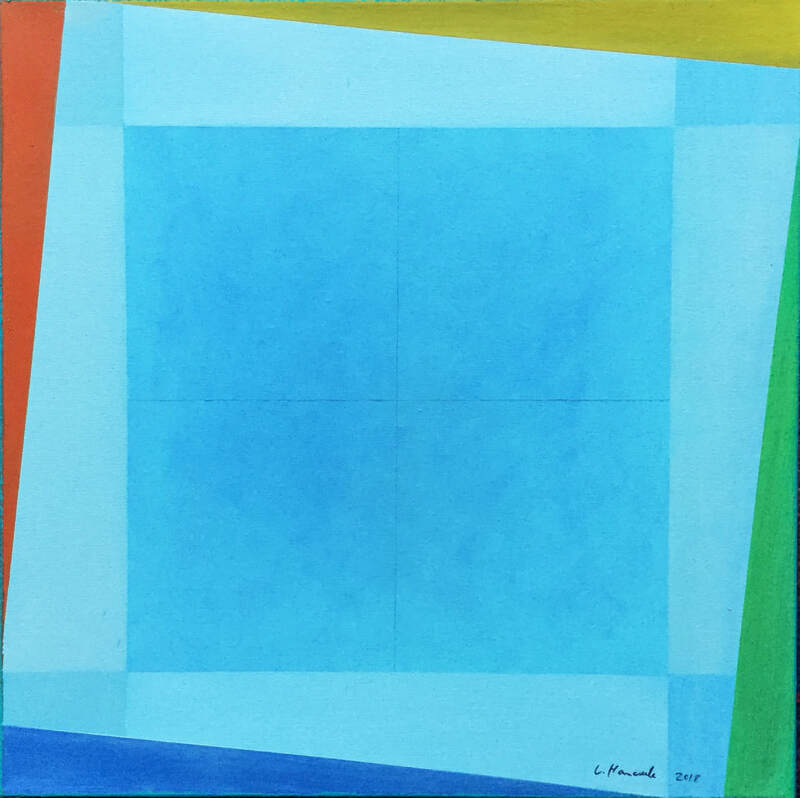 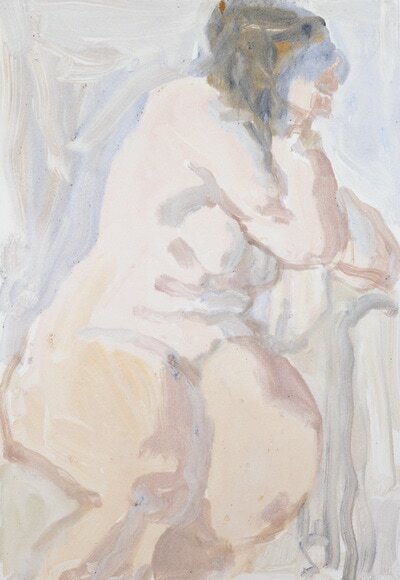 The five paintings featured in this exhibition were created in response to the philosophical text The Ethics of Ambiguity by the French philosopher Simone de Beauvoir. Hinterland / Revival is an exhibition of cover design collaborations between two local musicians and artists Pauline Bellamy and Manu Berry. 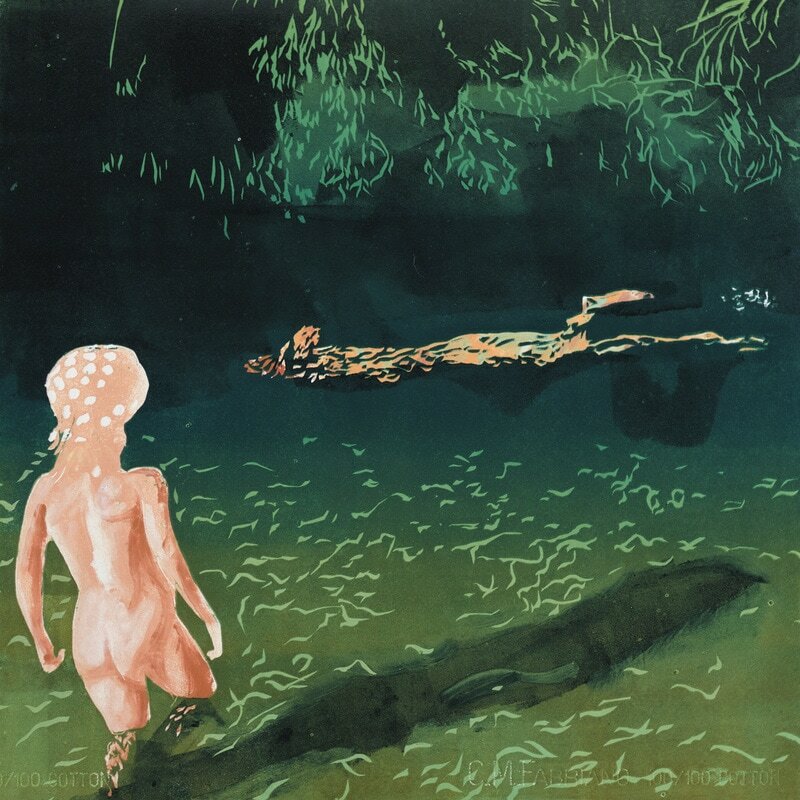 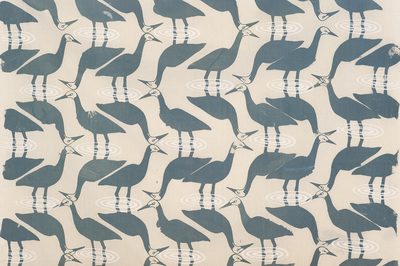 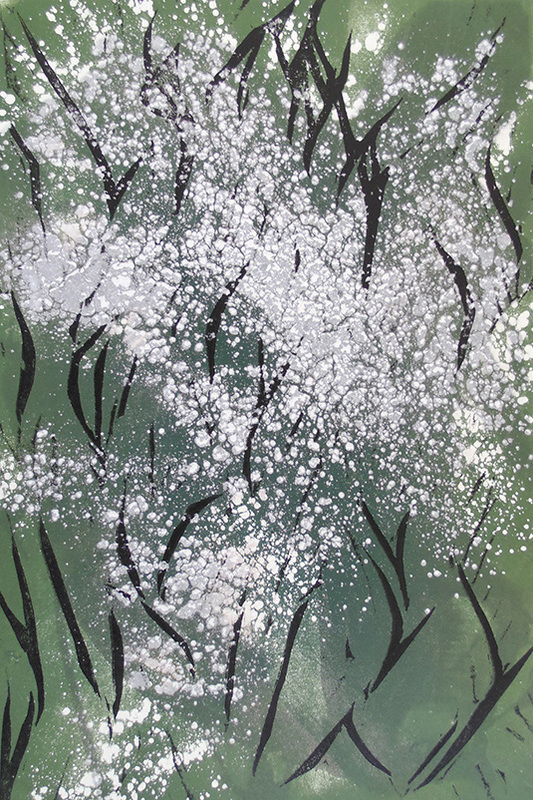 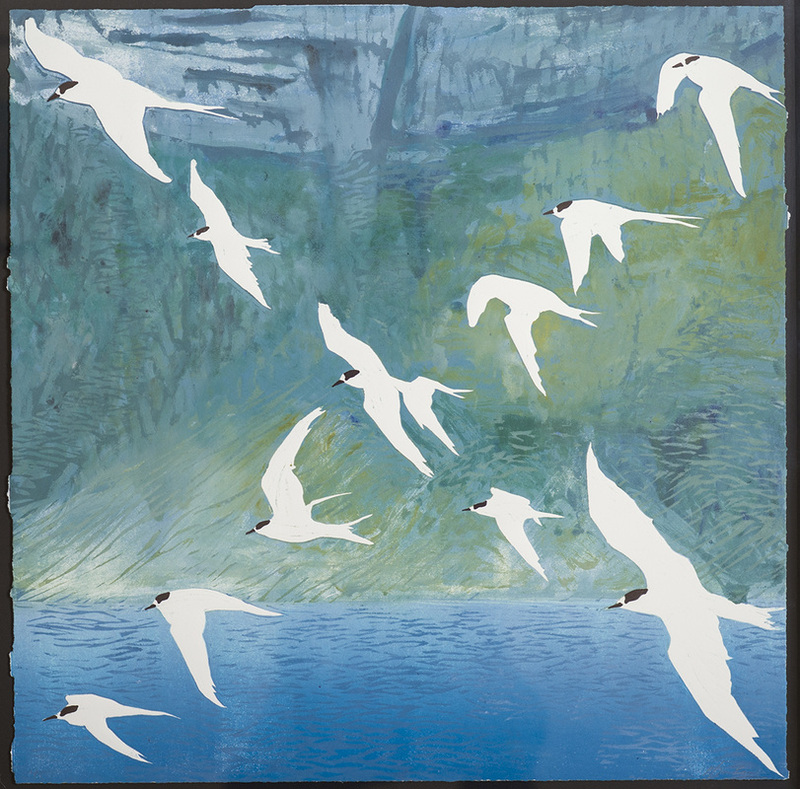 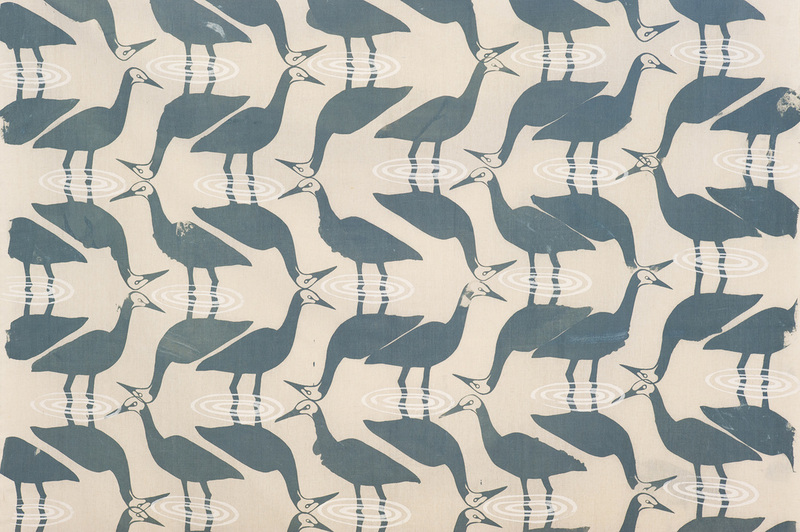 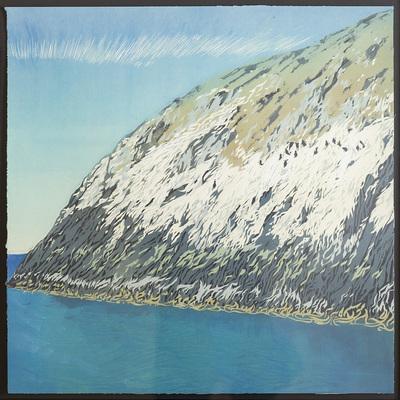 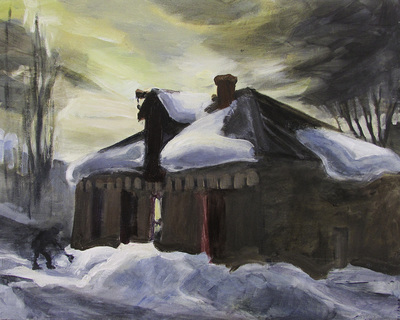 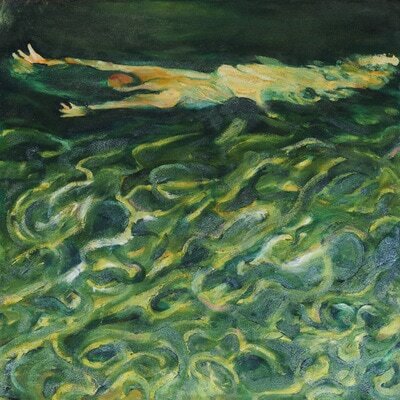 Pauline Bellamy created the cover artwork for 'Hinterland' by Bill Morris. Manu Berry completed the cover art for King Leo's new blues album 'Revival.' King Leo is a veteran Blues musician who combines the classic sounds of Chicago, Texas and New Orleans with personal songwriting to bring high-intensity Blues to stages across New Zealand. Our coastal landscapes shape and define our identity as Dunedinites. From the giant cliff-scapes of the Otago Peninsula that tirelessly battle the brutal southern Ocean, to the tranquil food baskets of the north coast, our headlands are rich with diversity and character. 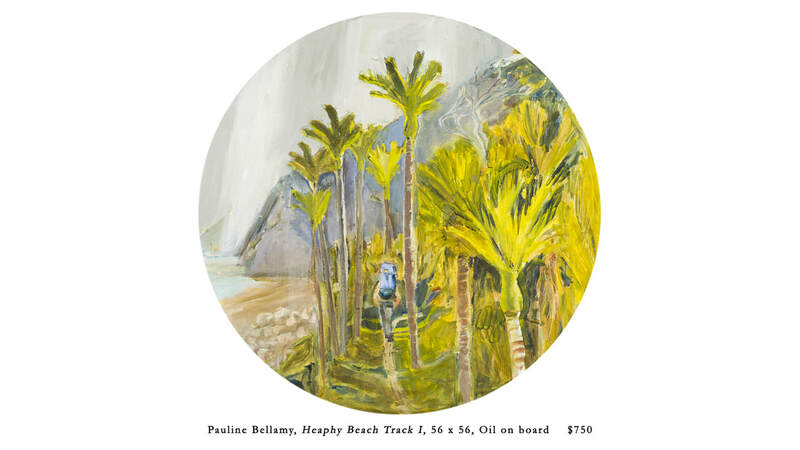 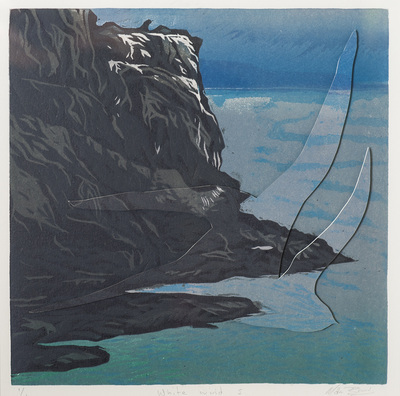 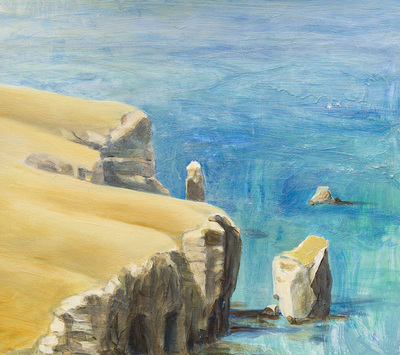 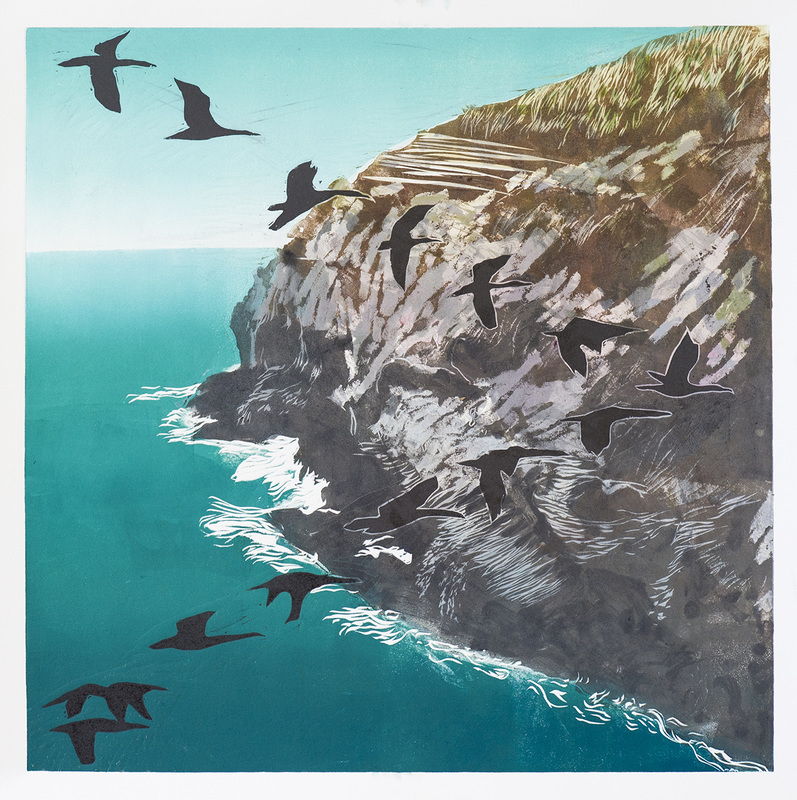 Pauline Bellamy and Manu Berry have long been enamoured by Dunedin’s classic coastal icons and incorporated their imagery into their work, this exhibition sees them take one step closer to the shore to listen for the stories that these stunning locations have to tell. 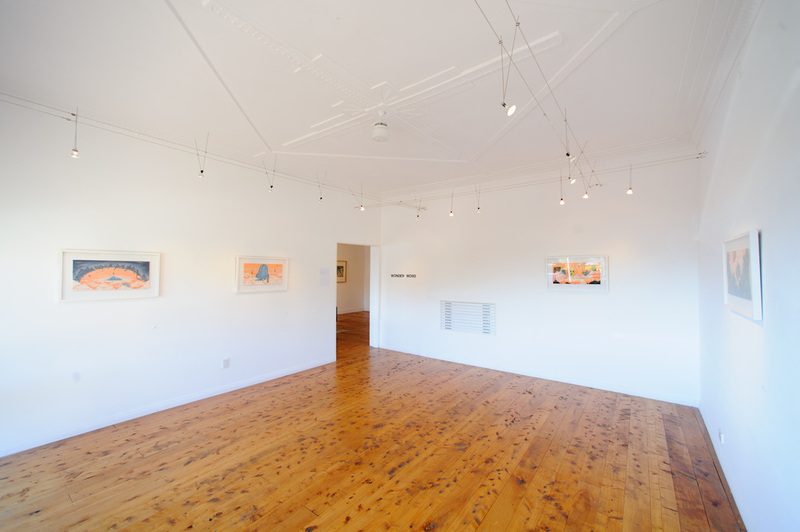 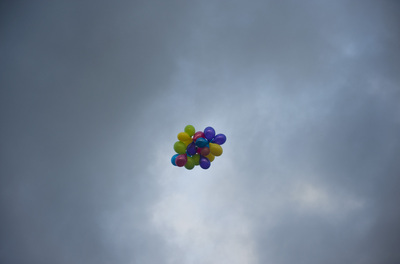 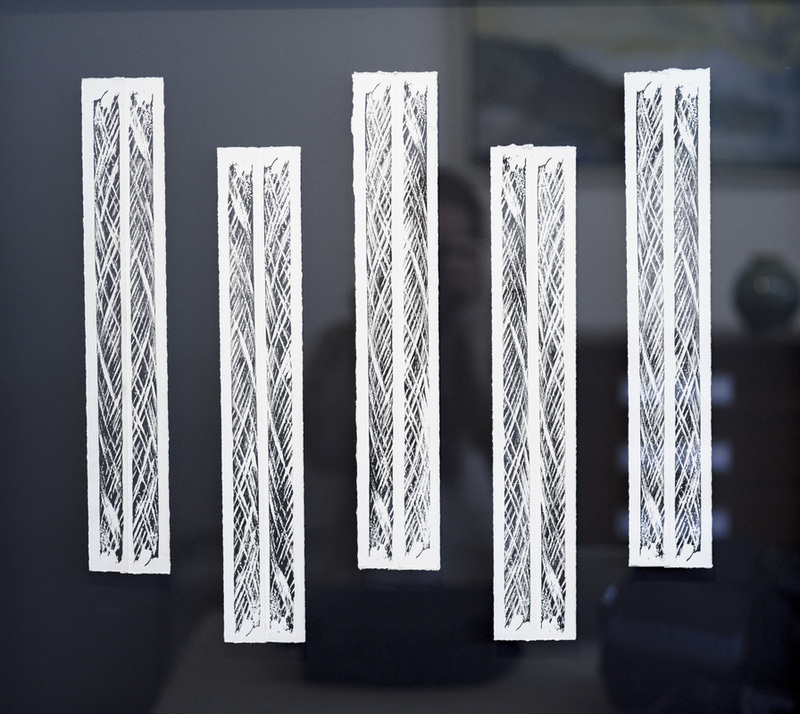 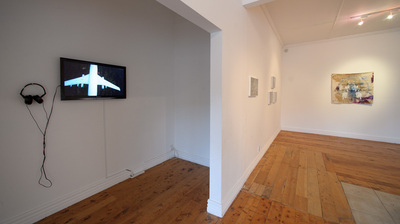 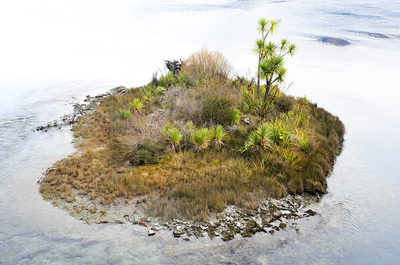 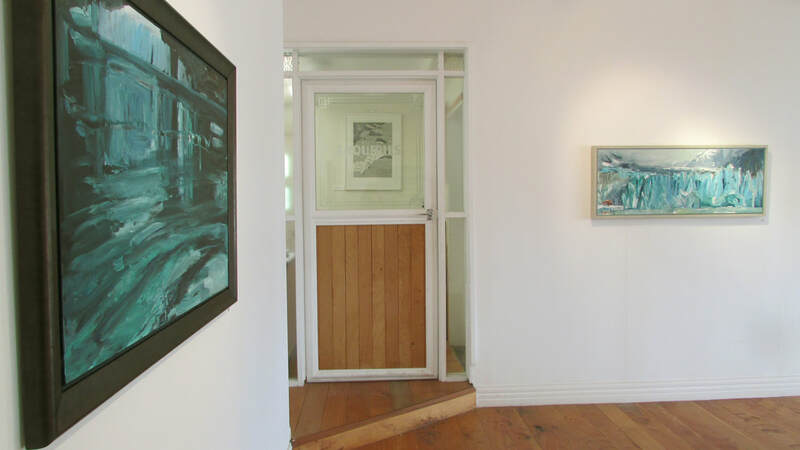 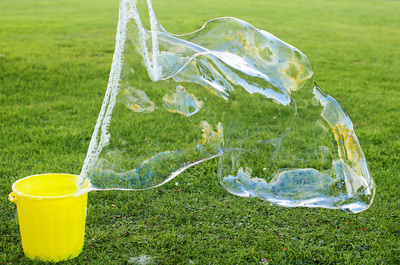 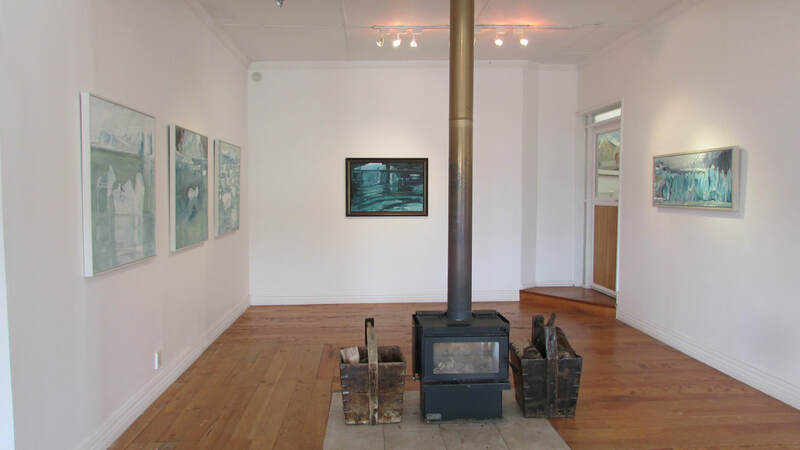 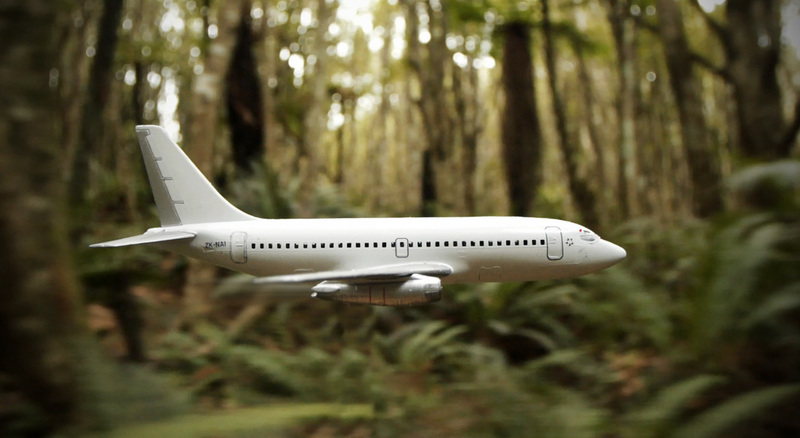 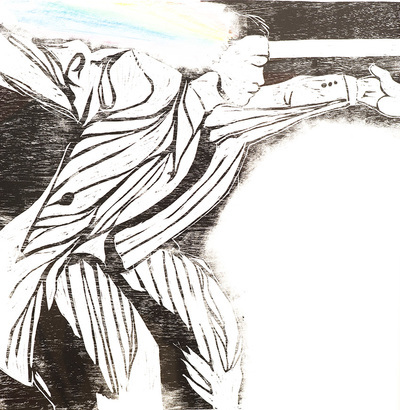 The William Hodges Fellowship is an art residency for visual artists from around New Zealand. 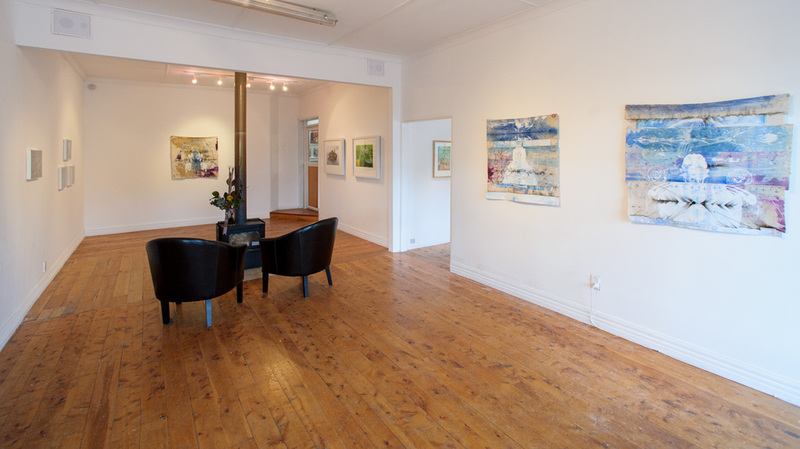 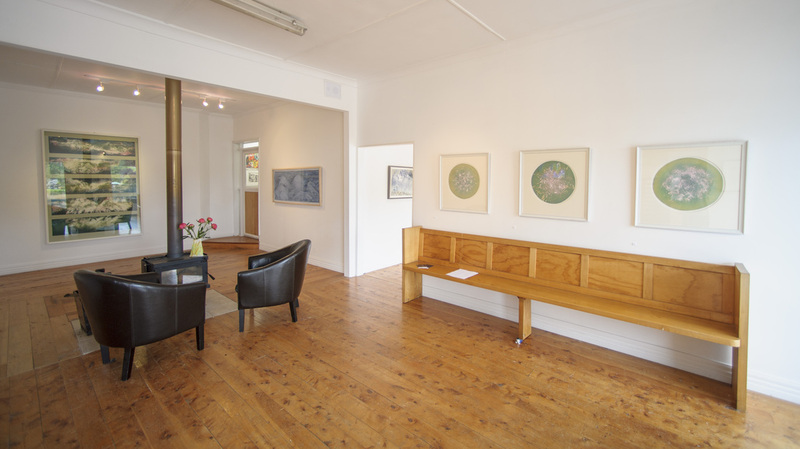 Located in Invercargill, it is administered by the Southland Art Foundation and residents are housed in historic Burwell House. 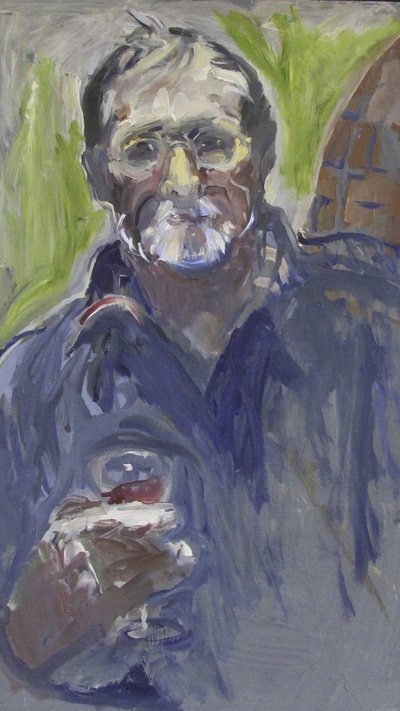 Max Bellamy was the WHF resident during 2011. 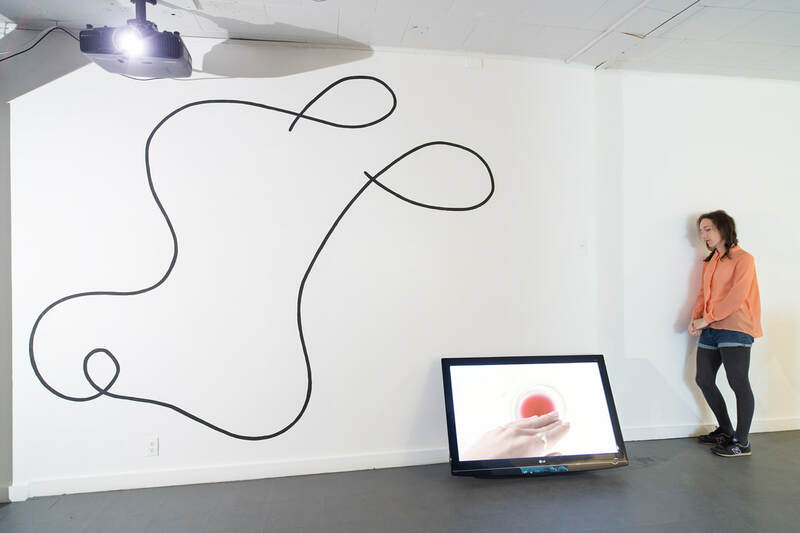 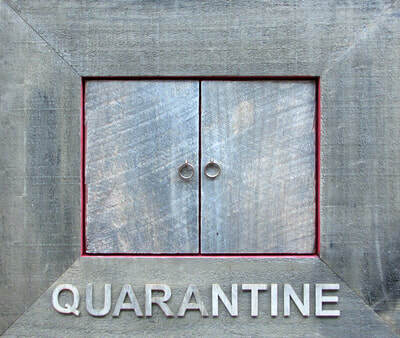 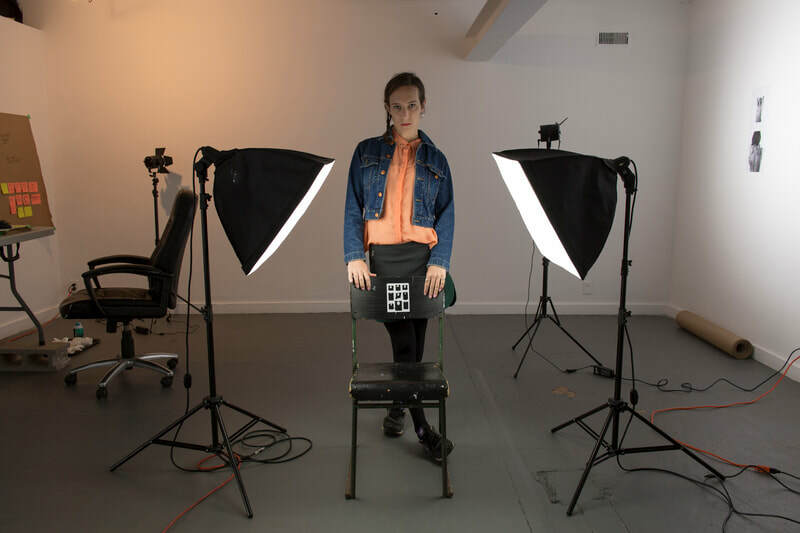 During his time he created a series of five new video loops that made up his exhibition Borrowed Time, two of these videos are included in this show. 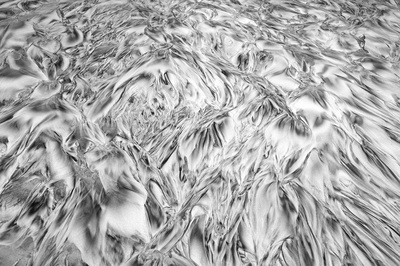 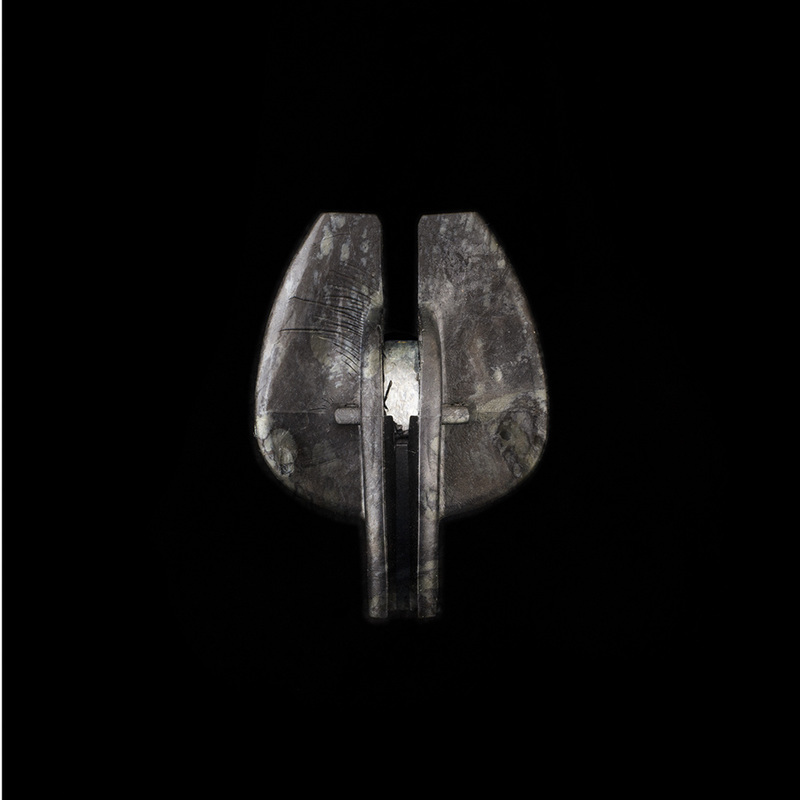 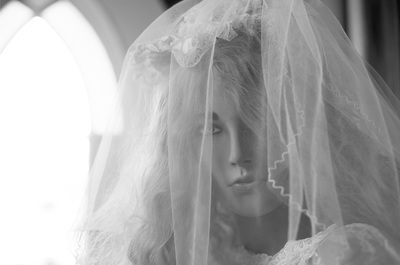 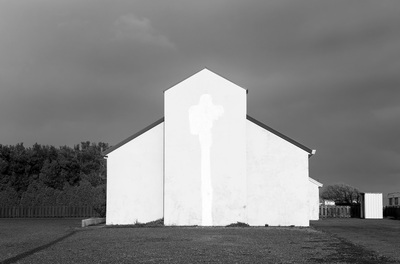 Alongside are several photographs that served as cornerstones in the process of making the video loops. James Robinson was the WHF resident in 2013. 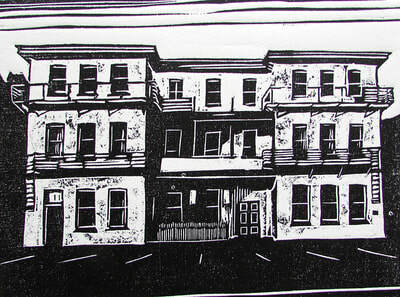 The disused and dilapidated hospital wing adjacent to the resident accommodation proved to be a fruitful studio. 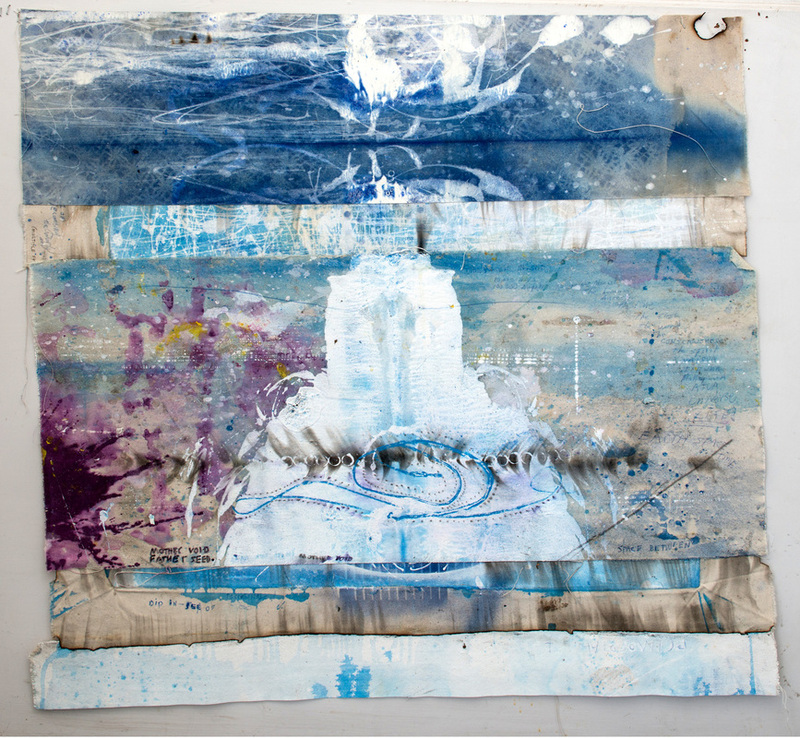 James created a number of large canvases and works on paper that culminated in the exhibition Paintings From the End of the World. 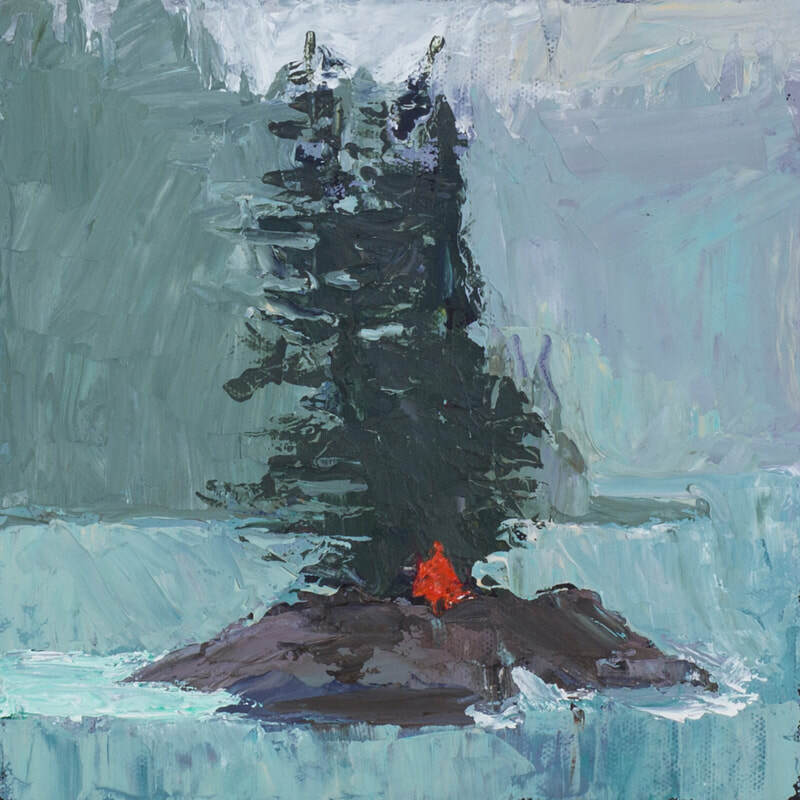 The paintings included in this show represent a period of making that was in touch with a reflective, meditative aspect of his character. 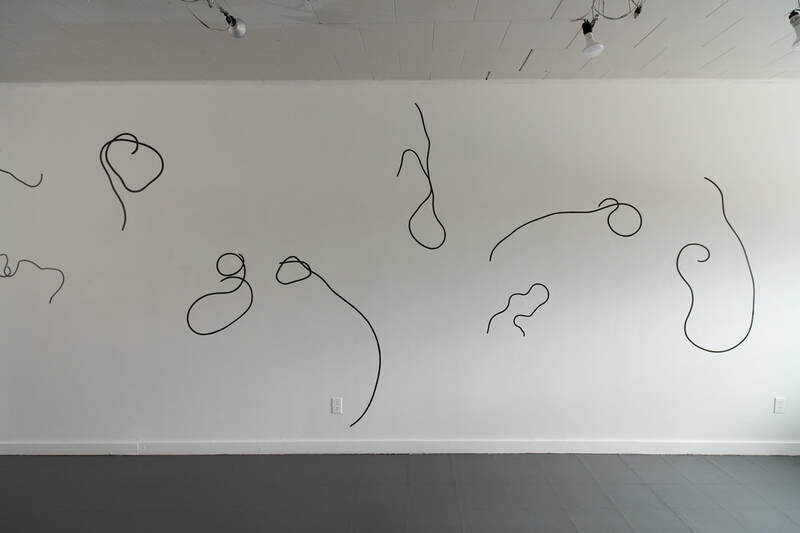 This exhibition brings together two artists whose methodologies appear disparate, yet when partnered in a space reveal that they draw on similar ideas. James’s lively canvases seem to effortless condense scale; vast cosmic truths sit equal alongside whisper quiet personal inquisitions. 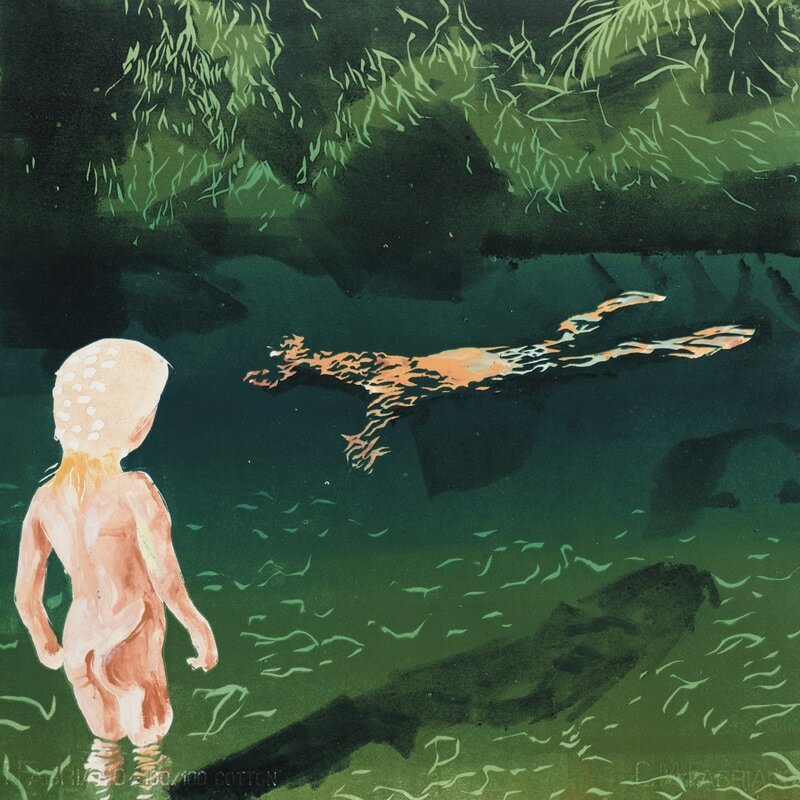 Max strips his visual symbols bare and bends our understanding of scale with an illusory stroke, his technical rigour and glossy finishing create a sense of distance, objectivity and longing.